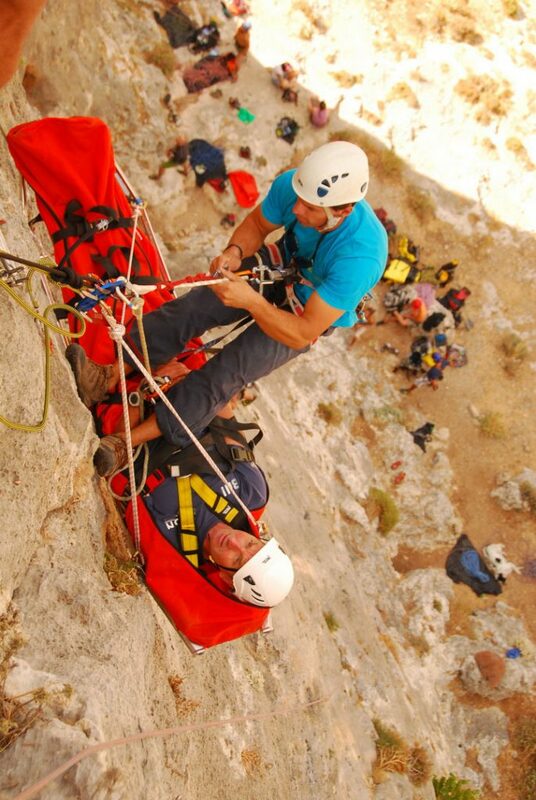 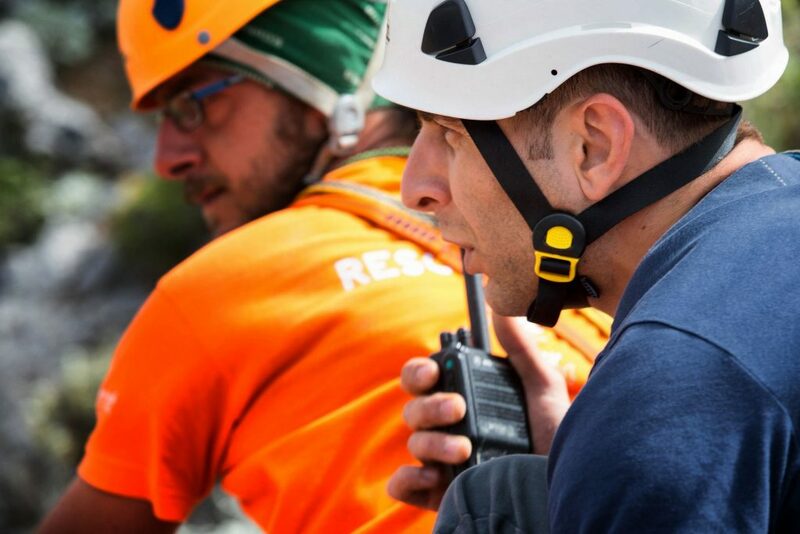 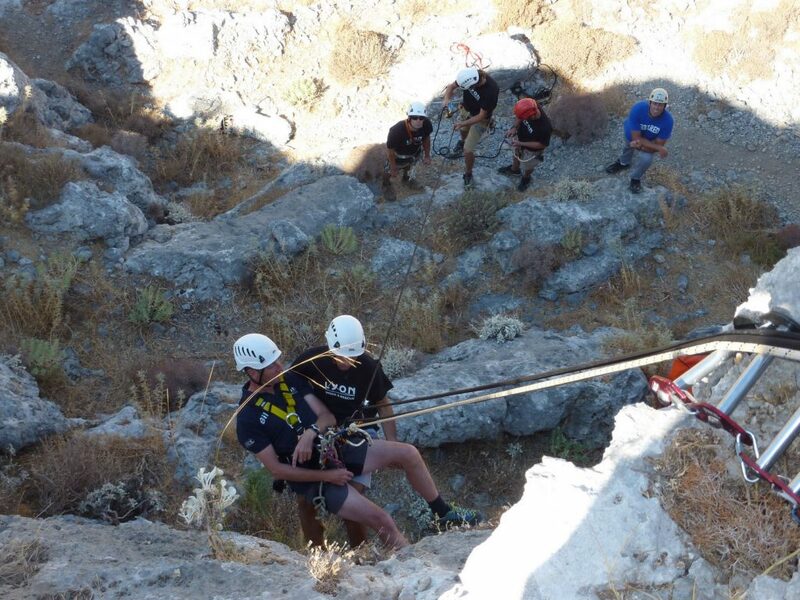 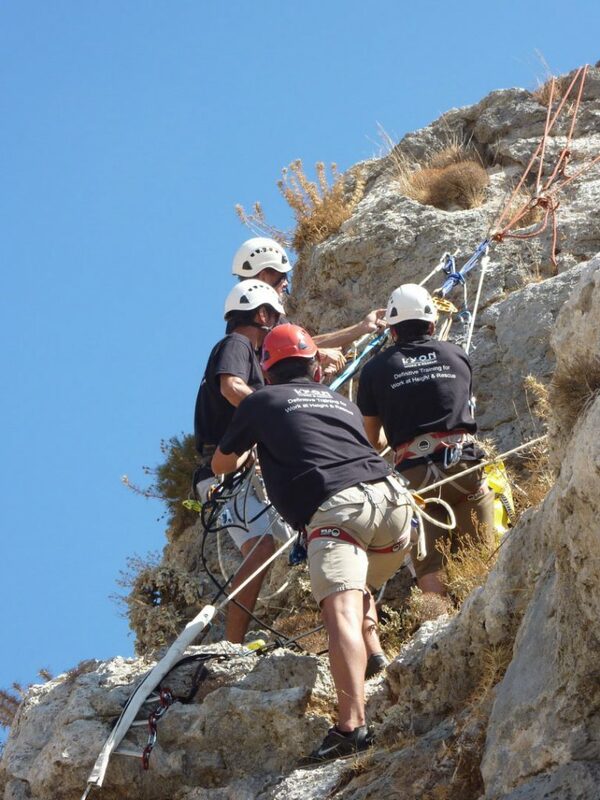 Organized by instructors of the Italian CNSAS and the French National Police and Rescue Body. 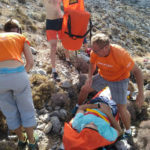 With Dr. Alexandra Koukoutsi, Greek Doctor with specialty in High Altitude Medicine and Coach for High Altitude Expeditions, member of UIAA and EFR First Aid Instructor. 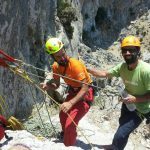 With Dr. Antonio Prestini, Doctor and Mountain Guide, member of CNSAS (Italy). 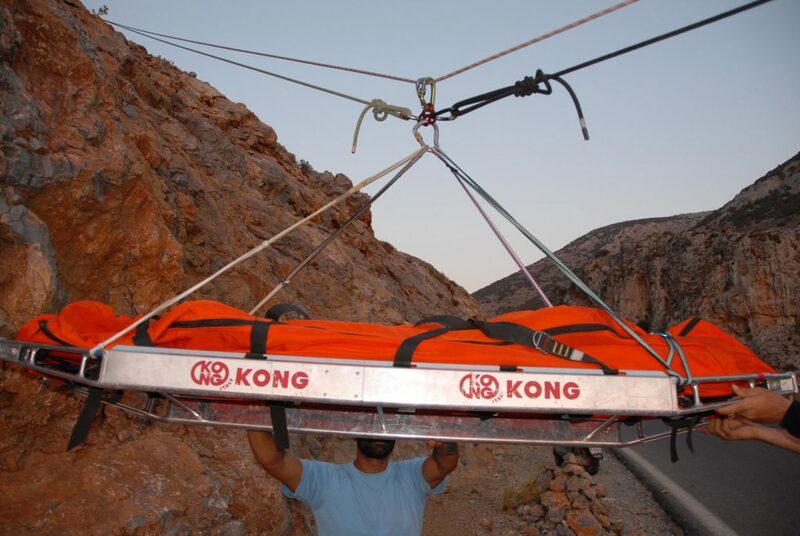 By Bill Batson and Mark Davies, crew of Lyon Equipment, UK. 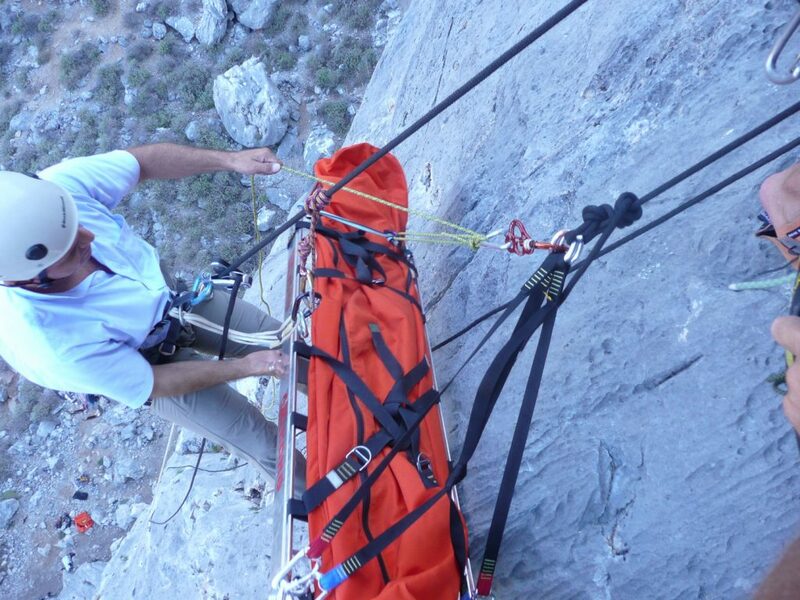 Bill Batson (Lyon Equipment Training Manager and rescue specialist). 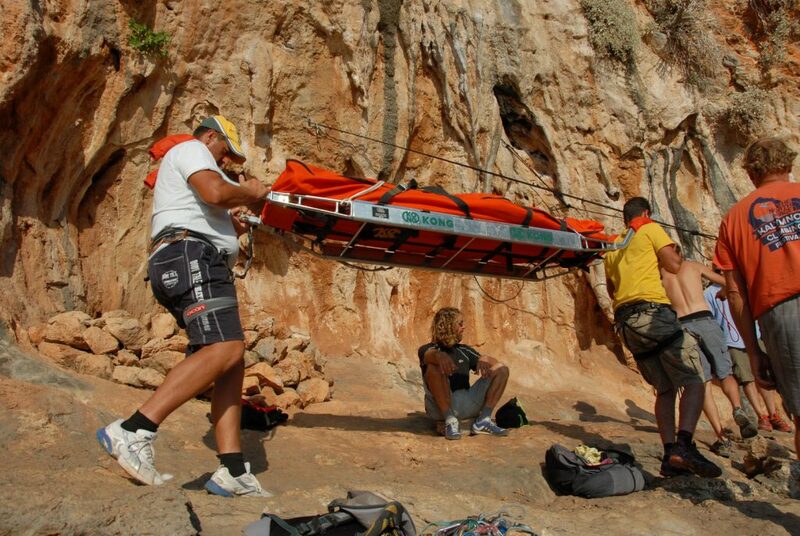 Mark Davies (Lyon Equipment Trainer and Consultant). 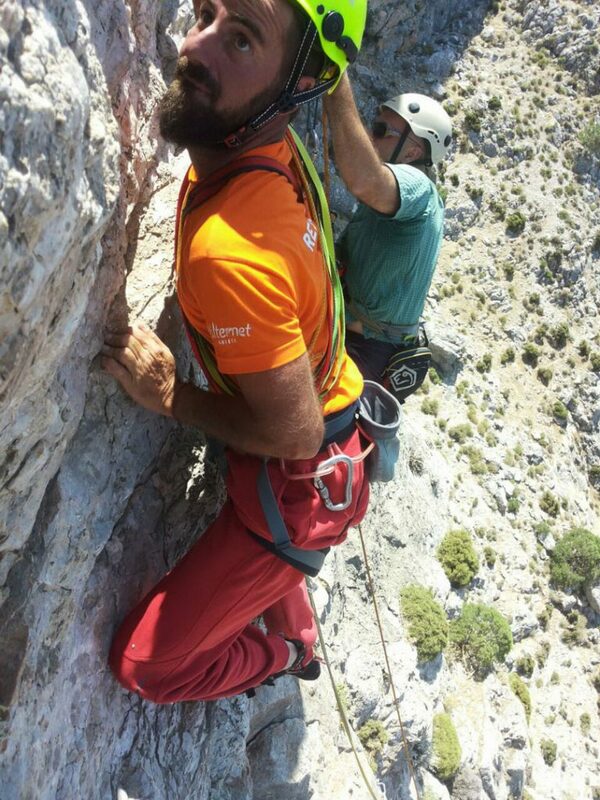 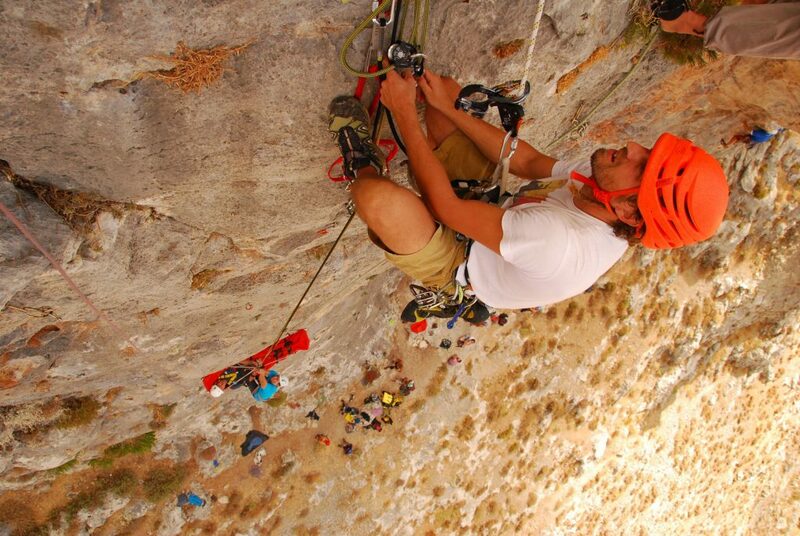 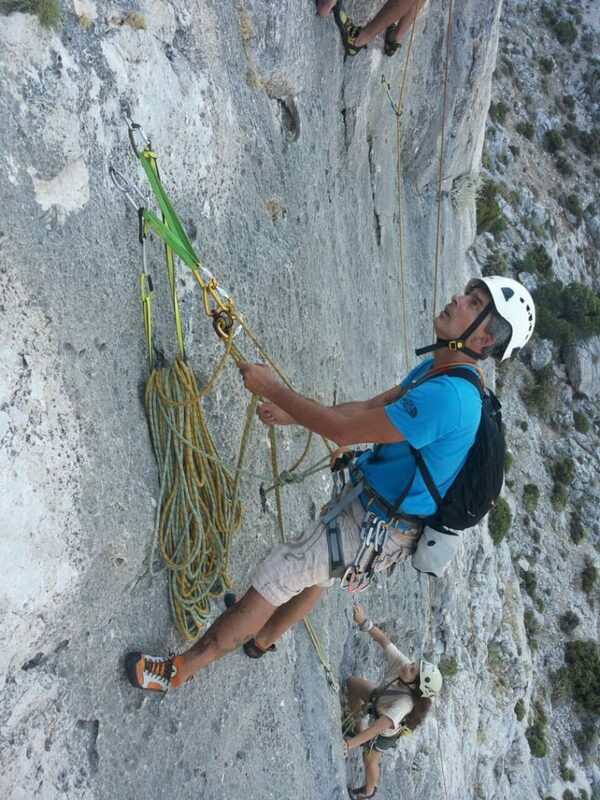 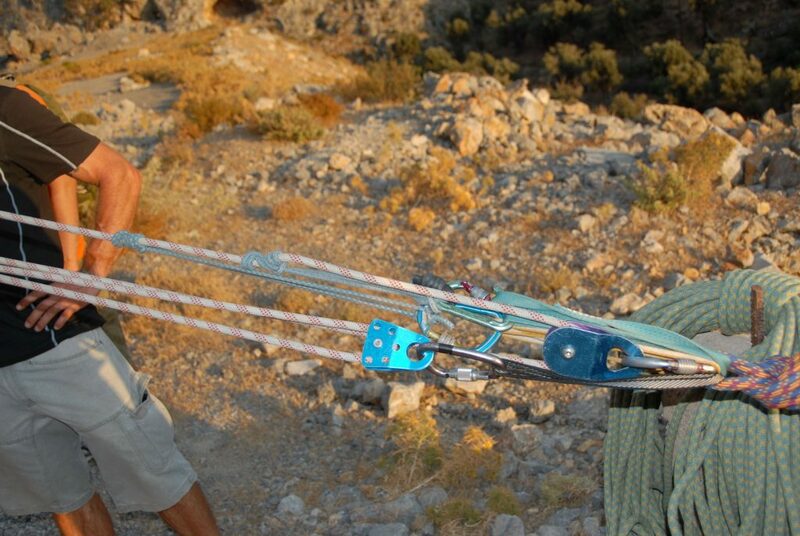 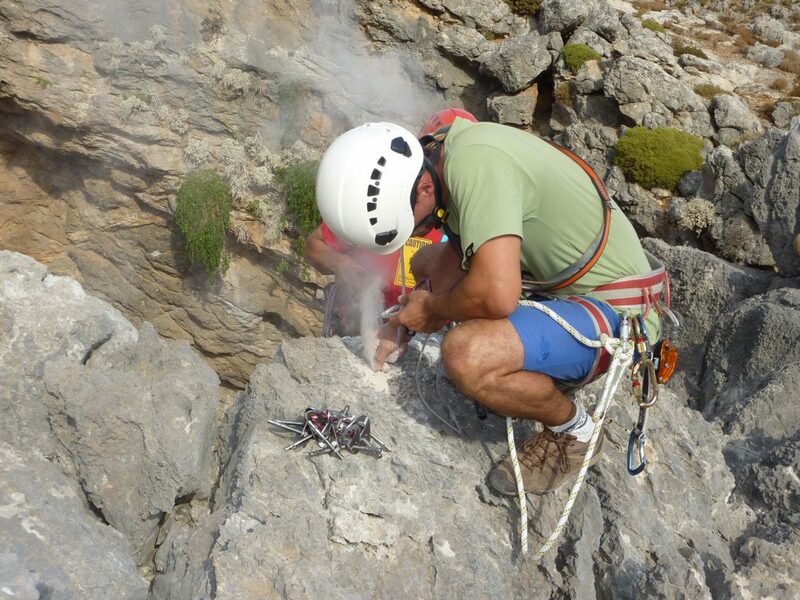 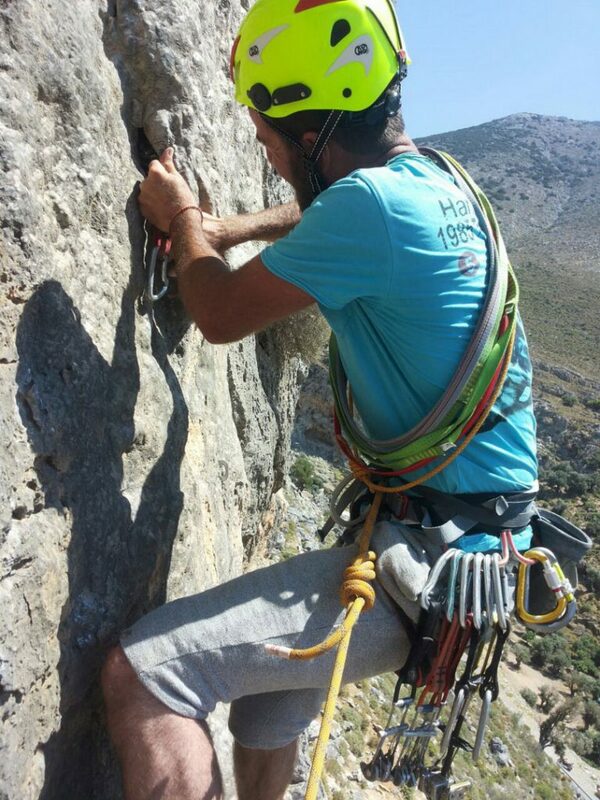 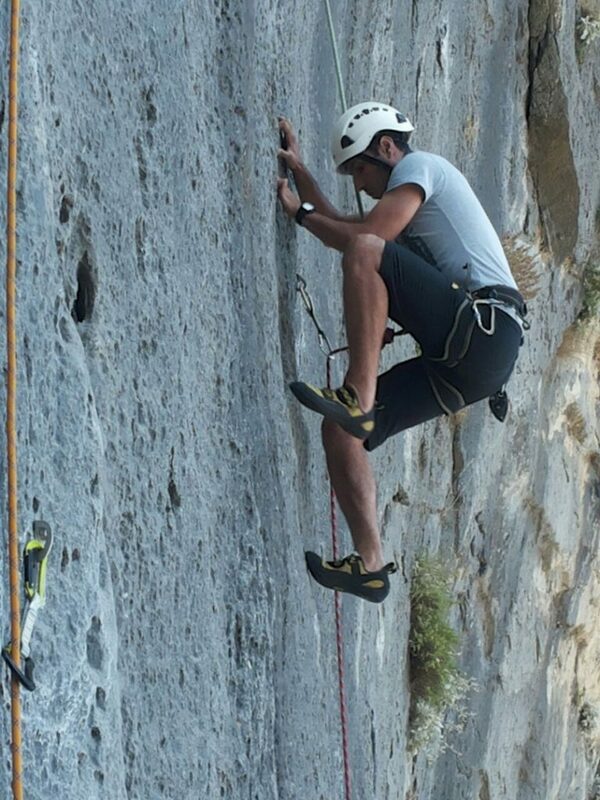 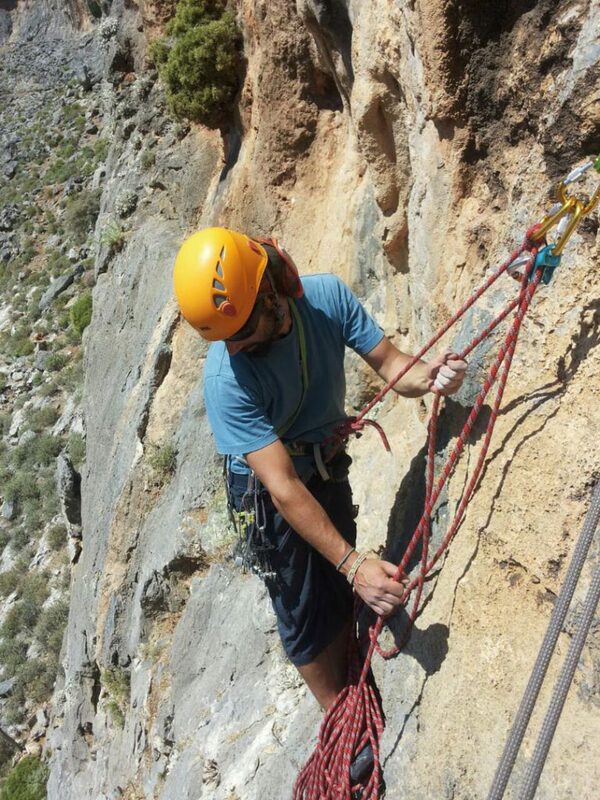 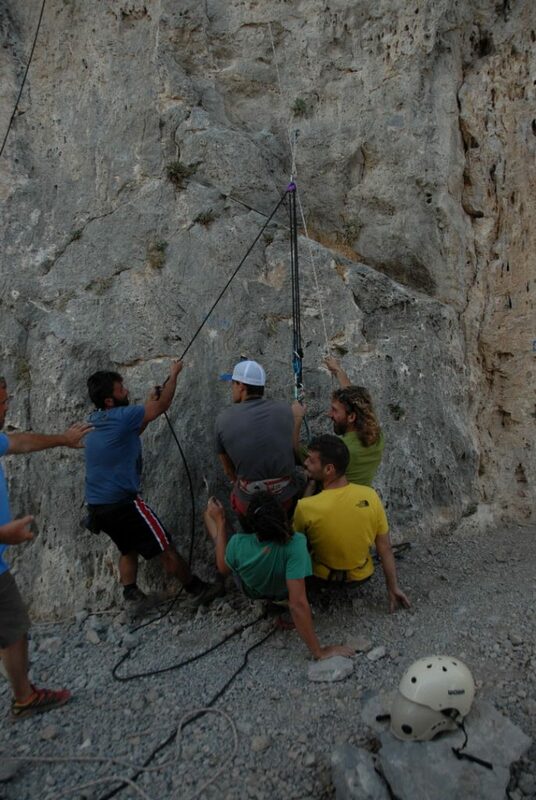 By a Mountaineering Instructor of the Greek Federation of Mountaineering and Climbing, Mr. Antonis Antonopoulos. 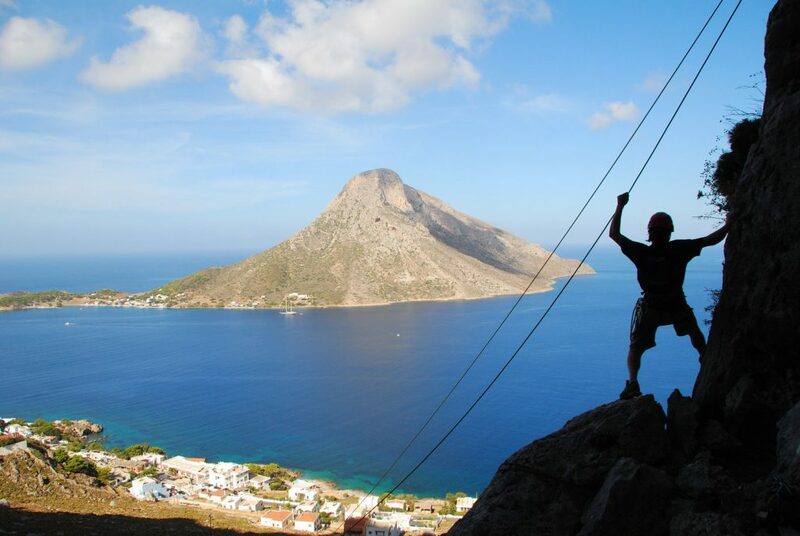 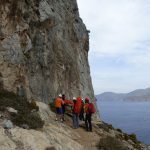 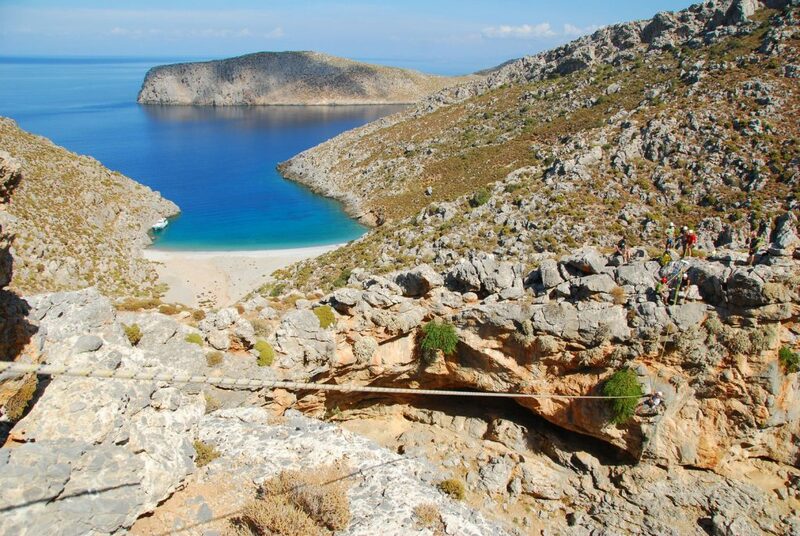 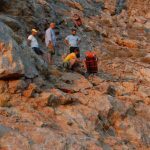 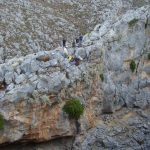 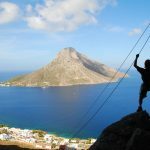 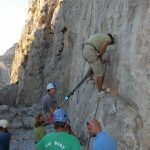 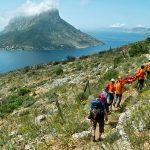 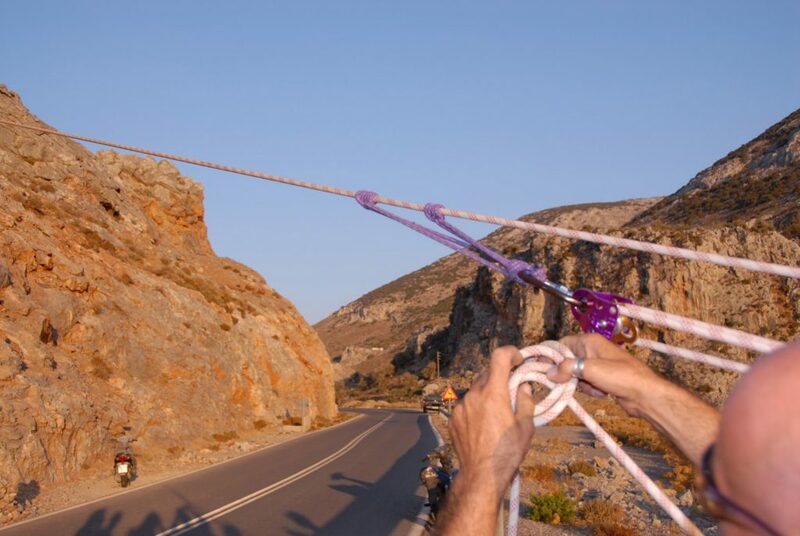 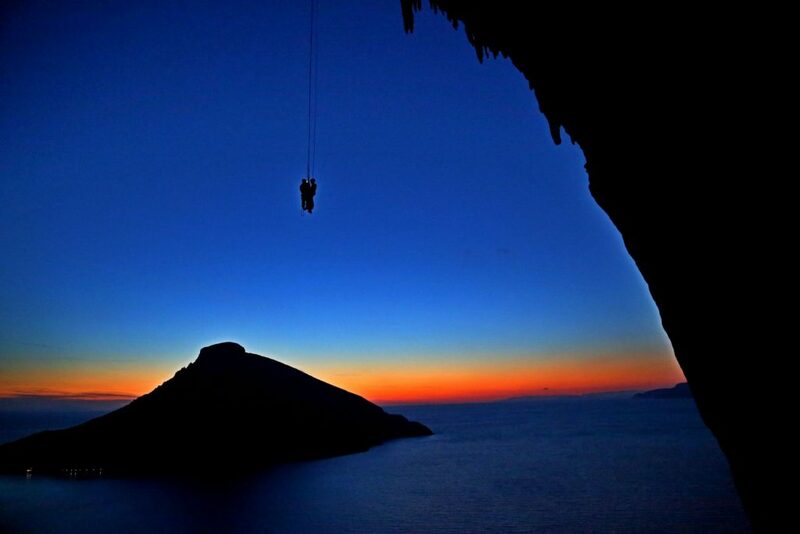 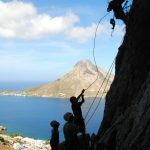 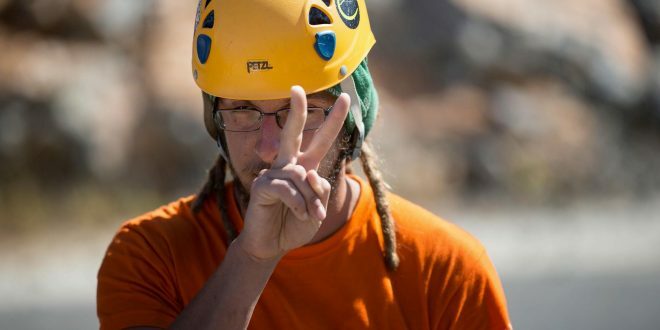 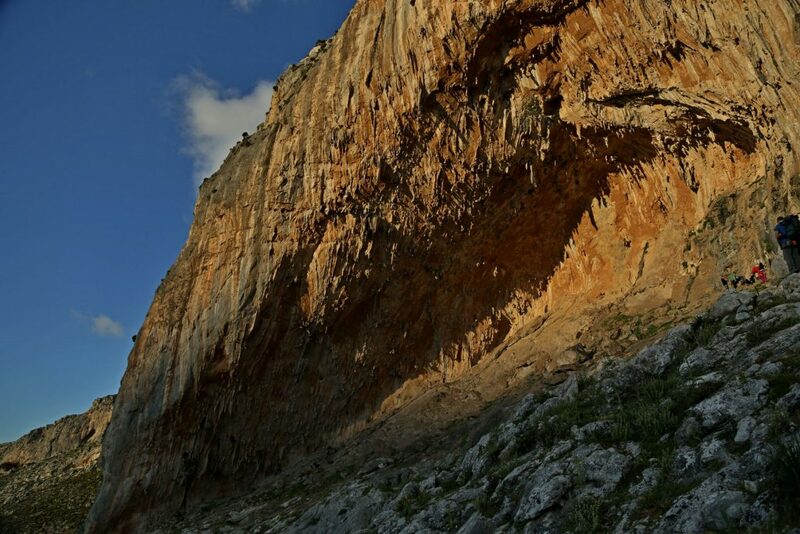 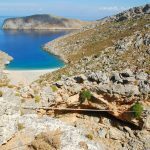 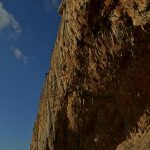 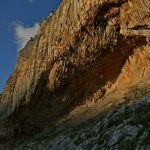 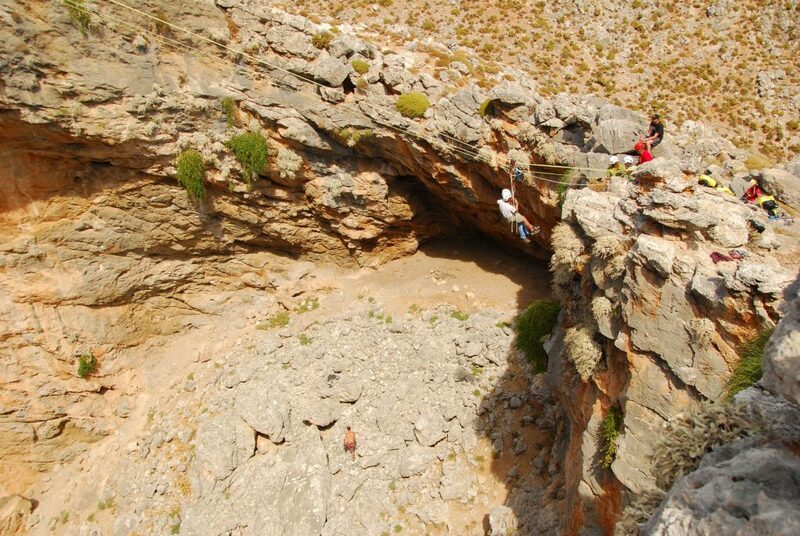 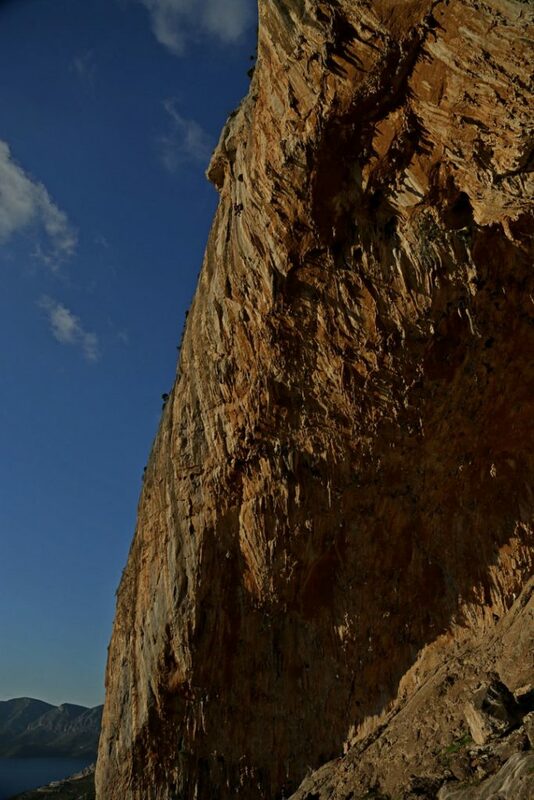 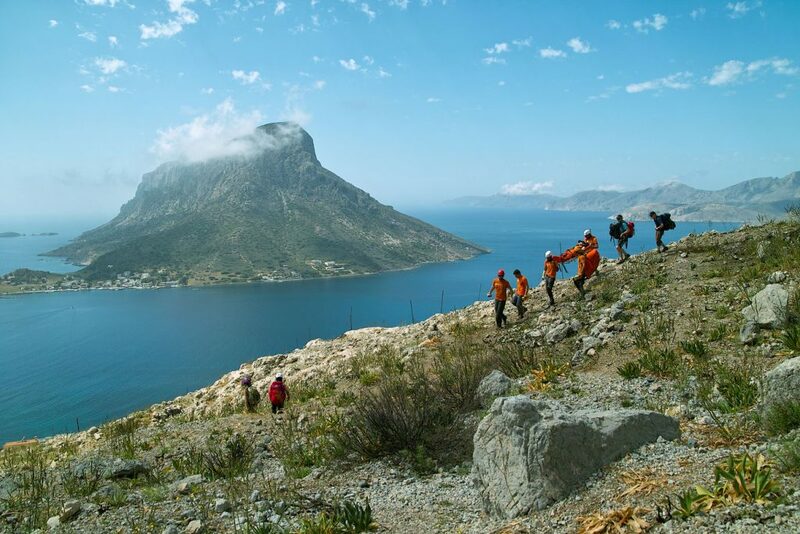 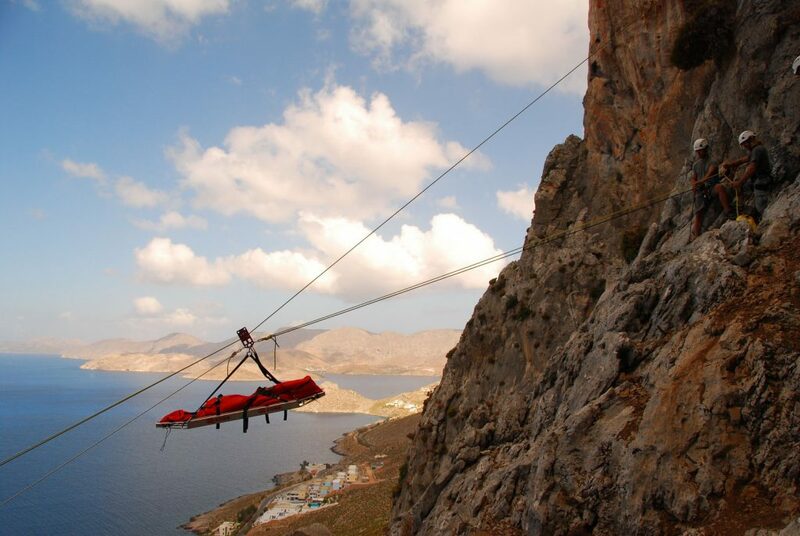 Kalymnos, the famous climbing destination, which everybody visits over and over again, had been watched over by a bunch of people who lived on the island and offered their help voluntarily in climbing accidents. 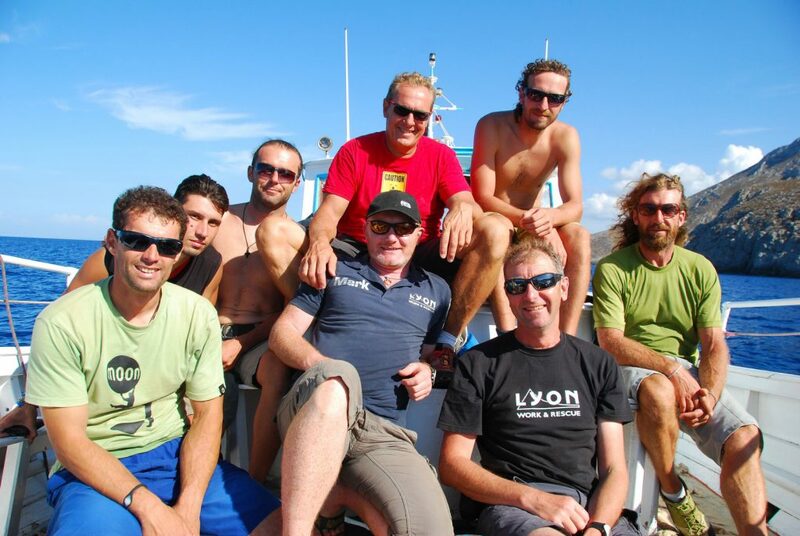 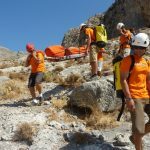 In 2013, Kalymnos Rescue Team was formed by many of these people among many more, in order to cover, voluntarily, as better as they can every climbing accident that might occur on the island. 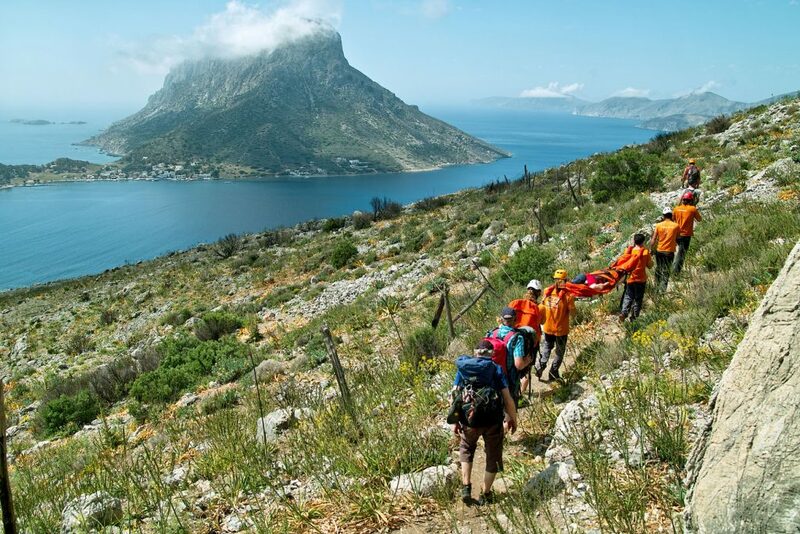 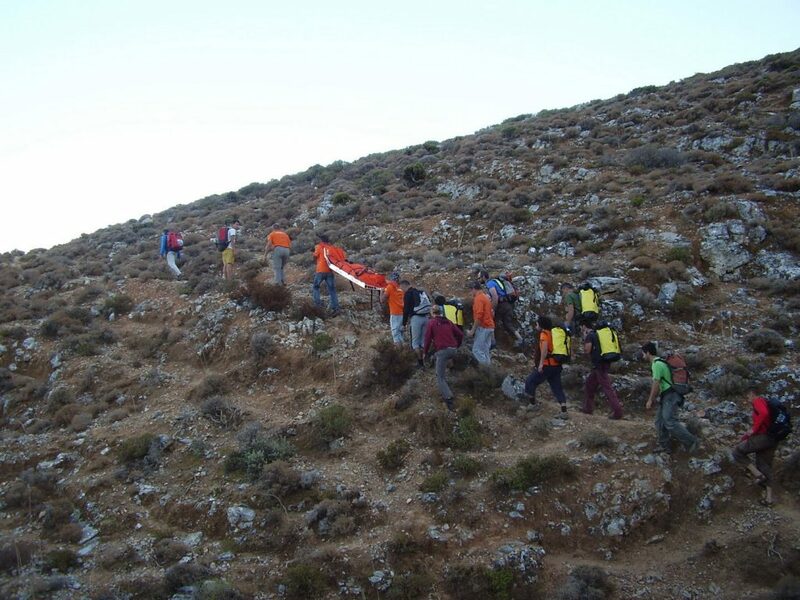 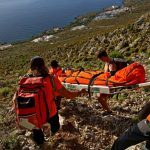 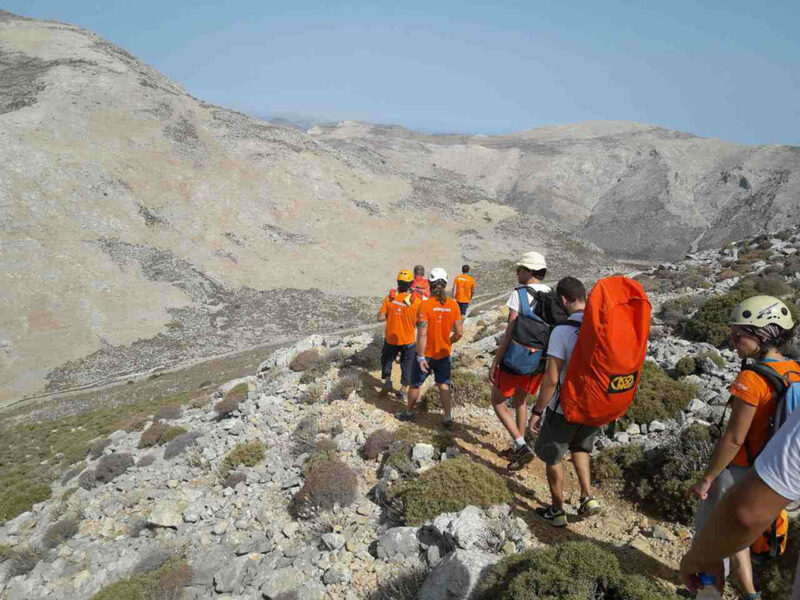 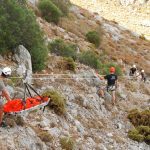 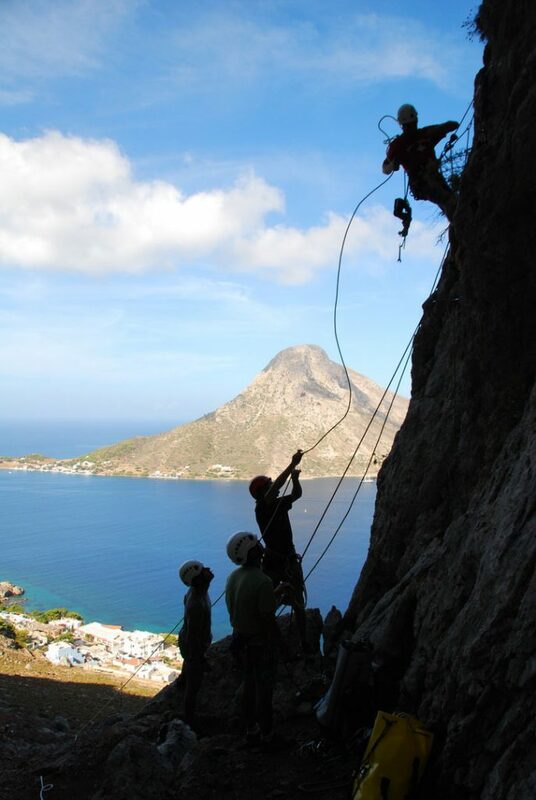 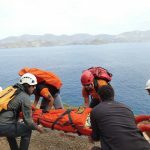 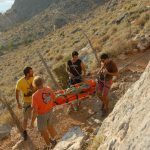 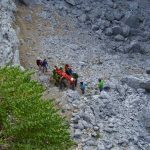 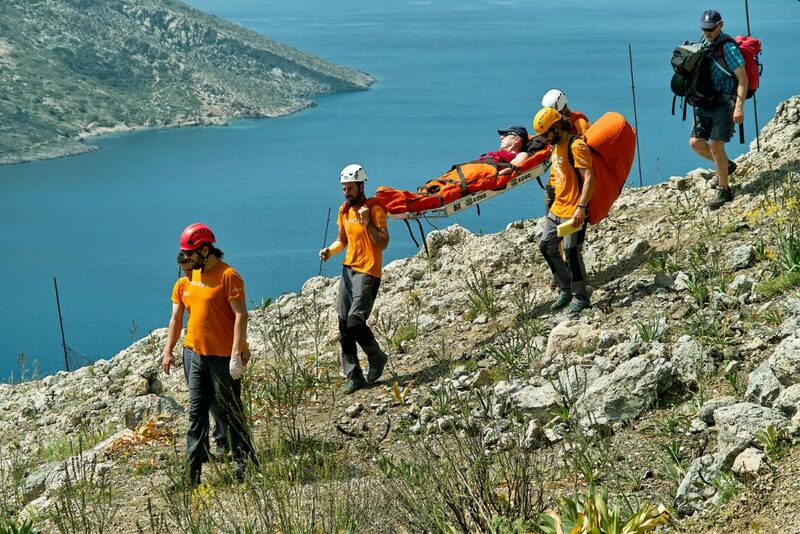 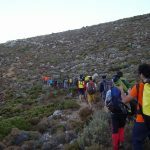 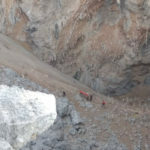 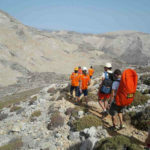 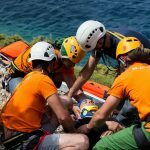 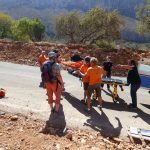 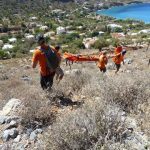 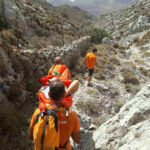 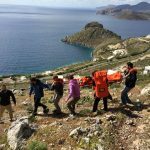 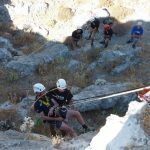 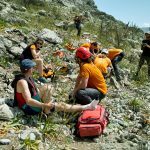 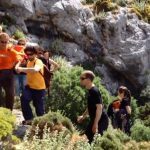 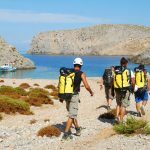 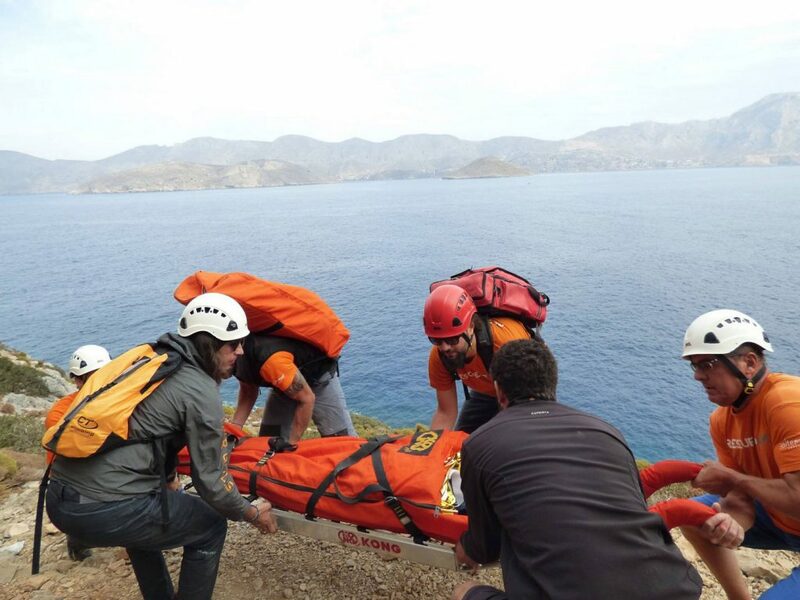 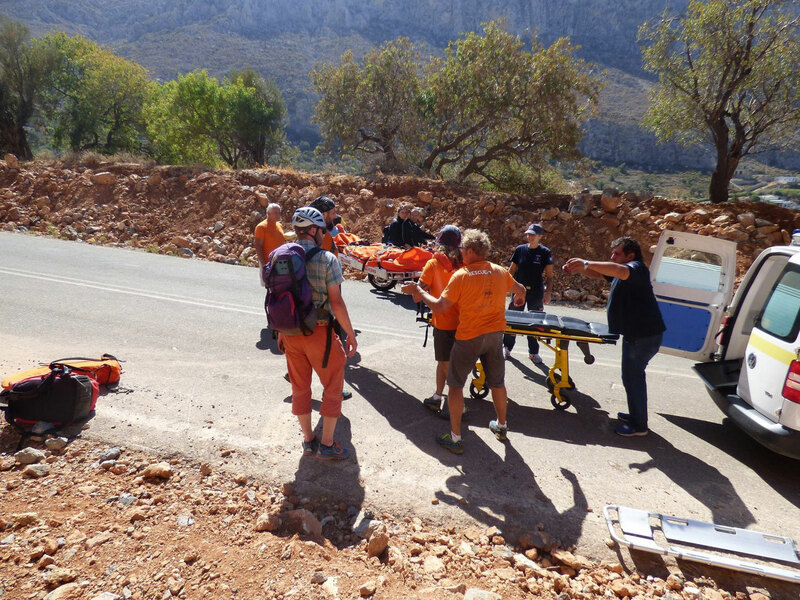 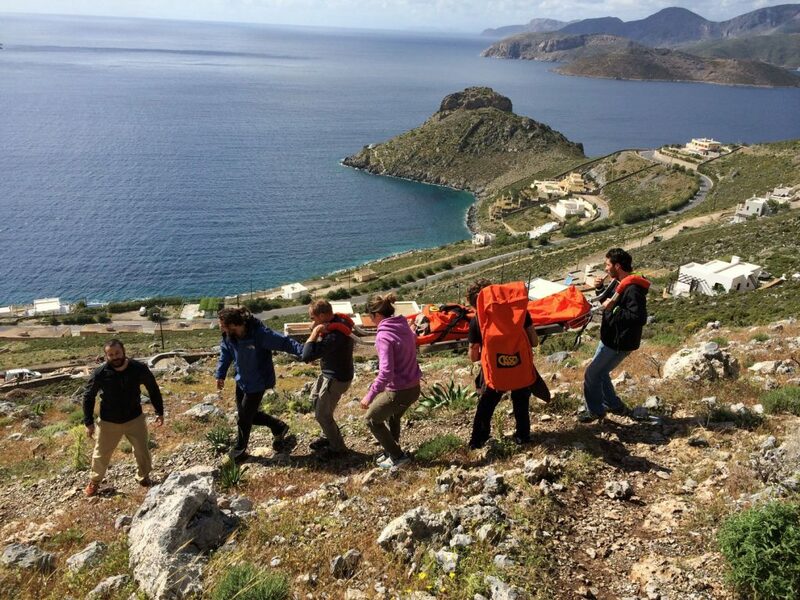 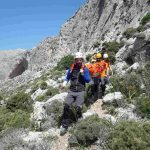 Our main purpose is to aid in any accident concerning climbing or other activities that take place on land and in rough areas that medical care cannot reach easily, as in trekking paths around the island. To achieve that, the team has directed it’s training into three basic fields: 1) climbing skills 2) rescue techniques 3) first aid skills. 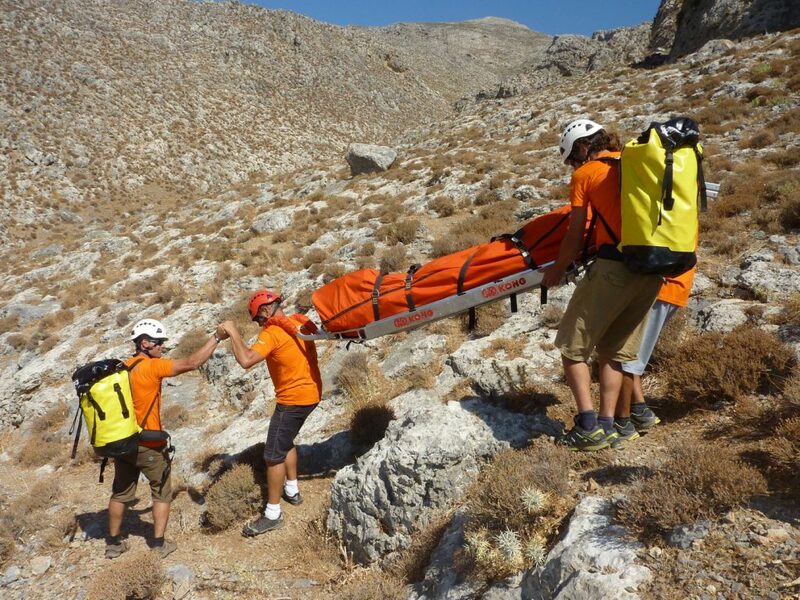 To exchange knowledge with other rescue groups in Greece and abroad, in order to enhance our experience. 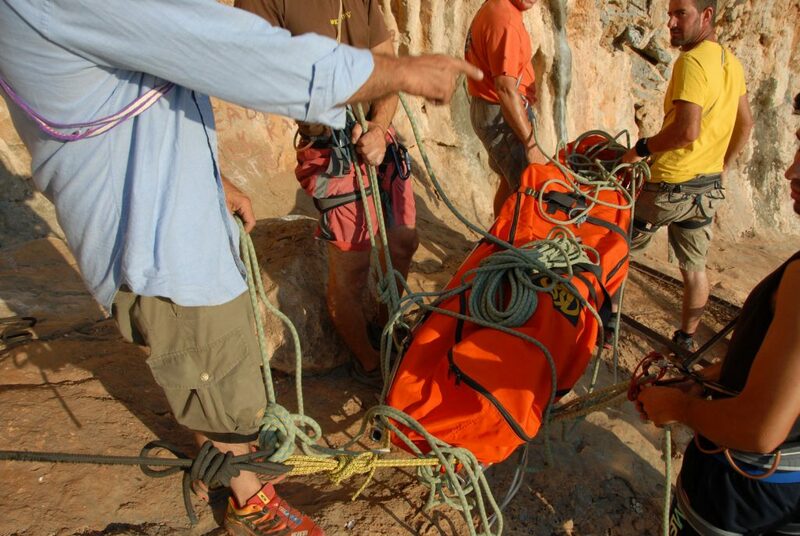 Group rescue exercises with other Rescue Organizations are a very important way for the Team to evolve. 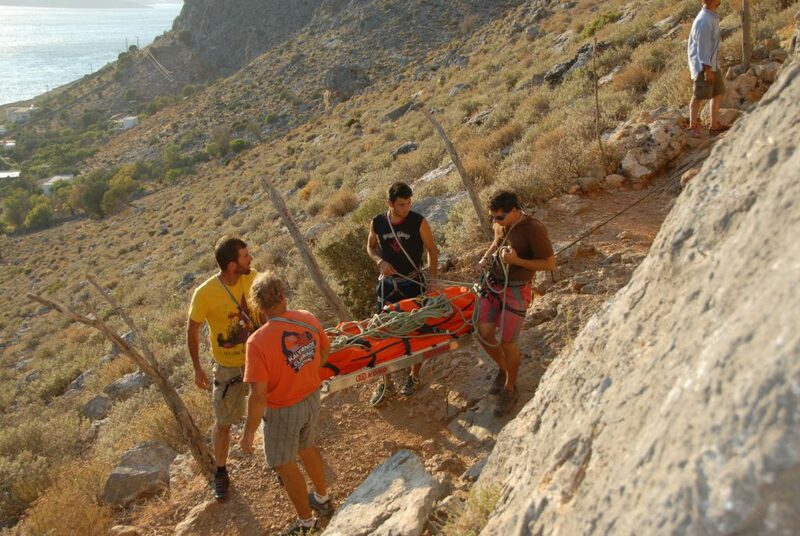 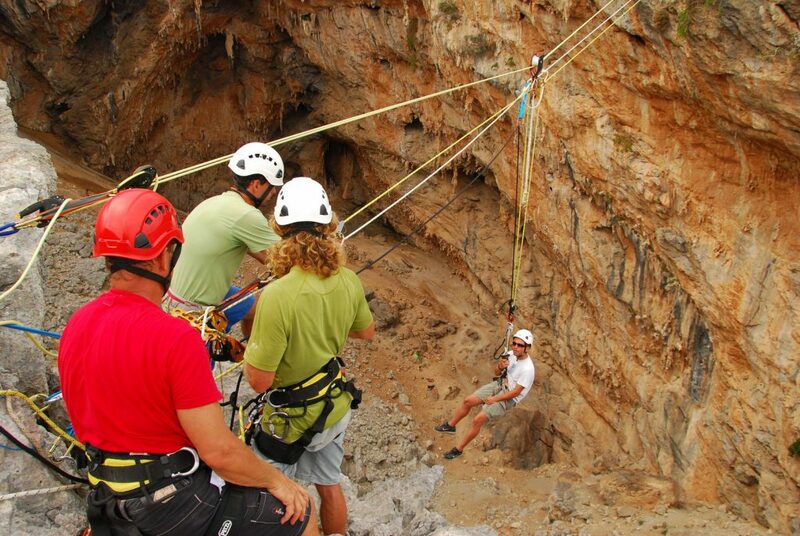 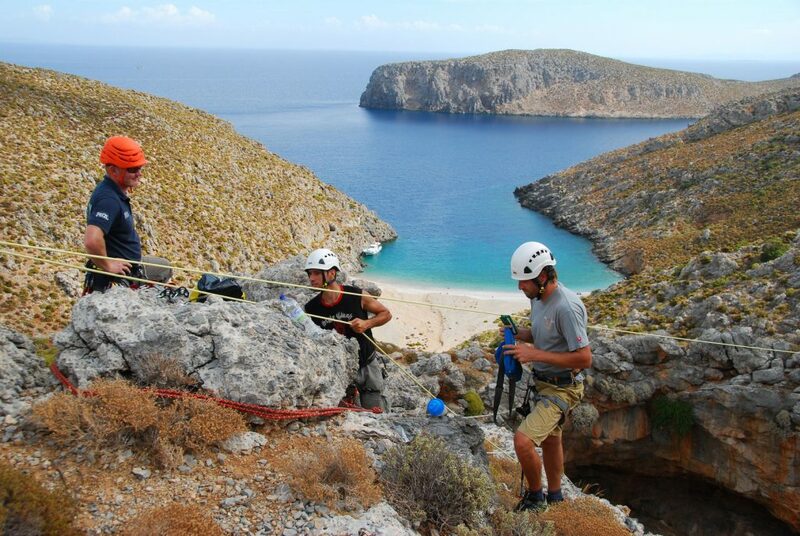 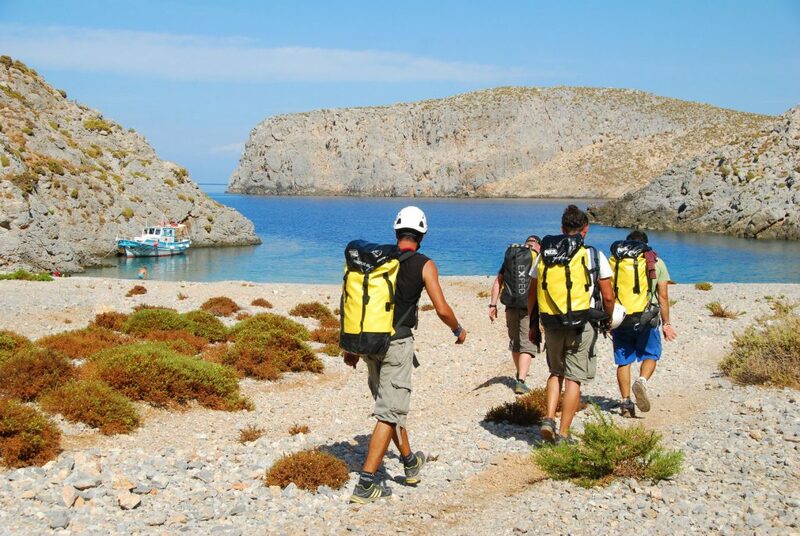 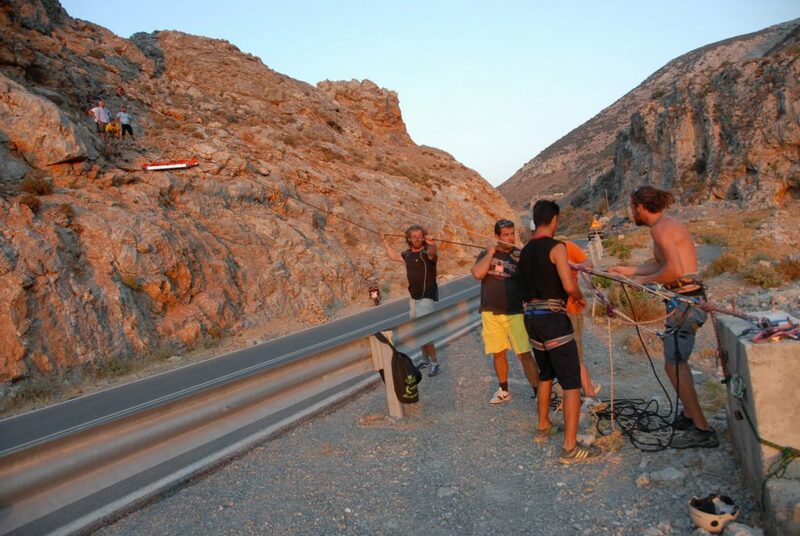 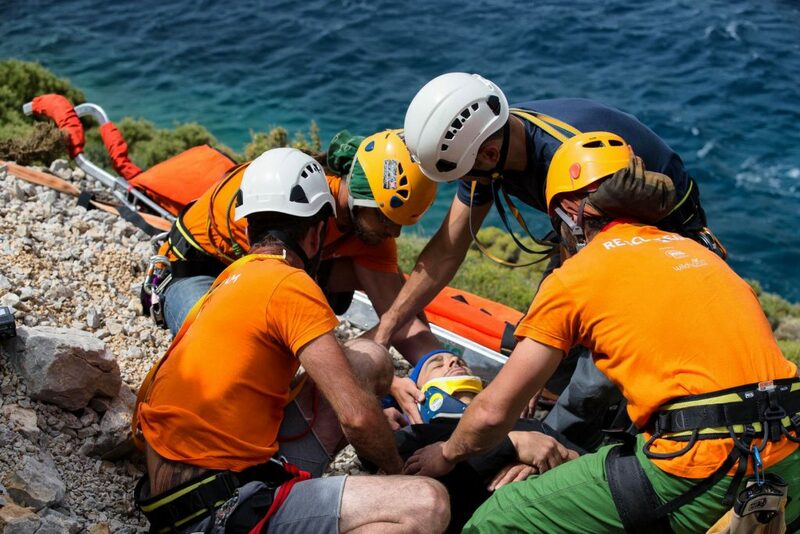 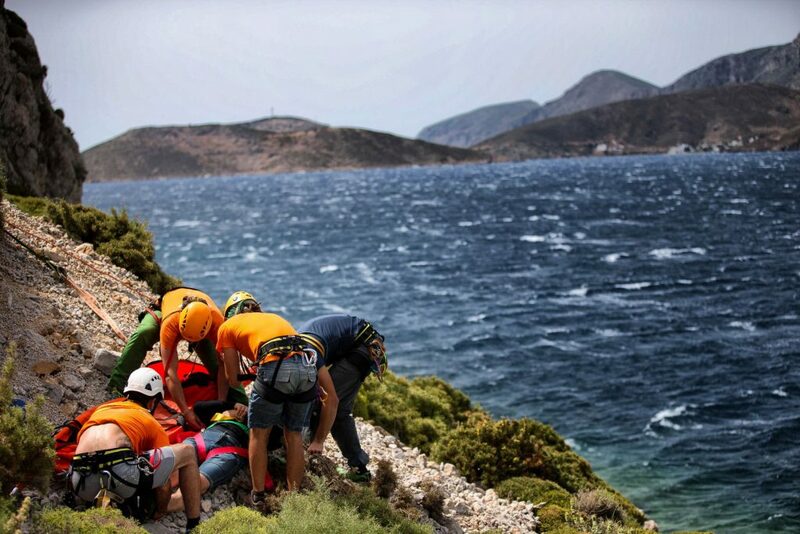 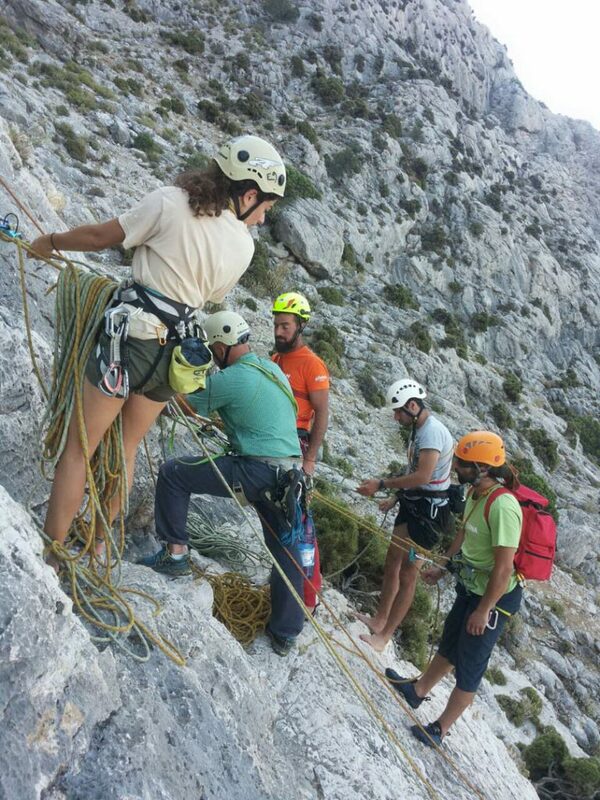 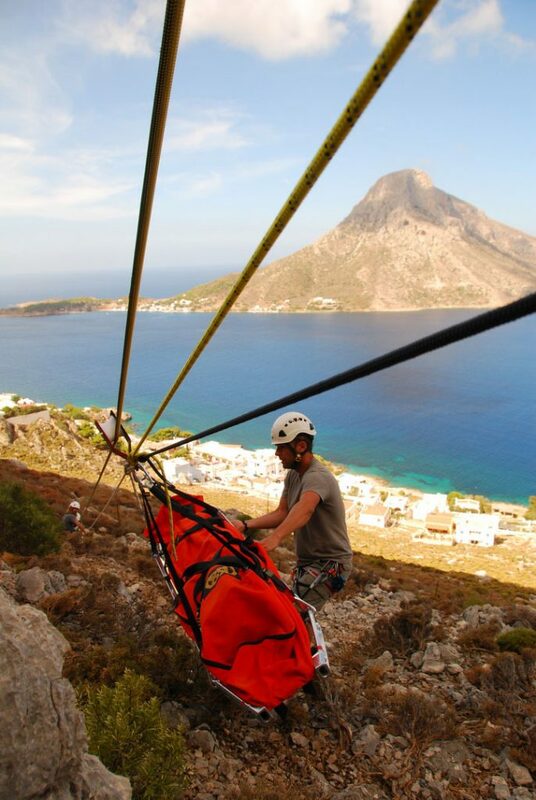 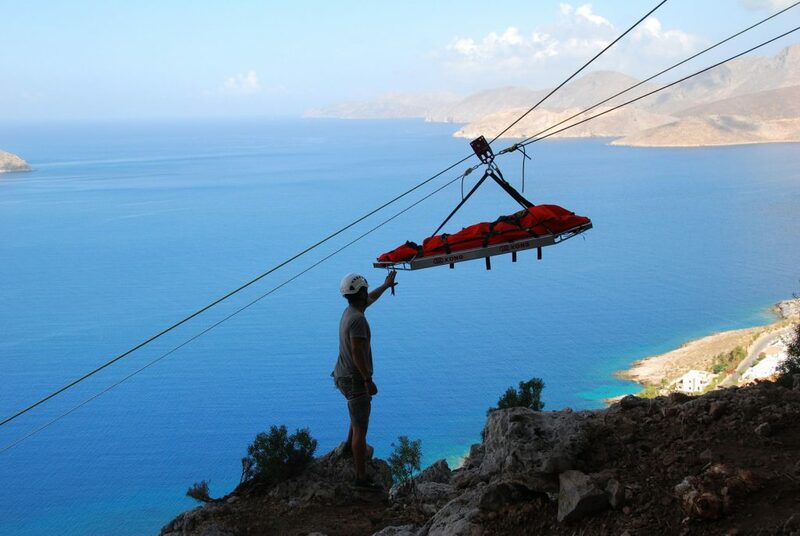 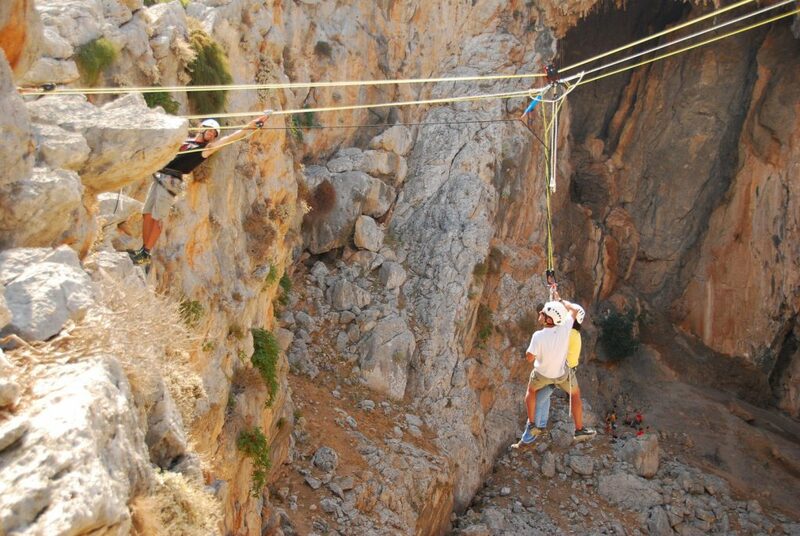 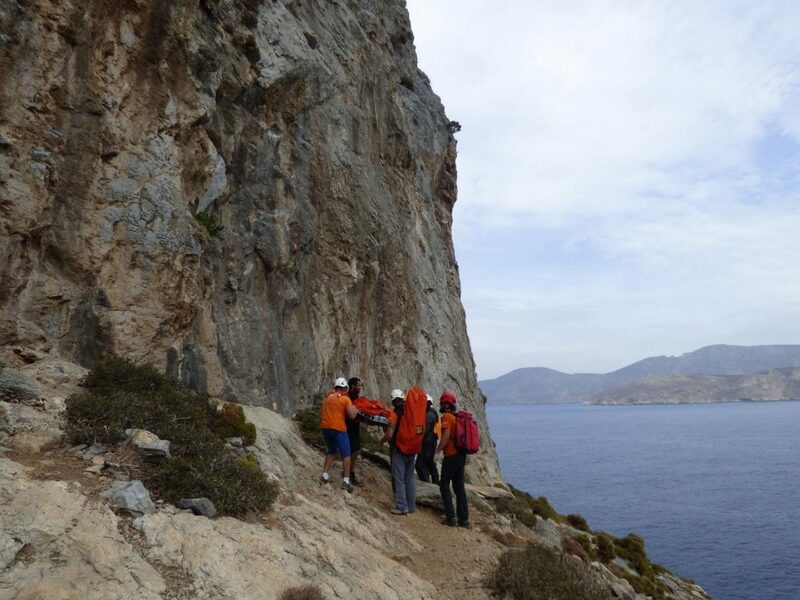 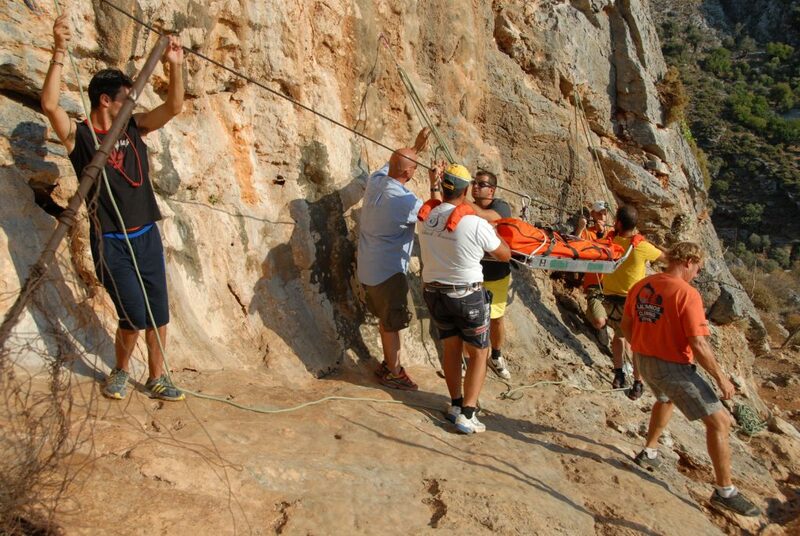 Before 2013, rescue in Kalymnos was performed by individuals that lived on the island, as a personal offer. 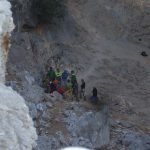 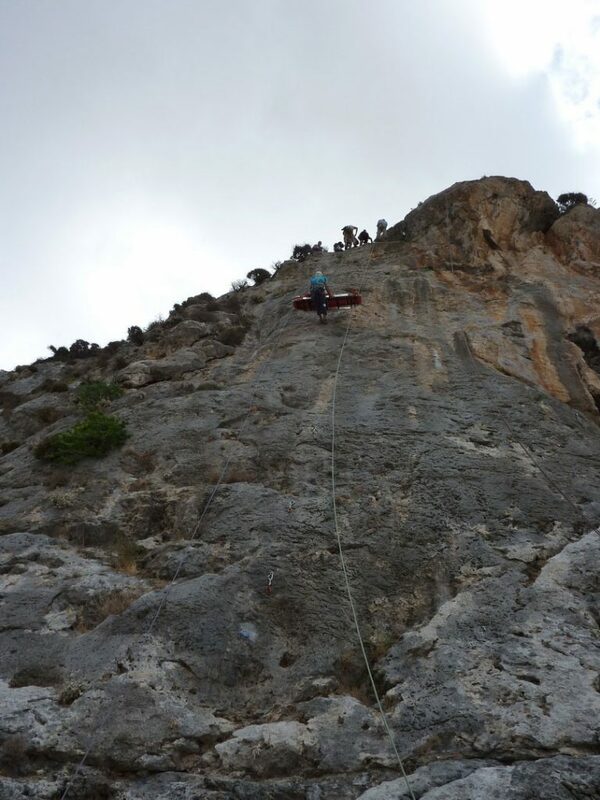 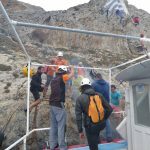 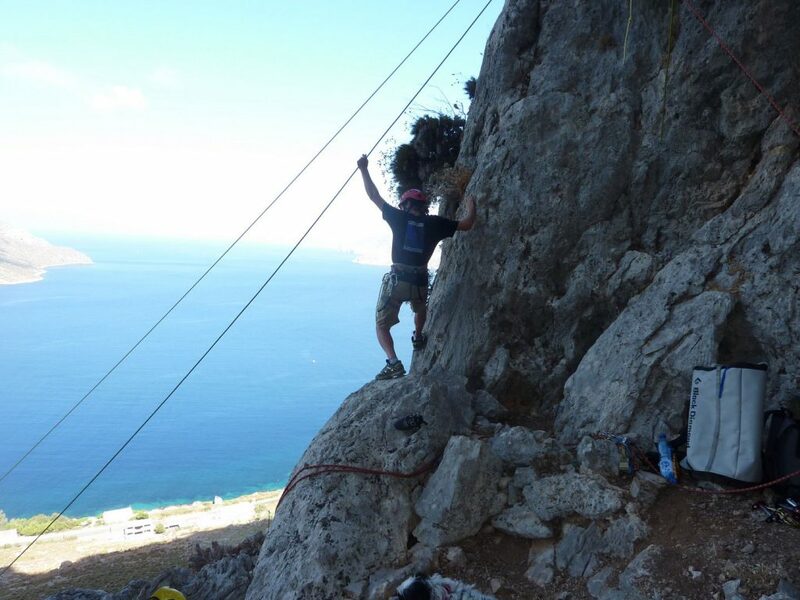 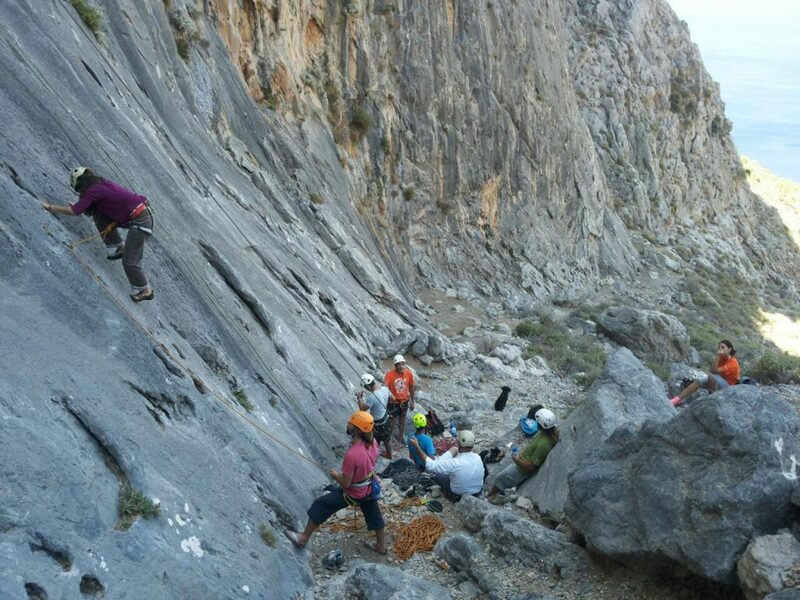 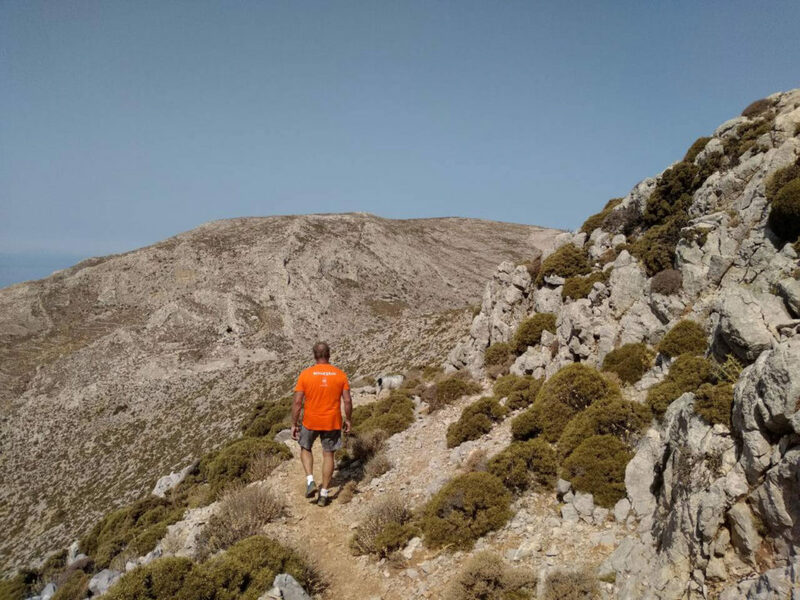 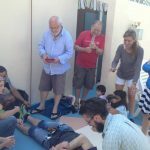 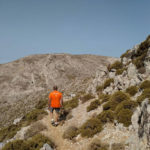 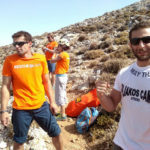 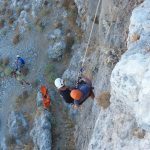 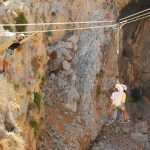 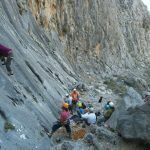 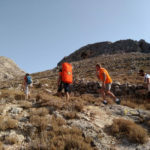 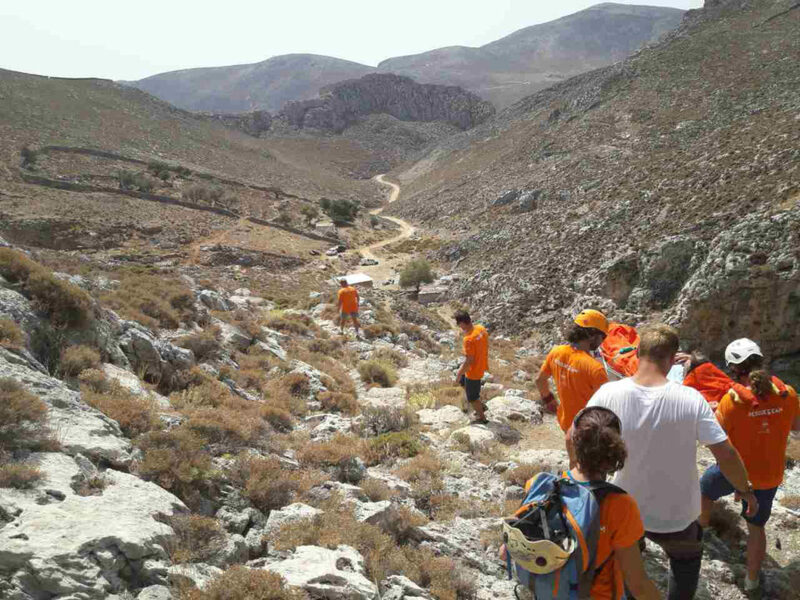 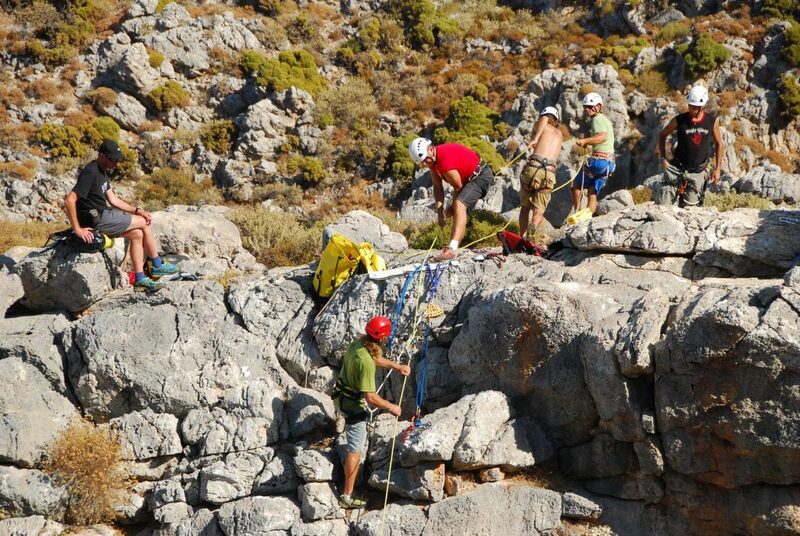 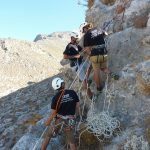 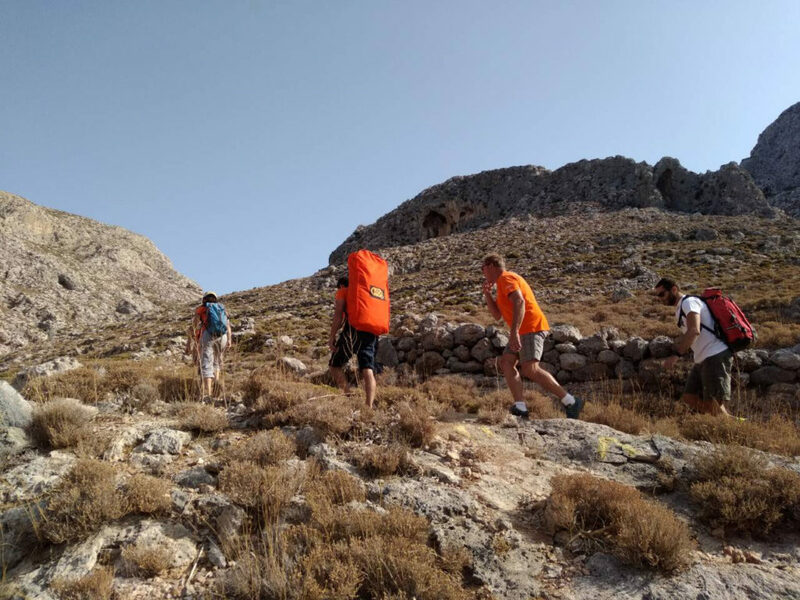 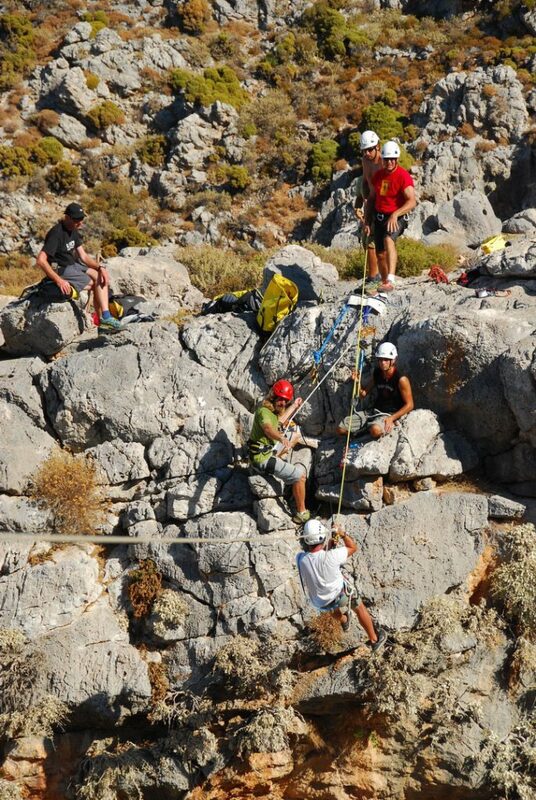 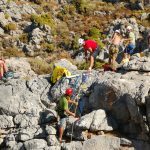 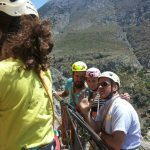 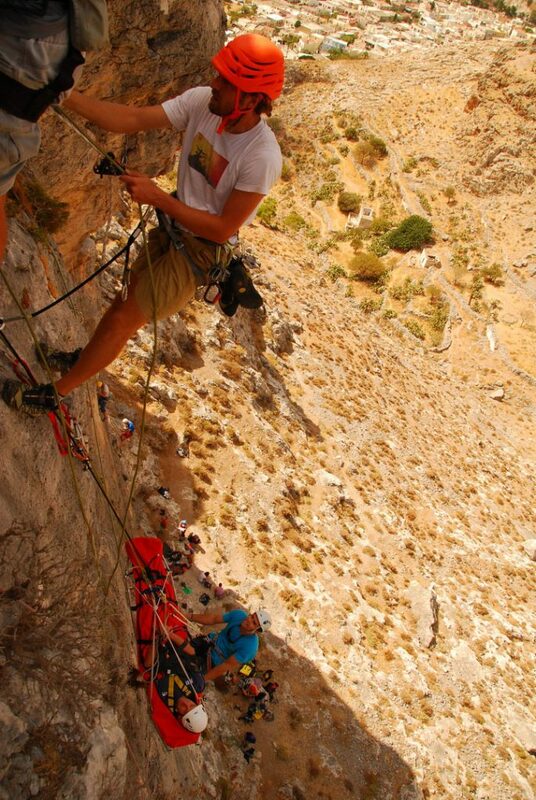 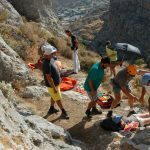 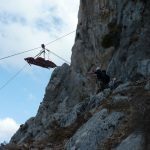 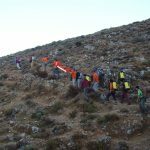 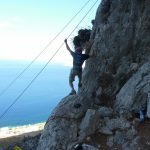 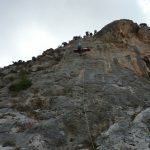 At the same time, there also were some attempts to create something more organized, like a first aid seminar by the Prefecture of Kalymnos and the Greek Cardiological Society, along with a climbing course to some locals from Aris theodoropoulos. 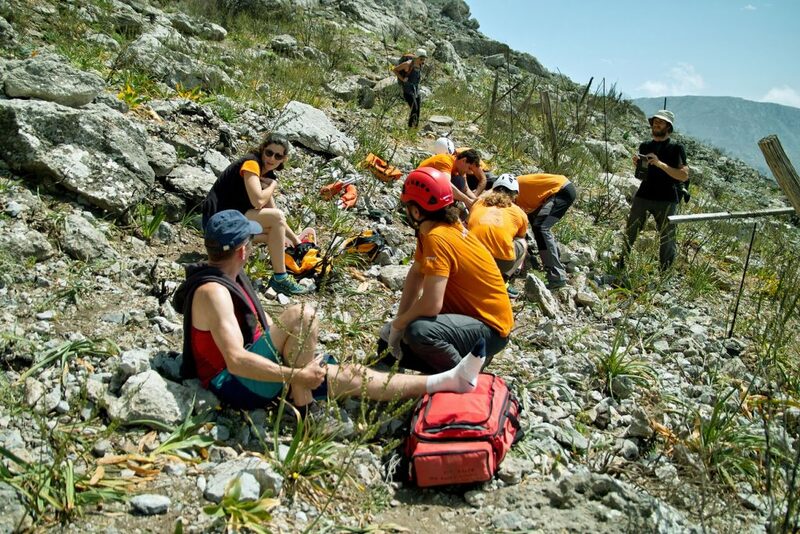 The first Rescue Team was then formed, its members were financially supported by the Prefecture and they were assisted by those who were already doing the job (Claude Idoux, Simon Montmory, Loucas Dourdourekas, etc). 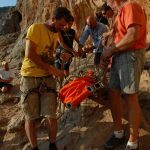 The funding lasted for 6 months and that was the life span of that attempt. 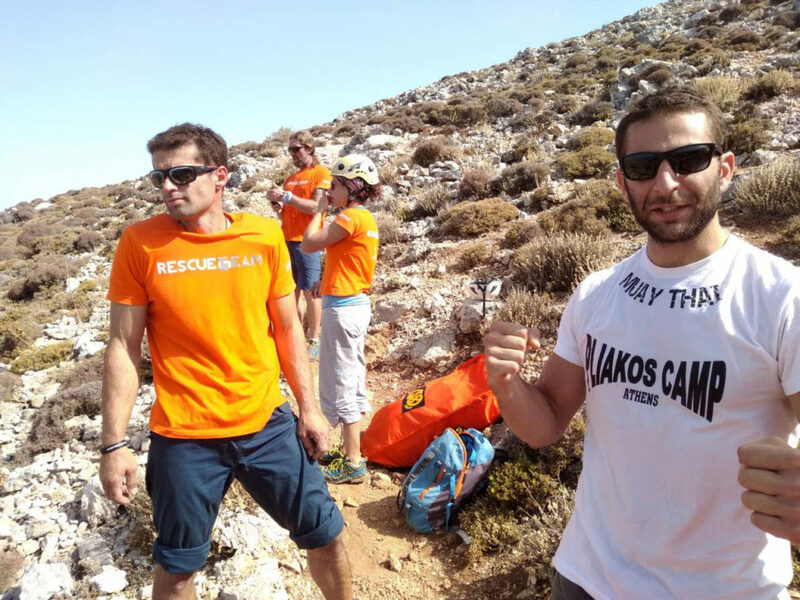 Additionally, there was a fund by Glaros Bar, together with Claude Idoux, local opener and the Team’s vice-President now, to raise money for rescue equipment. 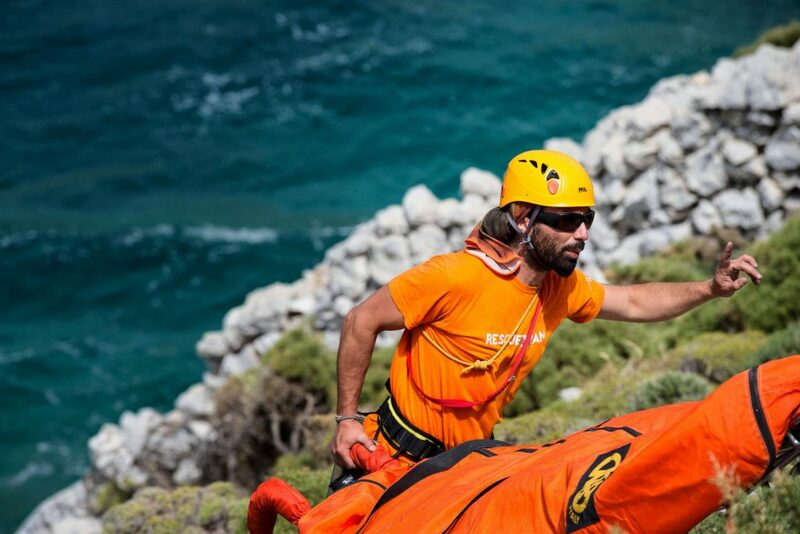 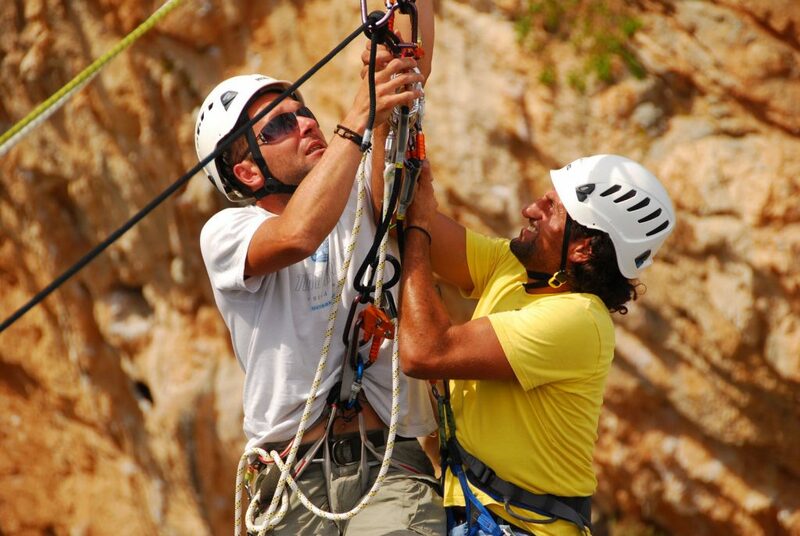 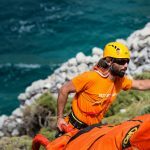 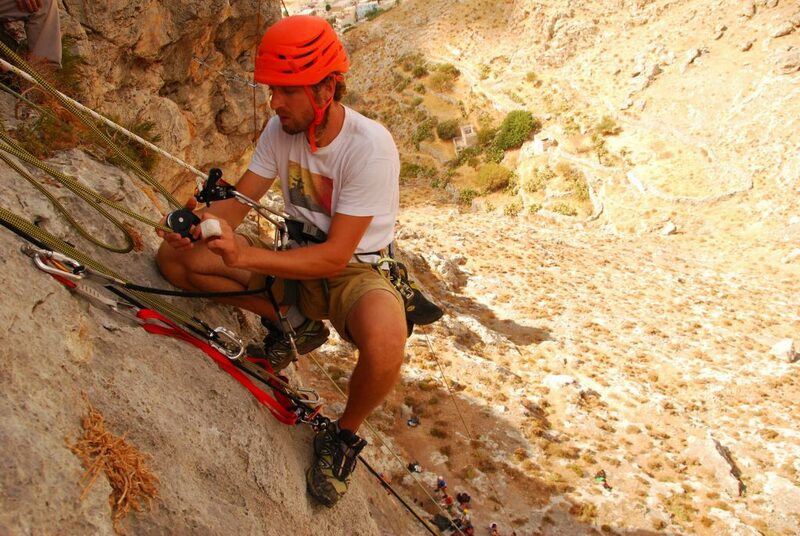 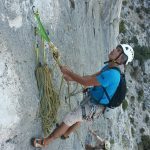 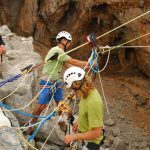 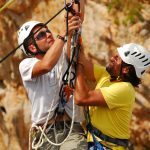 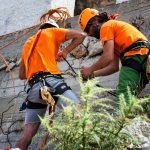 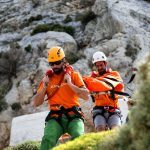 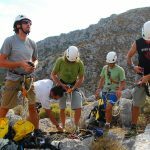 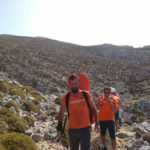 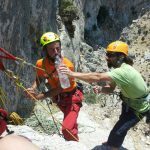 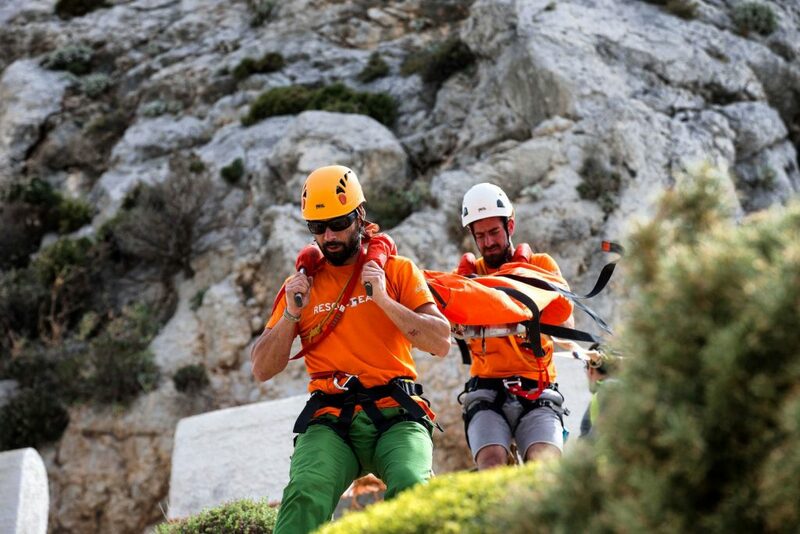 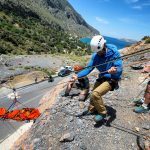 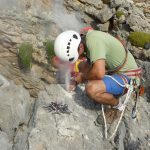 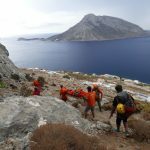 In 2013 Alexandros Istatkof, a local climber and the Team’s President at the moment, together with Kalliope Tsagari, owner of Alternet, active in the tourism industry, had the idea to create an organized group of volunteers, in a form of an association, who will be trained to be rescuers. 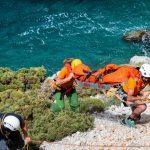 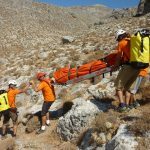 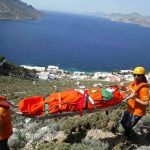 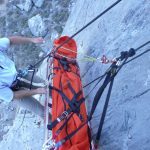 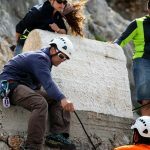 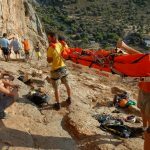 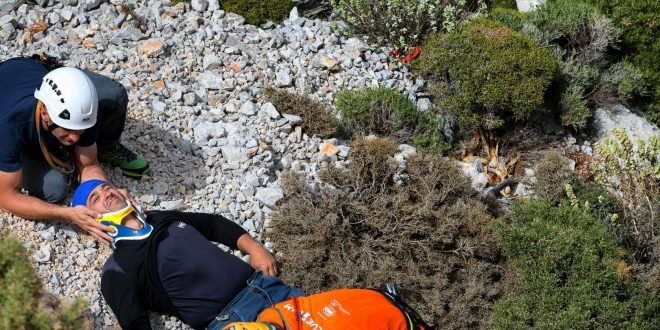 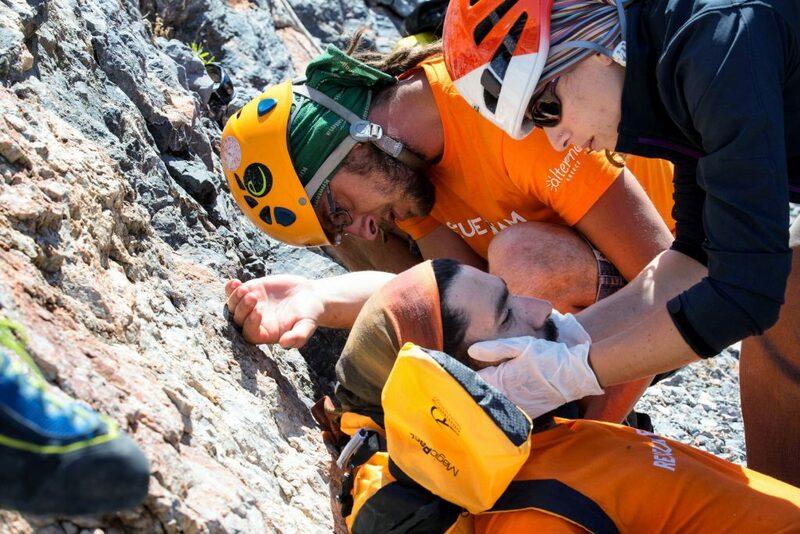 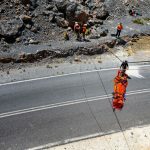 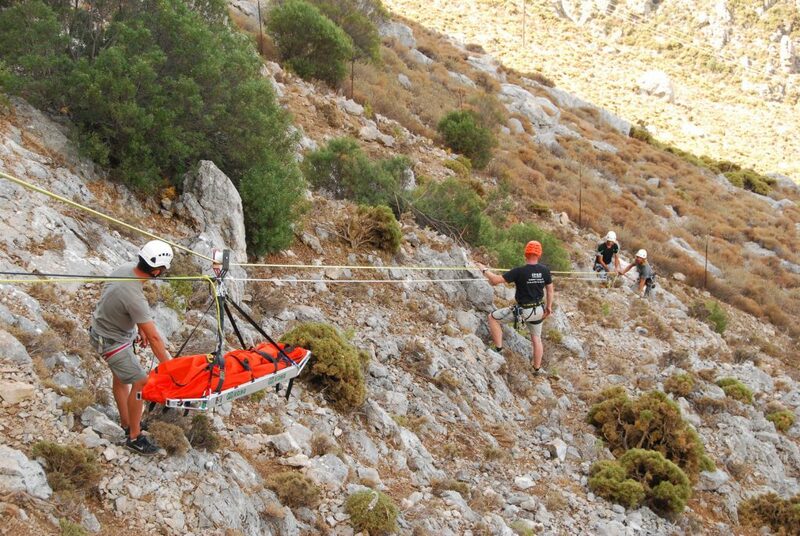 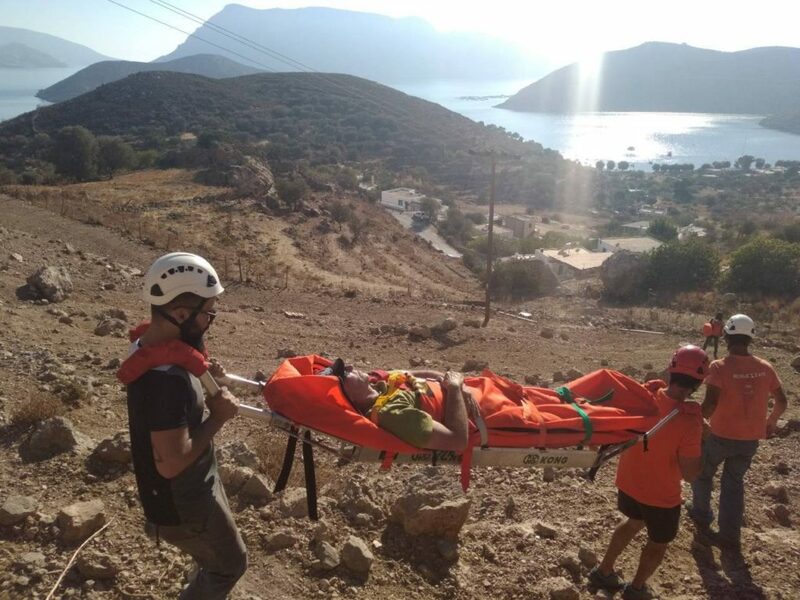 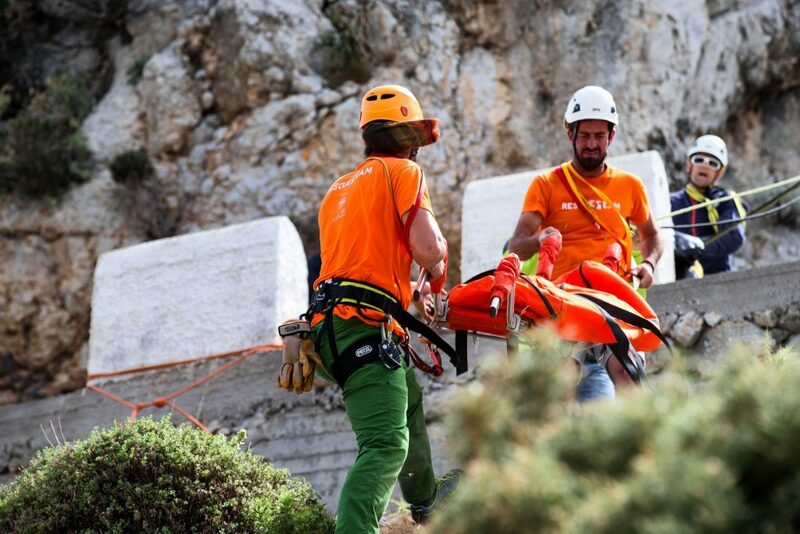 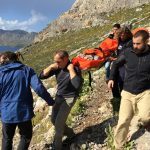 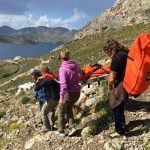 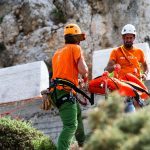 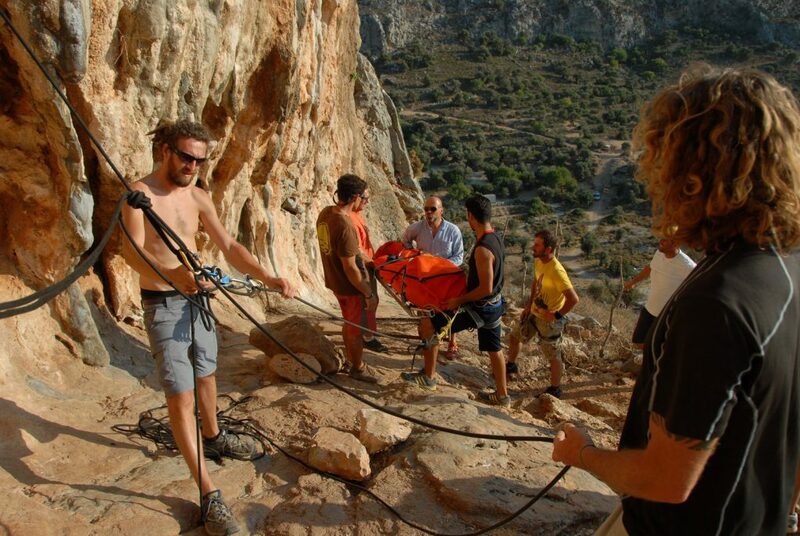 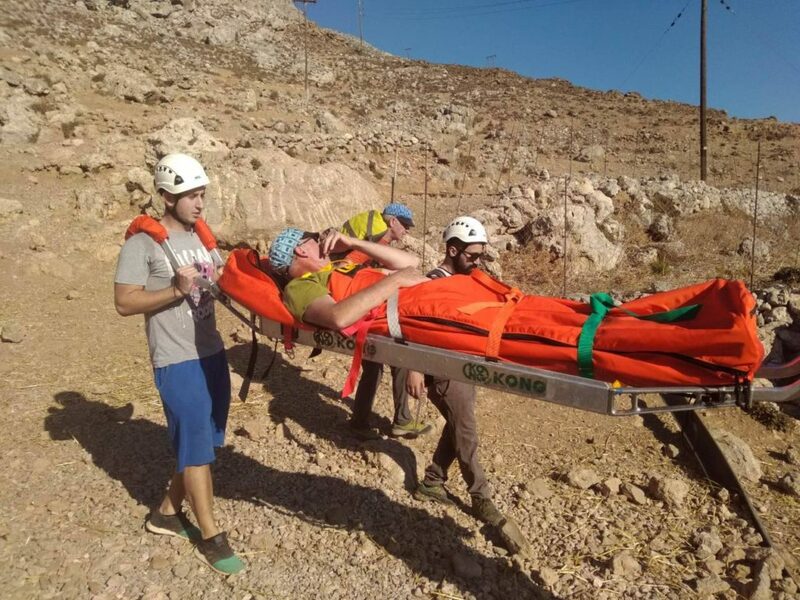 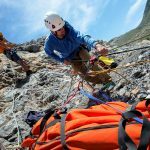 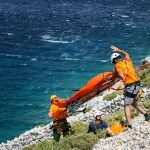 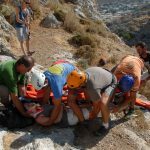 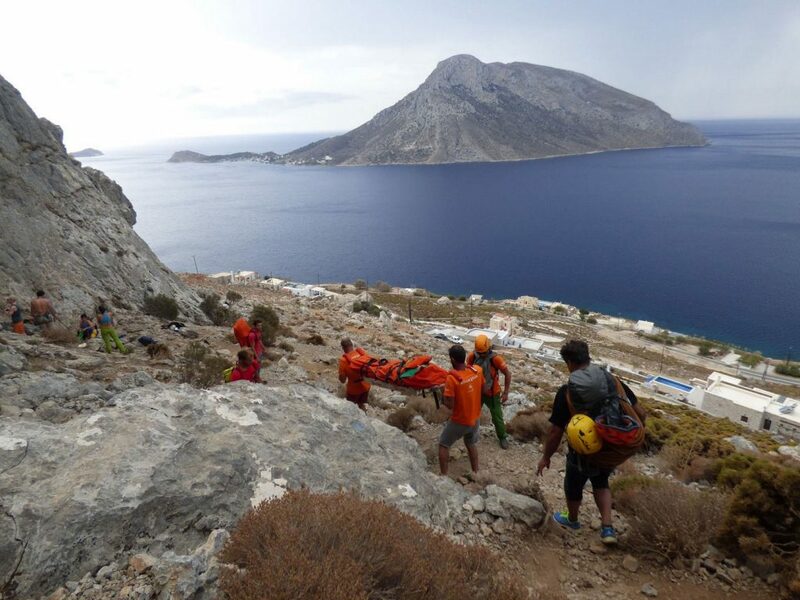 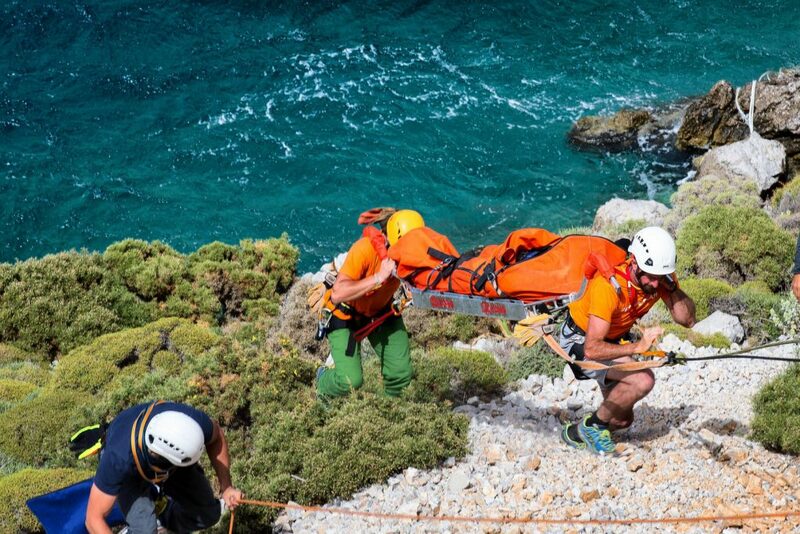 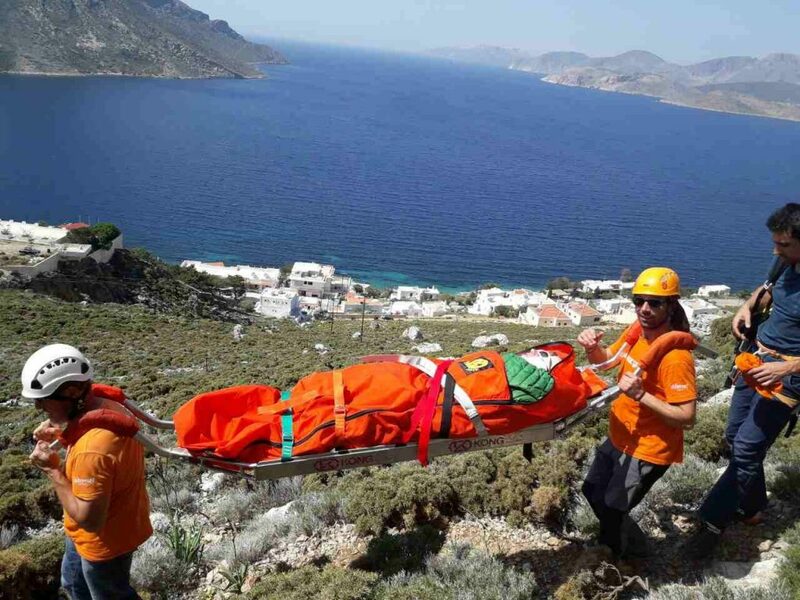 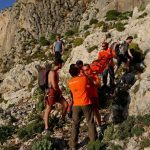 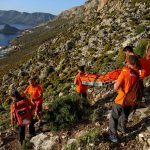 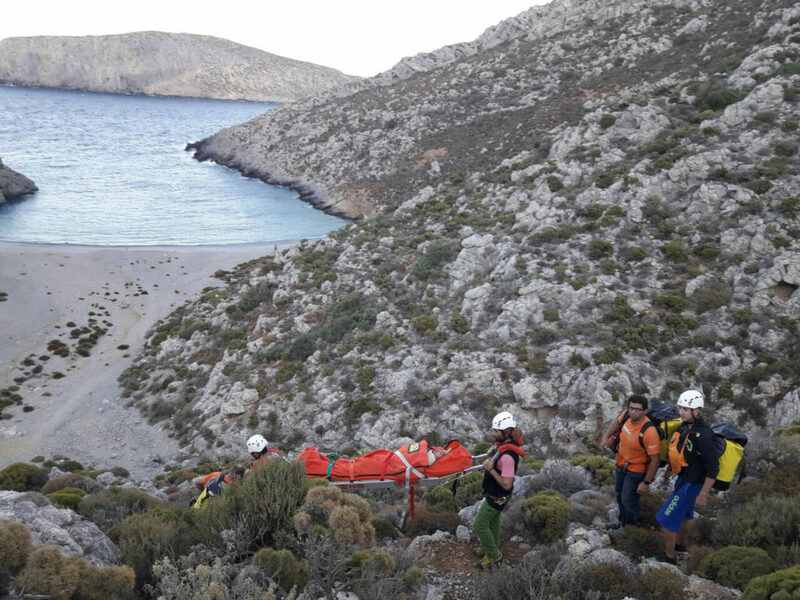 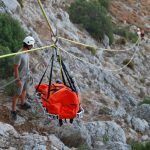 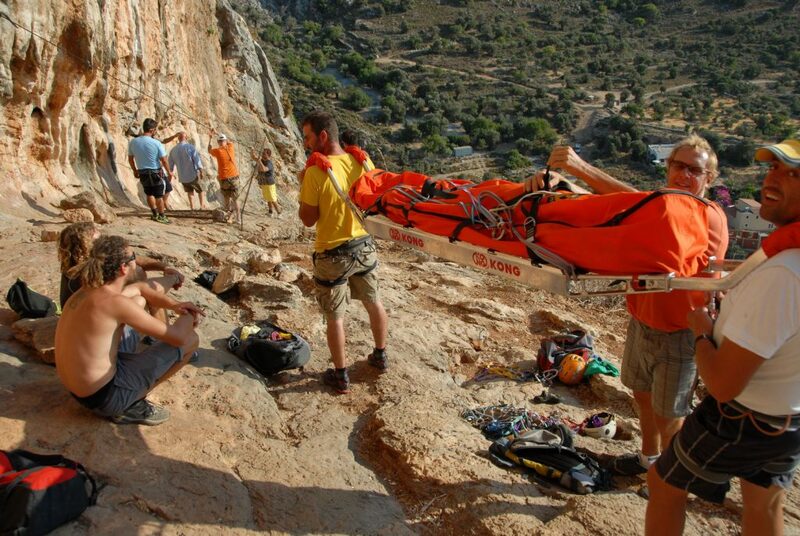 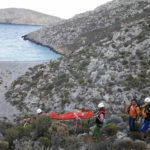 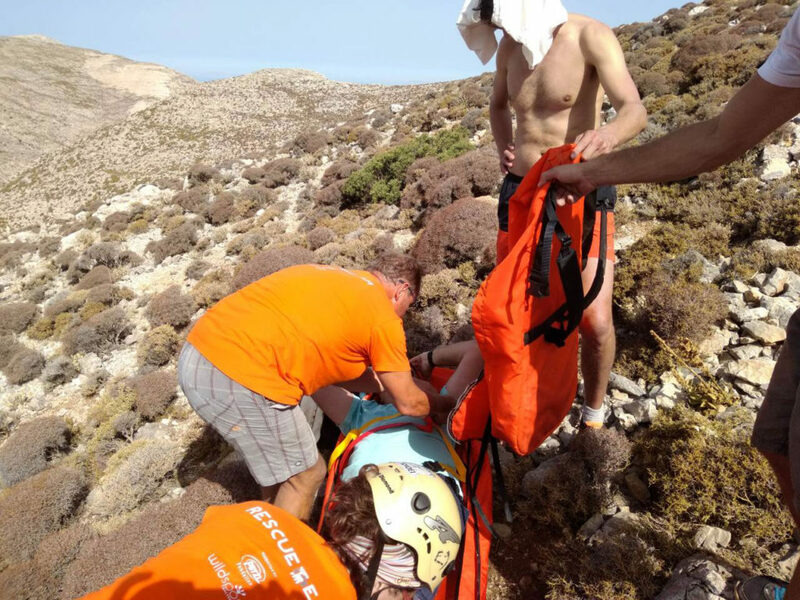 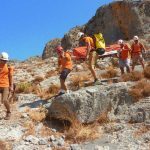 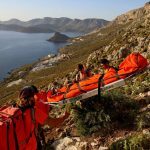 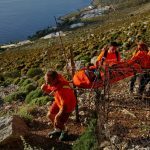 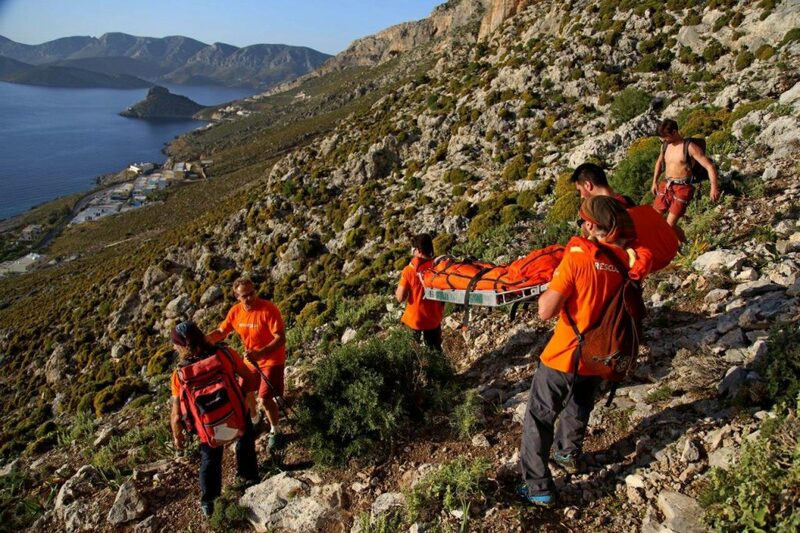 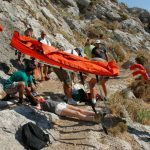 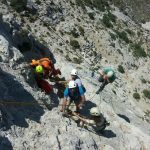 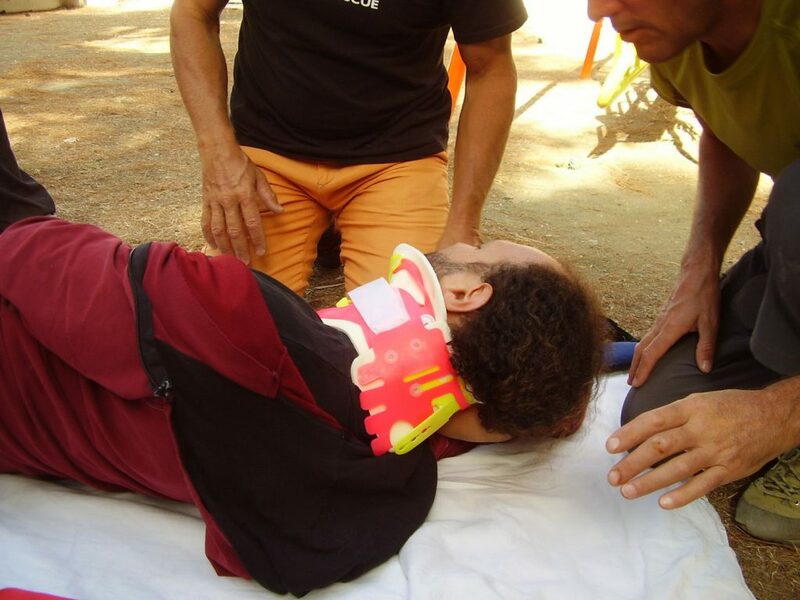 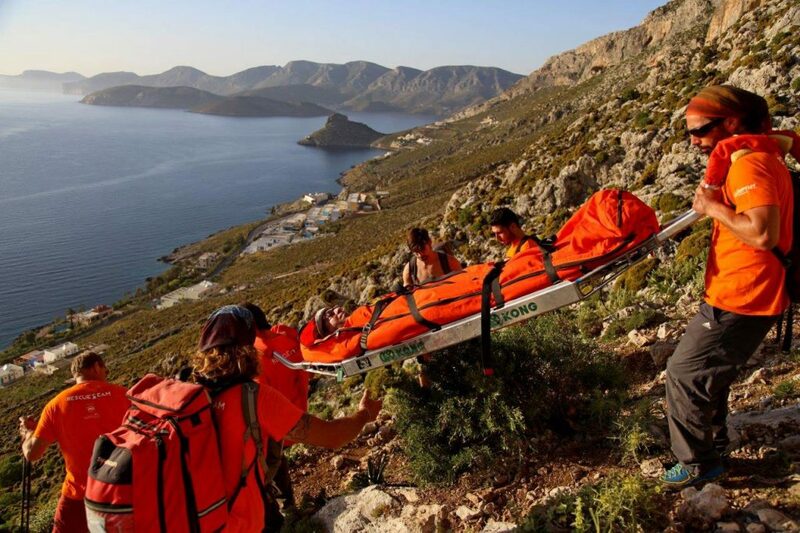 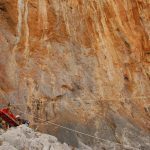 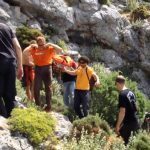 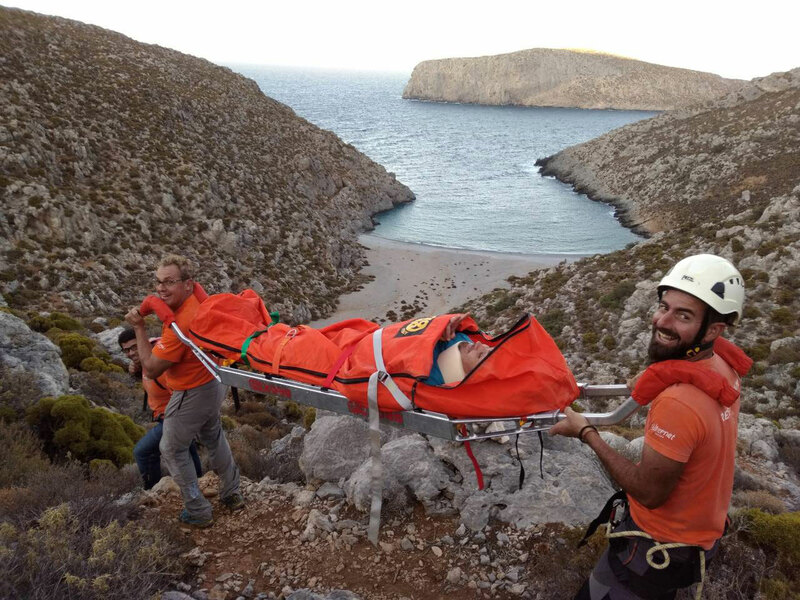 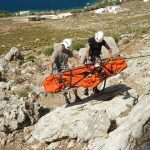 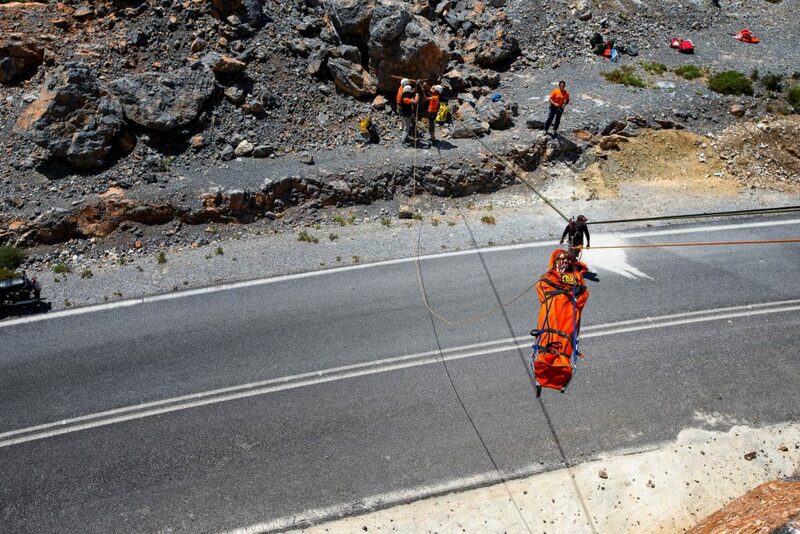 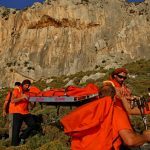 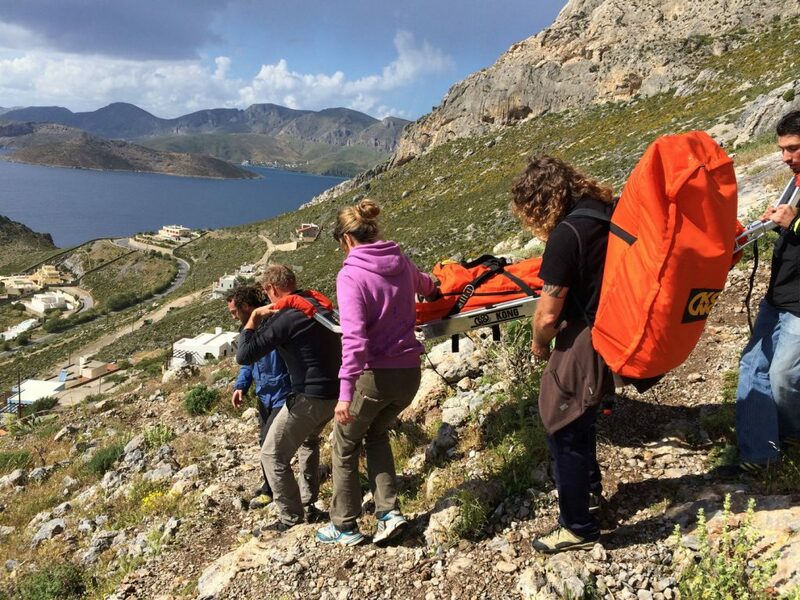 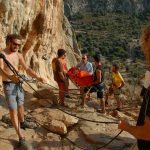 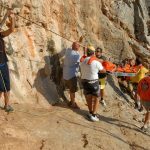 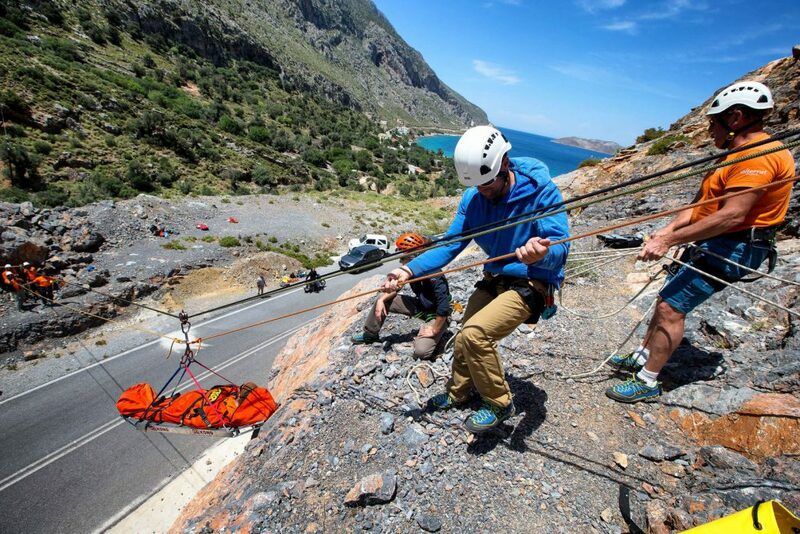 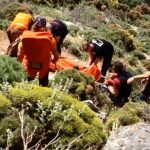 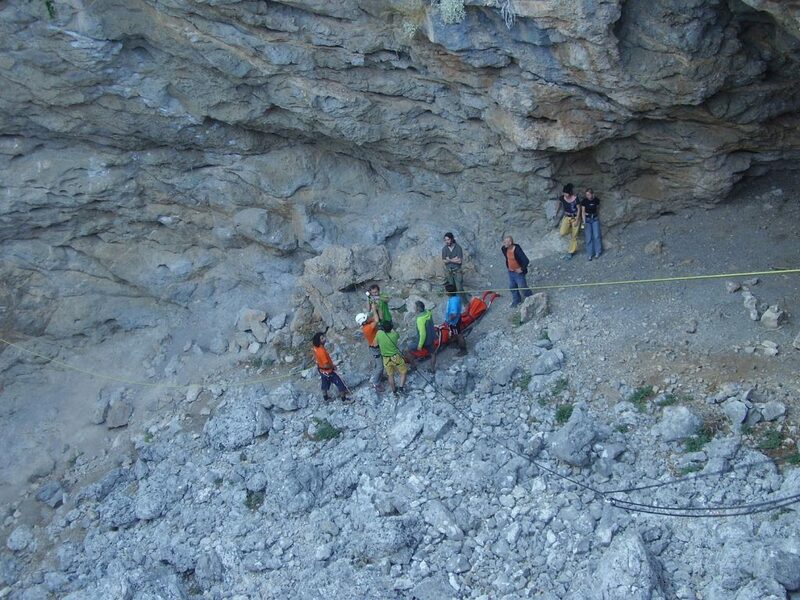 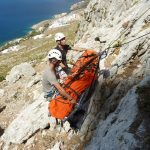 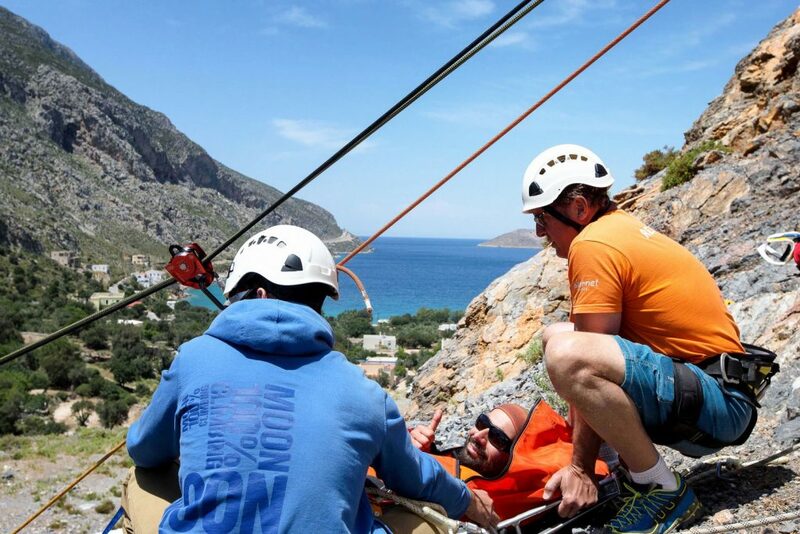 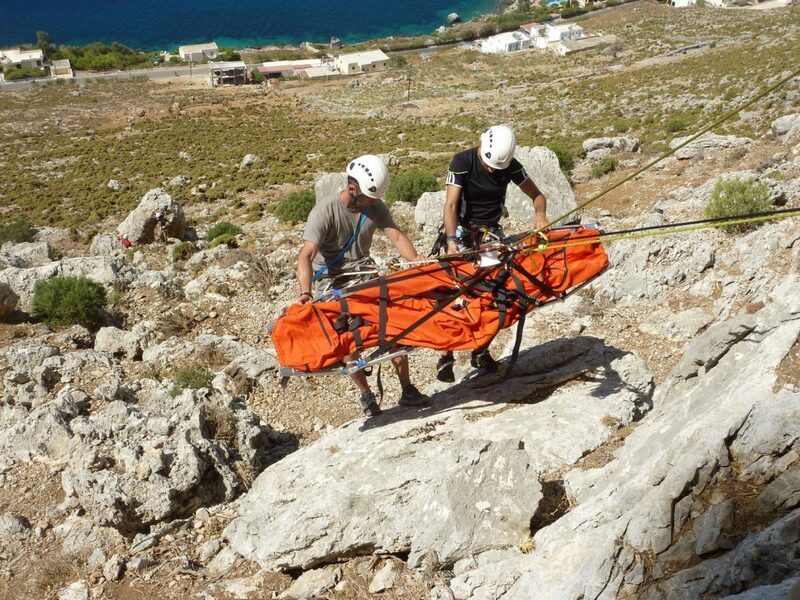 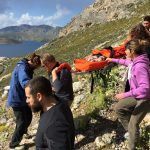 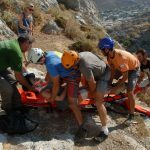 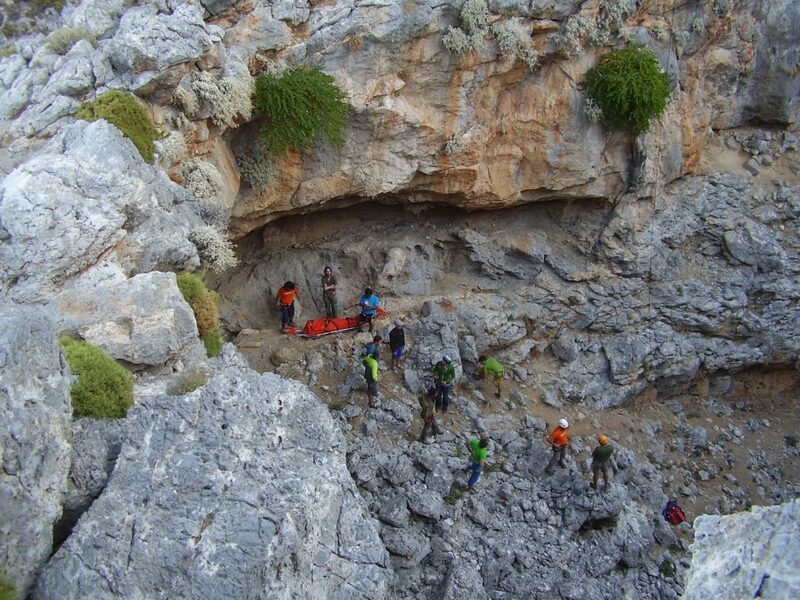 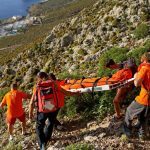 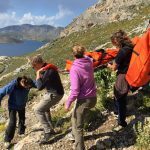 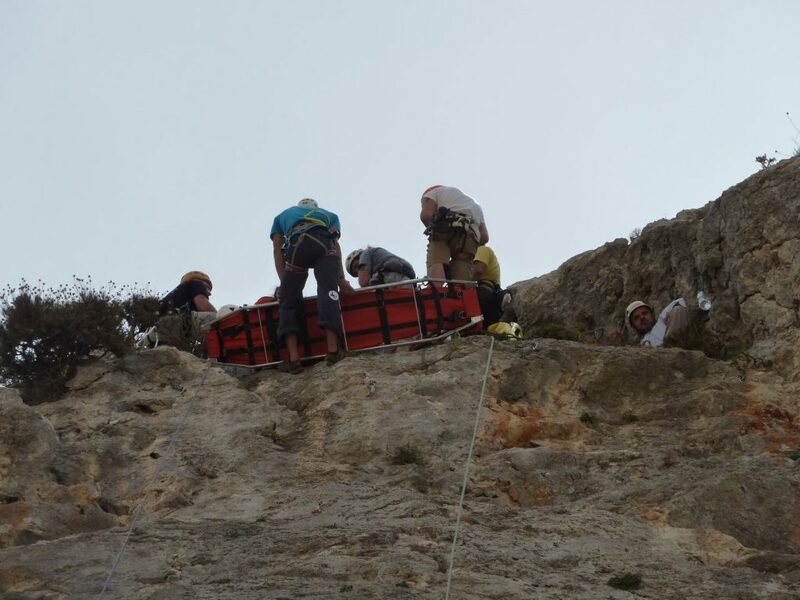 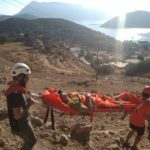 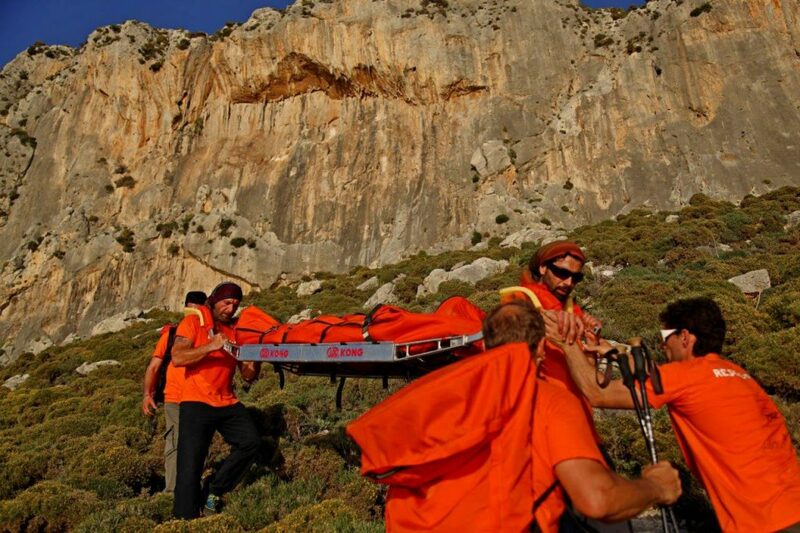 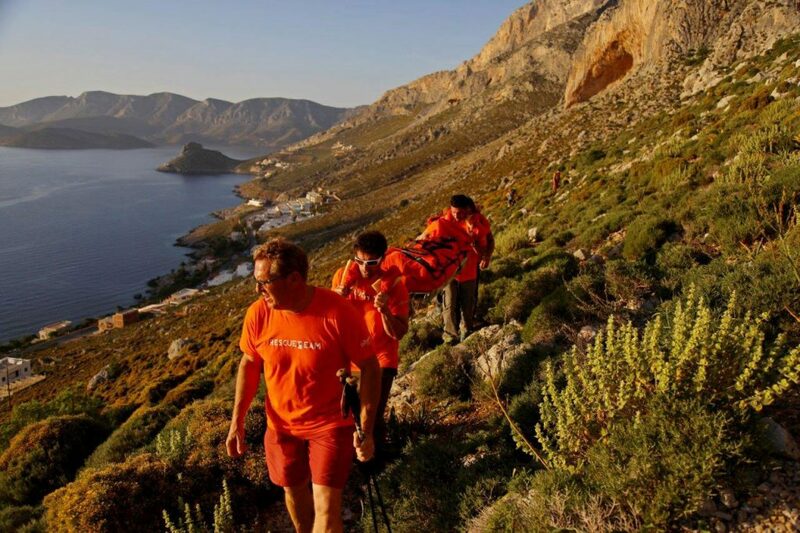 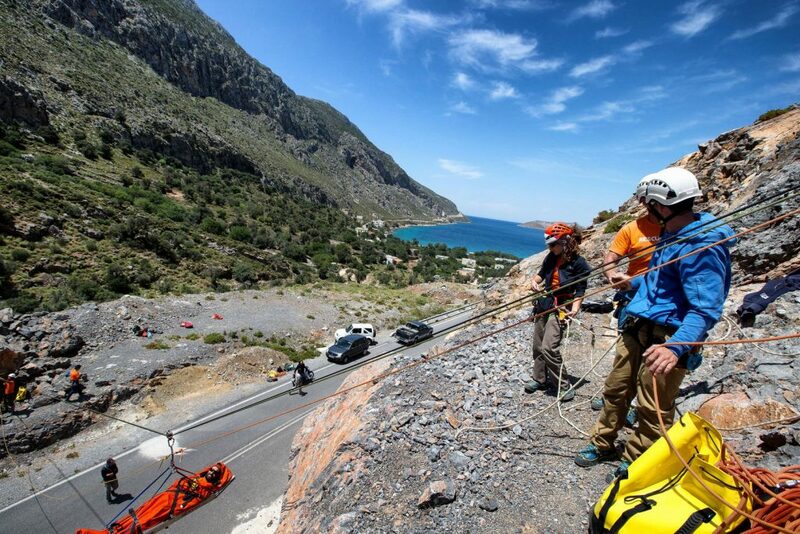 This came as a necessity, as there is no official state body in Kalymnos that can cover climbing accidents and a rescue from the climbing sectors is beyond the skills of the medical crew of the Kalymnos Hospital. 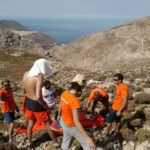 Kalliope Tsagari supported ethically and financially the formation of the Team in its first steps, by covering any expenses needed and by creating the Alternet Rescue Card, a card that offered discounts in various businesses in Kalymnos while gathering money for the Rescue Team, as a standard percentage of each card went to the Team’s budget. 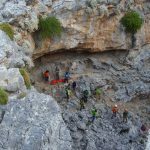 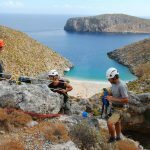 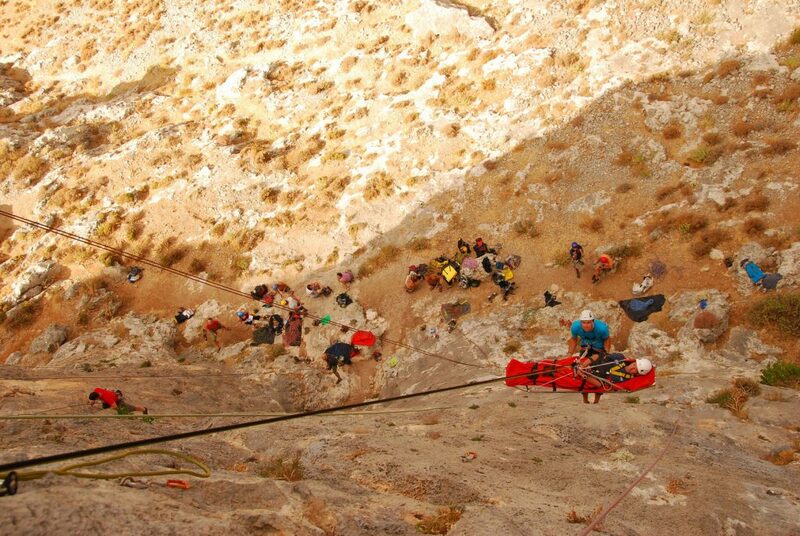 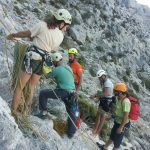 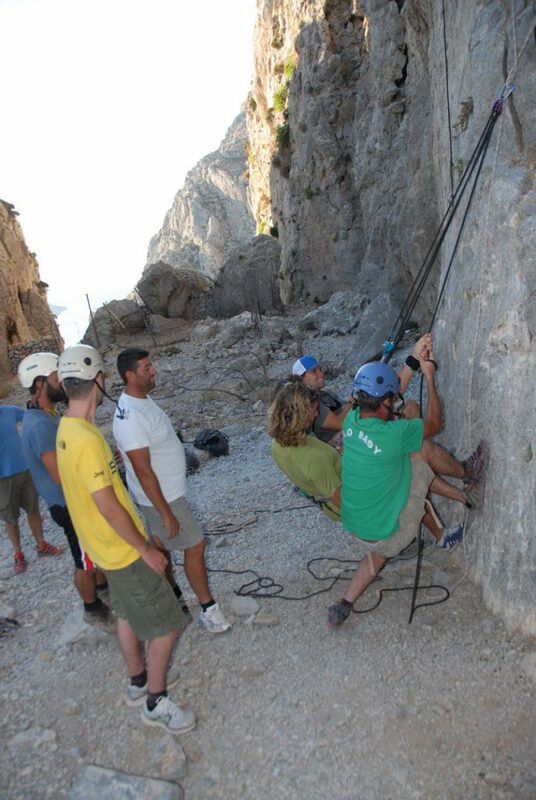 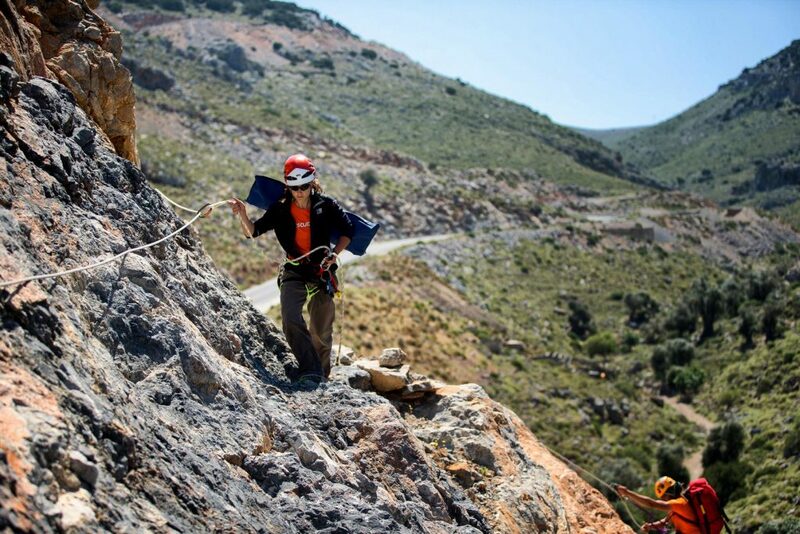 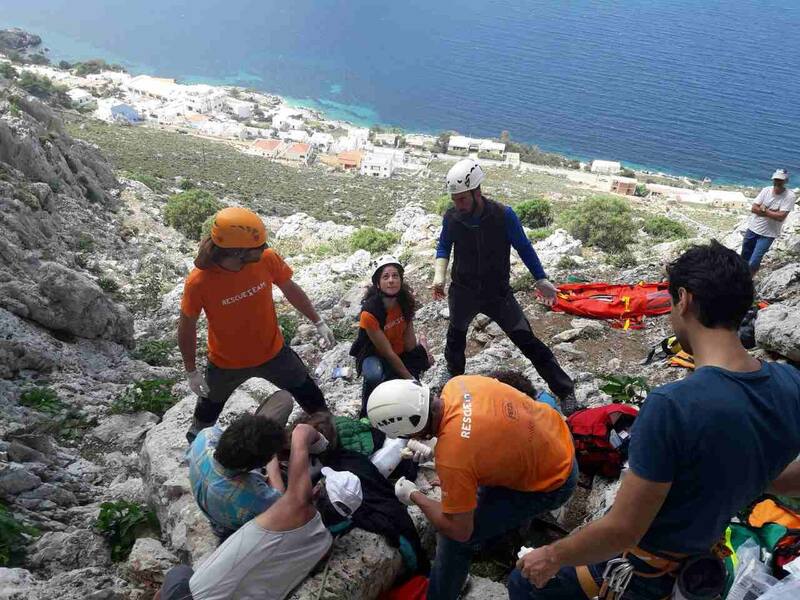 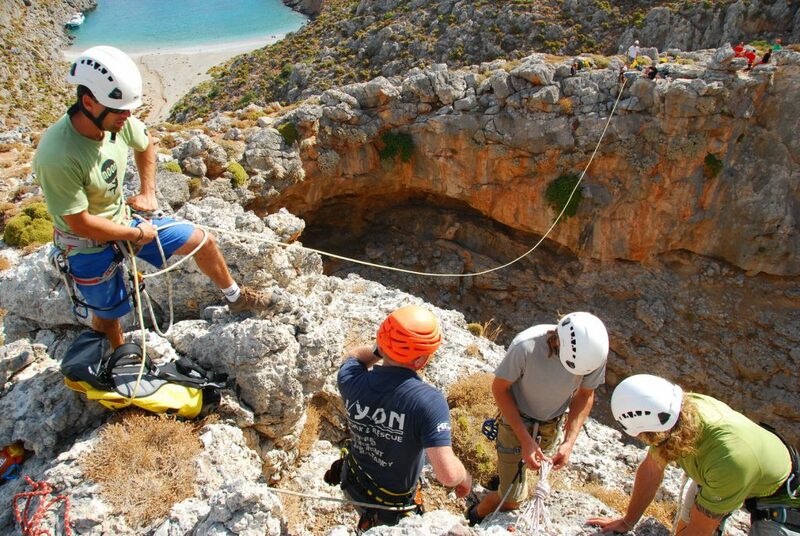 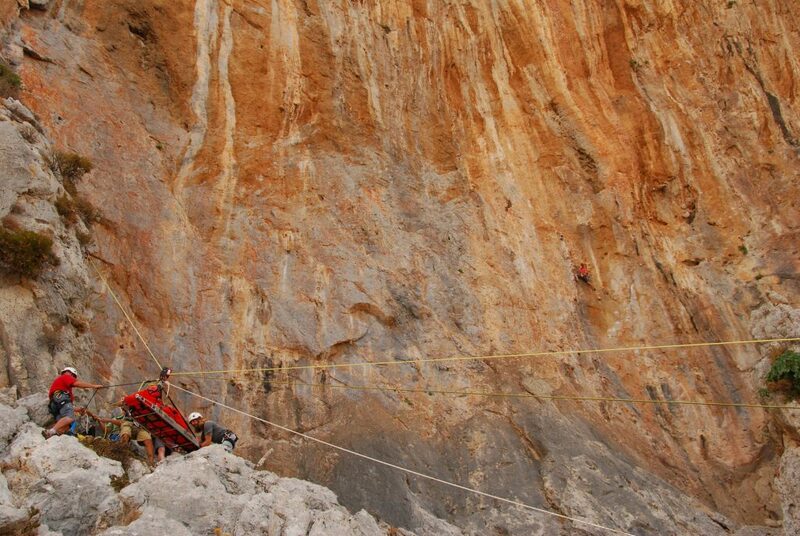 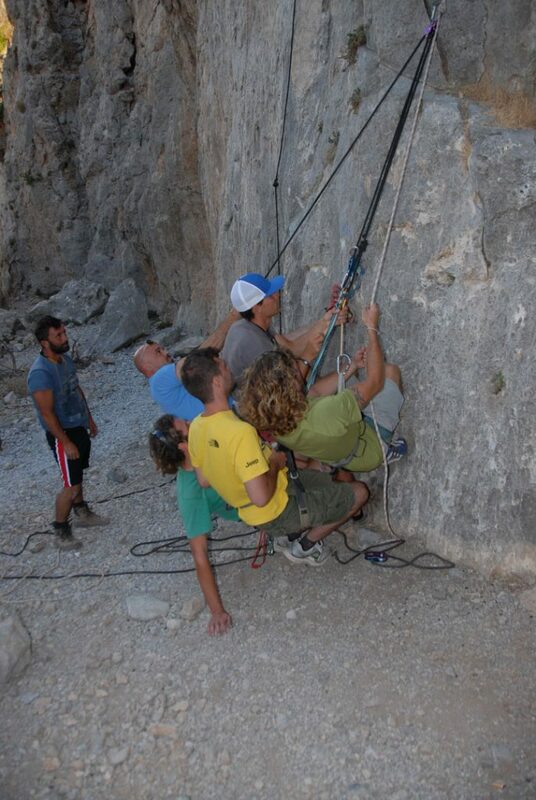 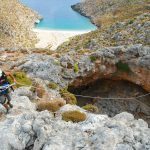 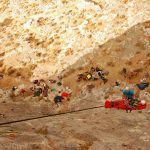 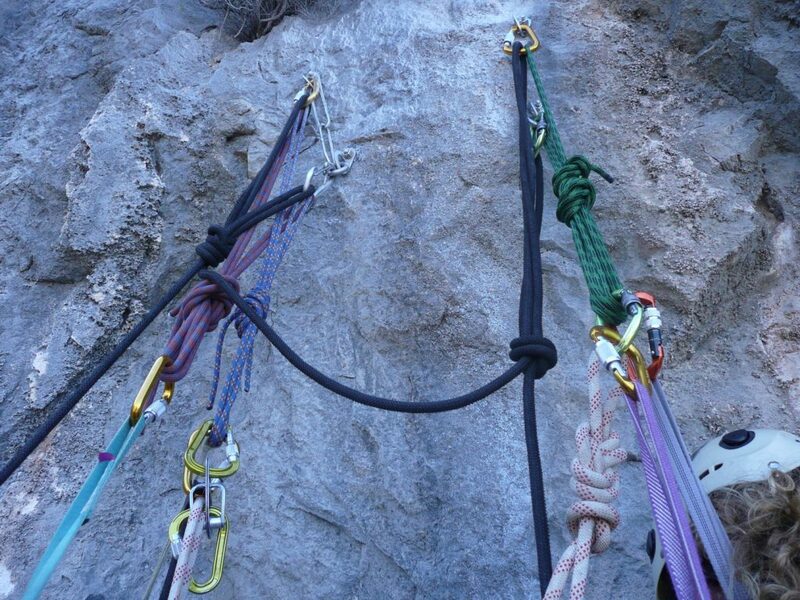 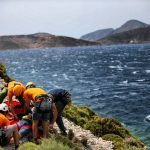 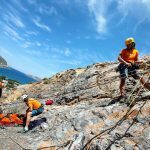 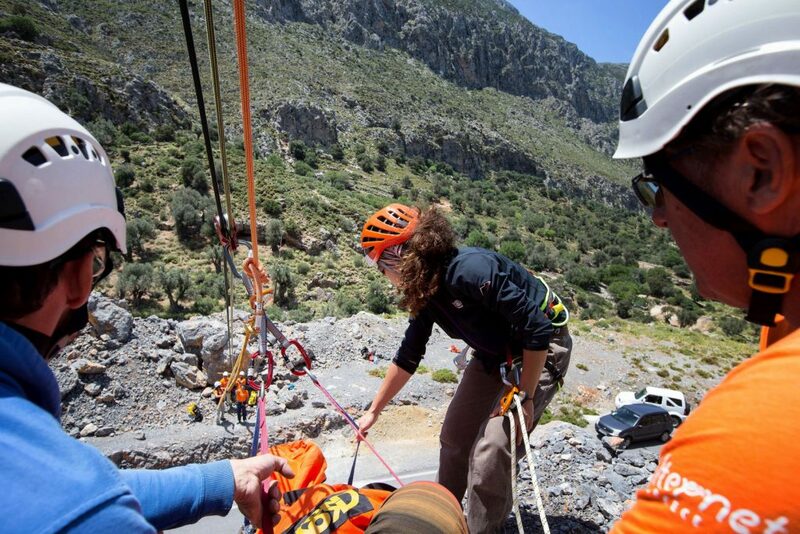 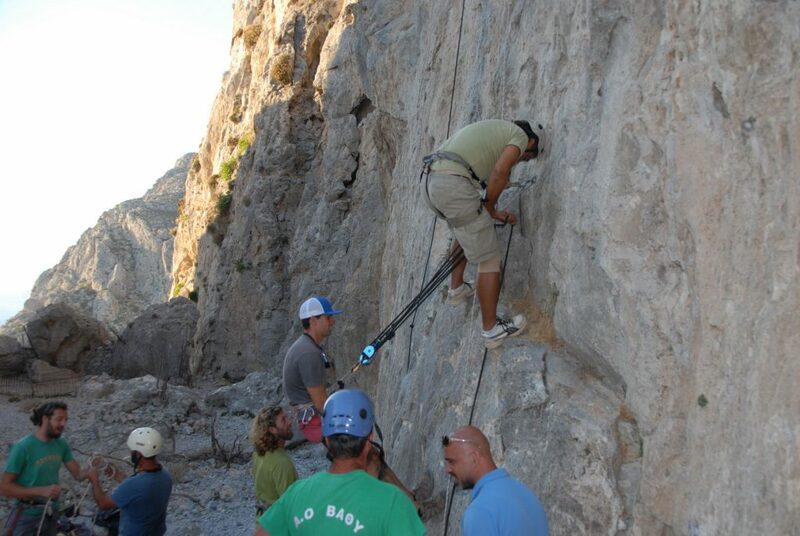 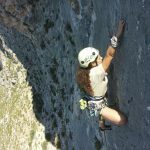 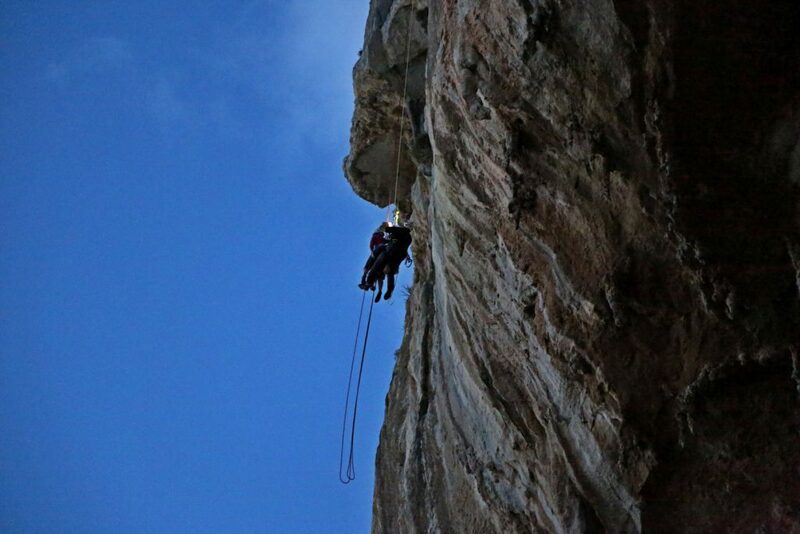 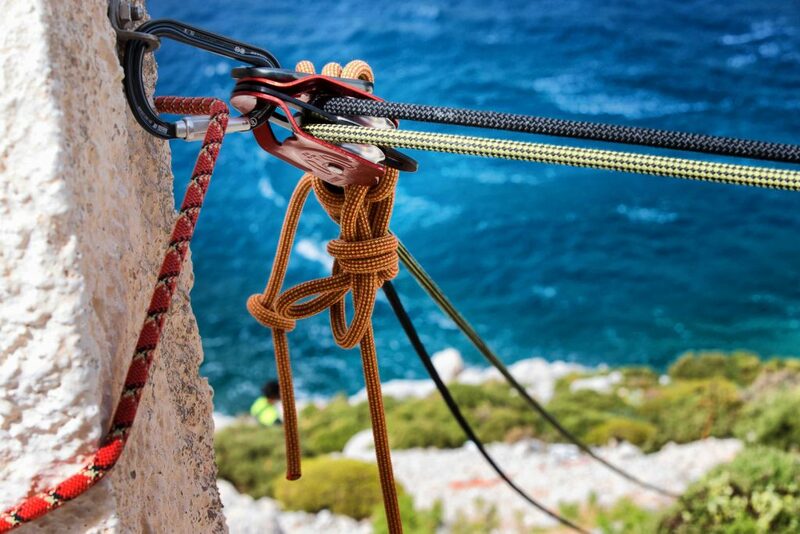 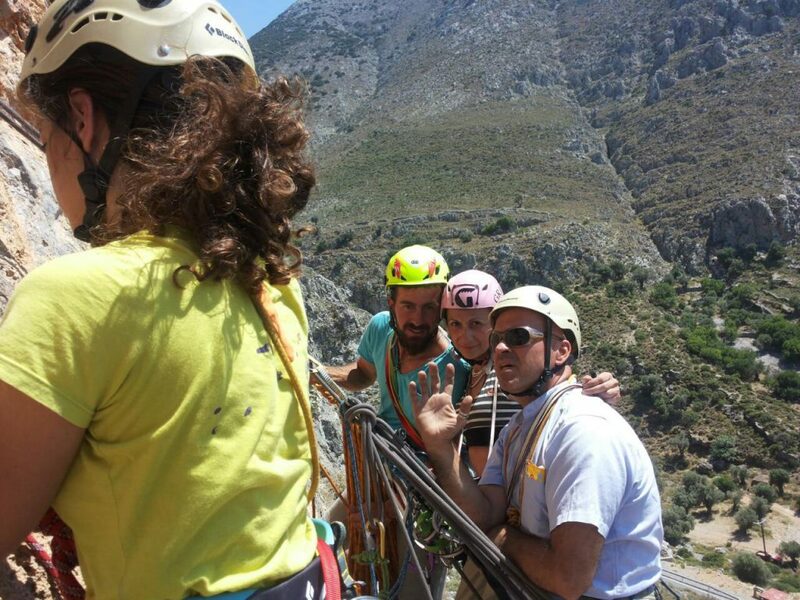 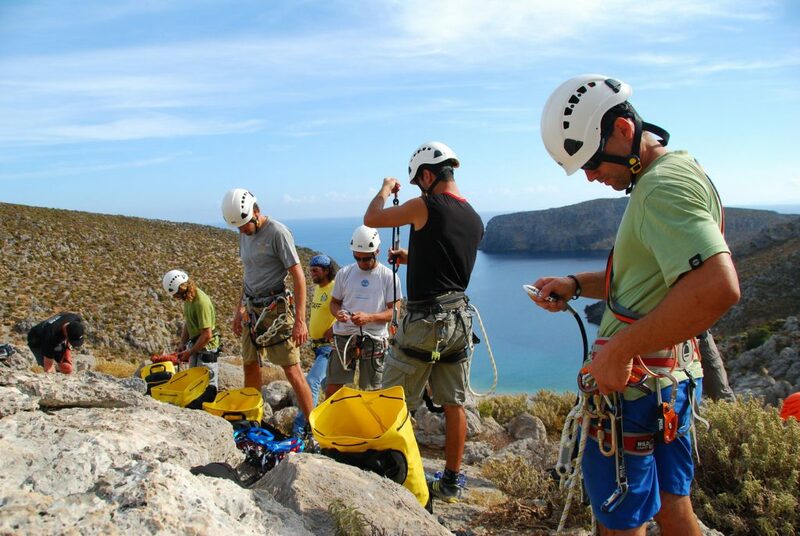 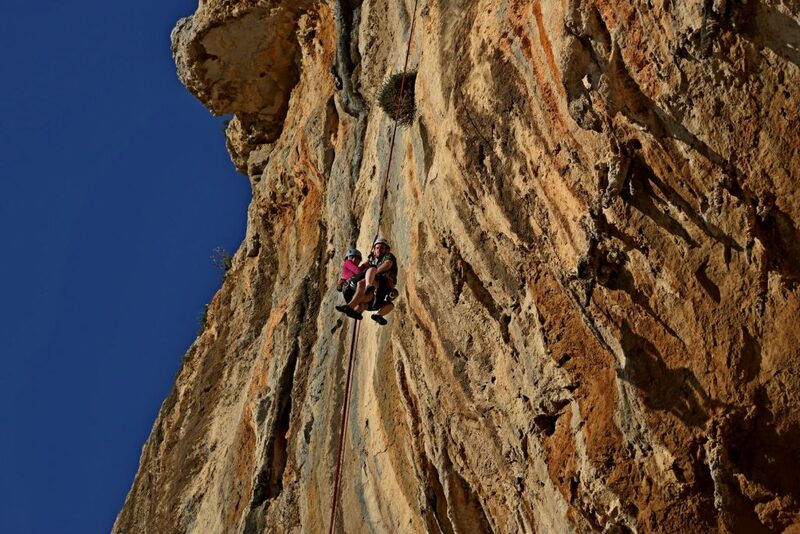 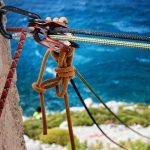 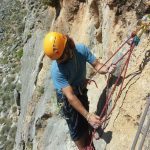 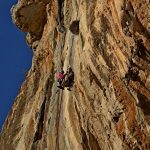 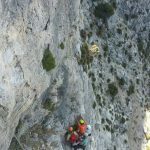 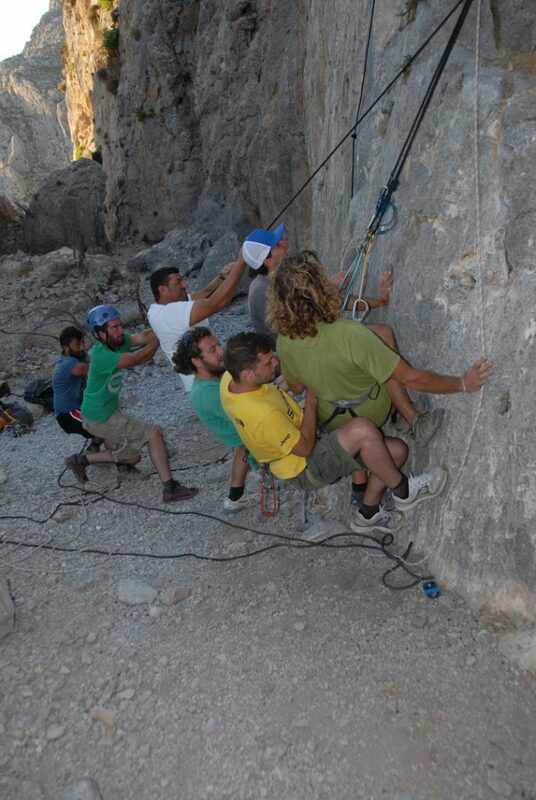 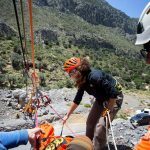 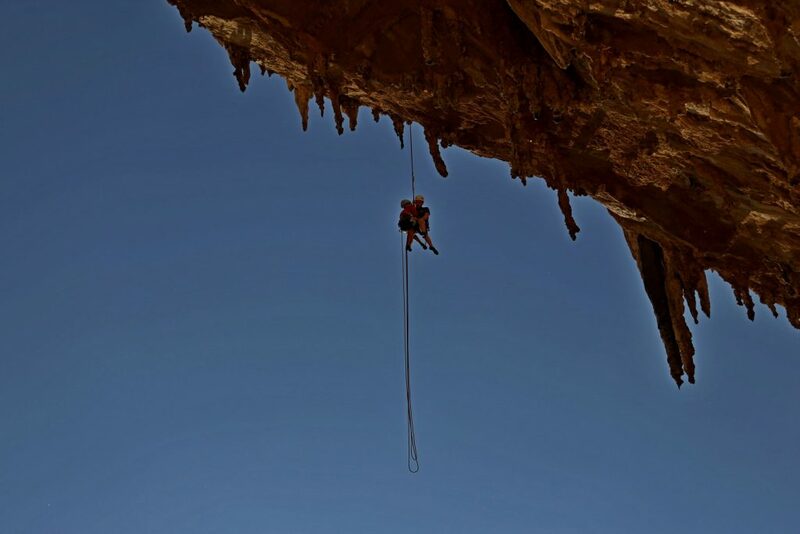 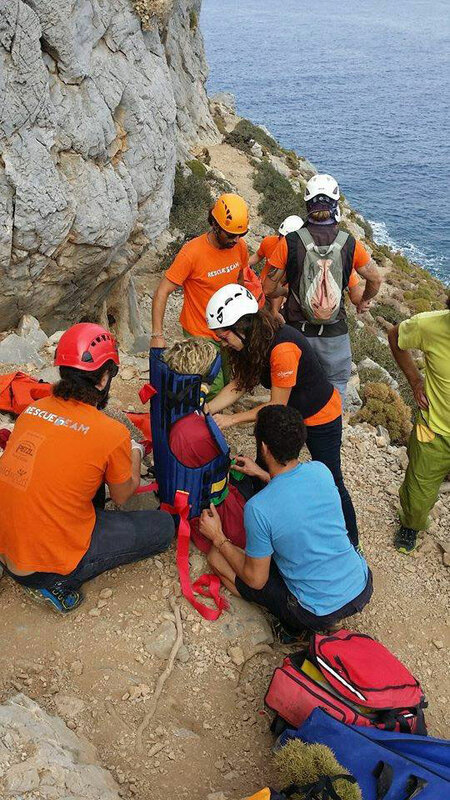 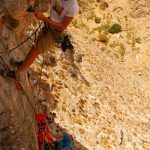 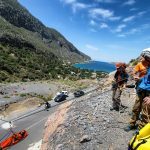 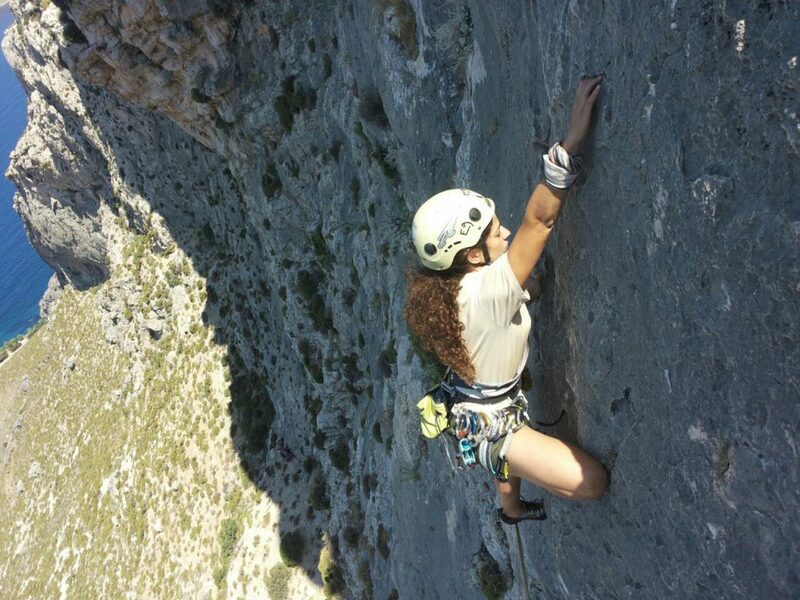 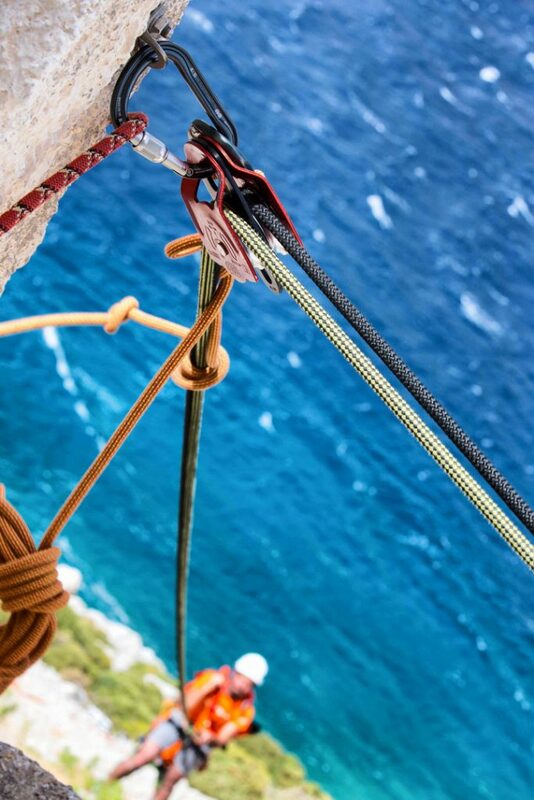 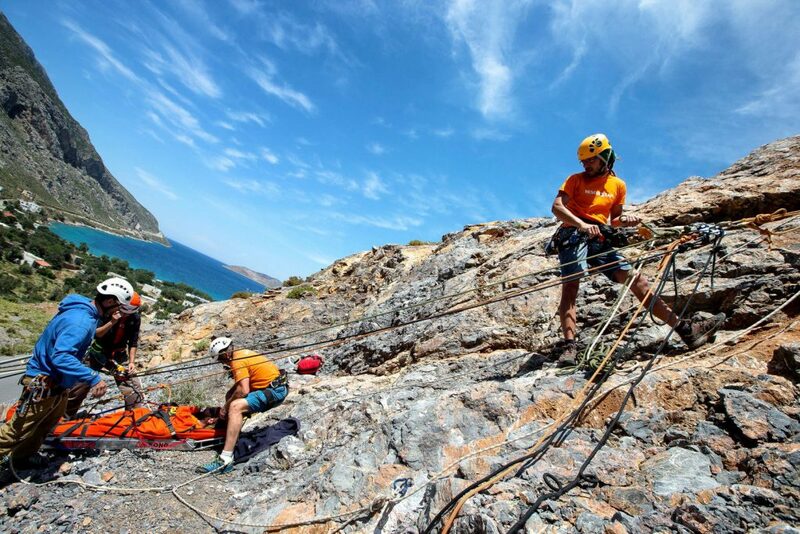 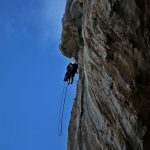 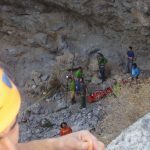 The idea of a Rescue Team in Kalymnos was instantly adopted also by another businesswoman in Kalymnos, Sofia Lagoudi, owner of Wildsport climbing shop. 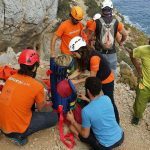 Wildsport became the basic sponsor of the team in terms of rescue equipment, as all the technical gear used in trainings and in actual rescue, were offered by Mrs Lagoudi. 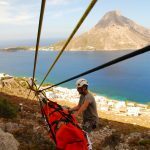 Consequently, Kalymnos Rescue Team was founded, counting 20 other local people who believed in this project and became founding members. 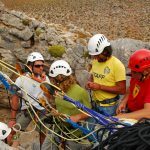 Presently, the Team consists of 25 people, climbers and non-climbers and within it, a sub-team, the technical crew, with trained members in rope rescue techniques and first aid. 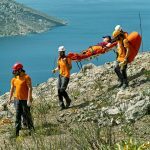 They aid in any way they can in a rescue, or in the Team organization aspects. 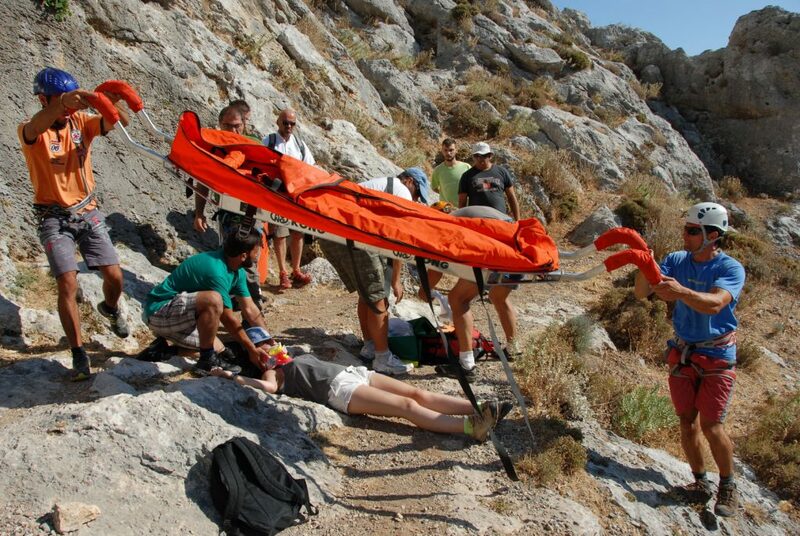 Trained members in rescue and first aid. 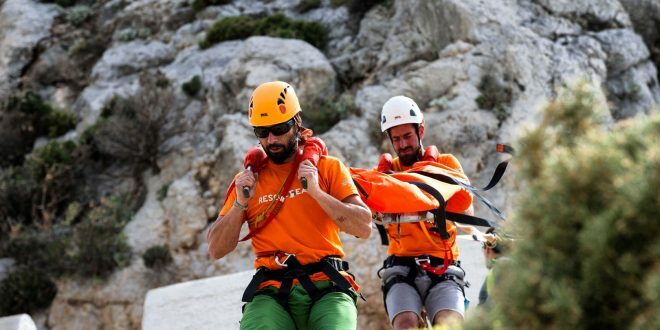 This team consists of very experienced climbers and mountaineers but also of inexperienced members that found in the Rescue Team a really good motivation to evolve their climbing skills and keep training to reach a good level. 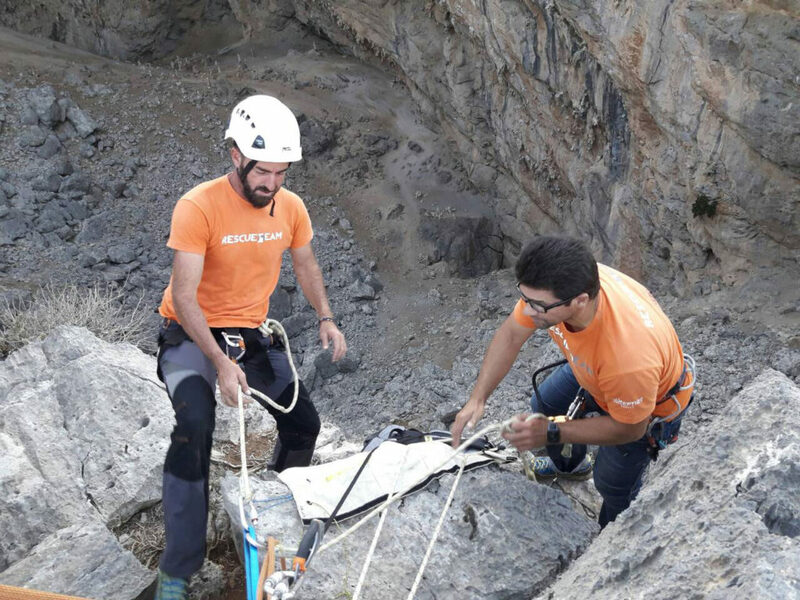 The technical team tries to train constantly, to add experience in its dynamics, and our goal is to learn from the best in the Rescue field, like Organizations in countries with great mountaineering history and high mountains. 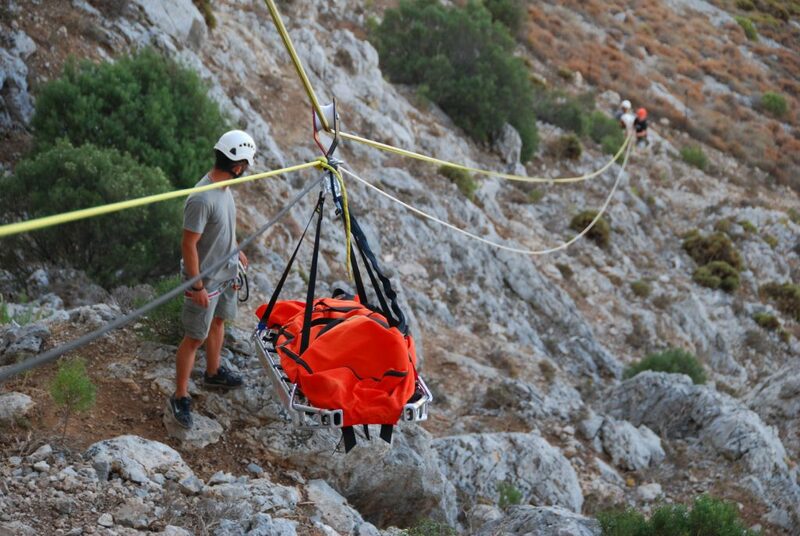 The Team operates from sunrise to sunset, in order to assure the rescuers’ personal safety. 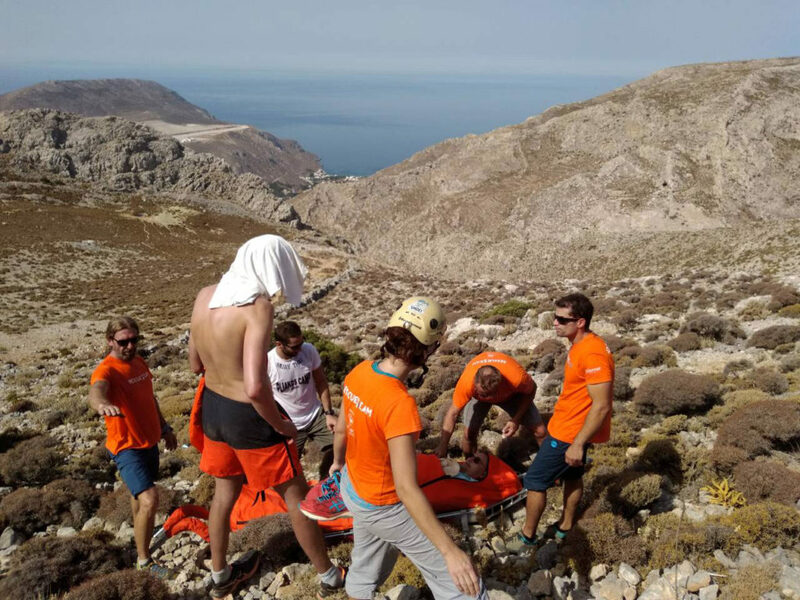 The best way for somebody to find us in case of emergency, is to call 112 the European emergency number, without charge and with network coverage all over the island, and ask to be connected to the Hospital of Kalymnos. The hospital calls directly us and we get to the place of the accident. 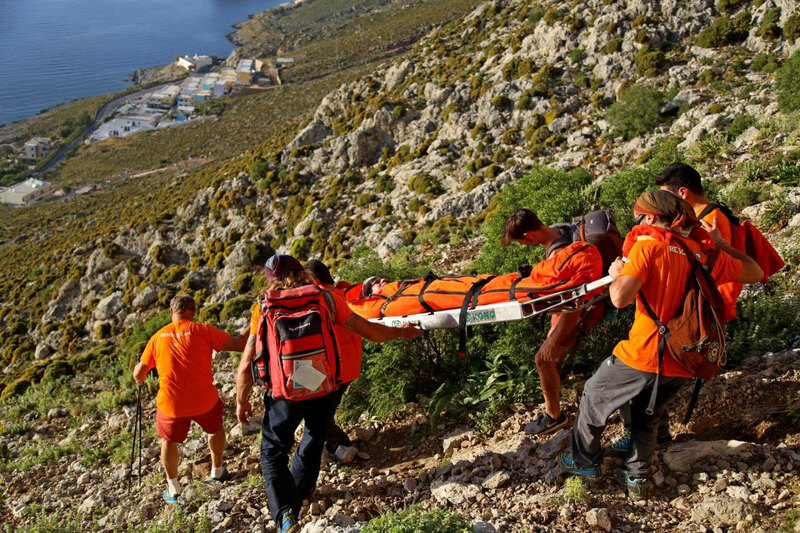 Are there multiple people injured? 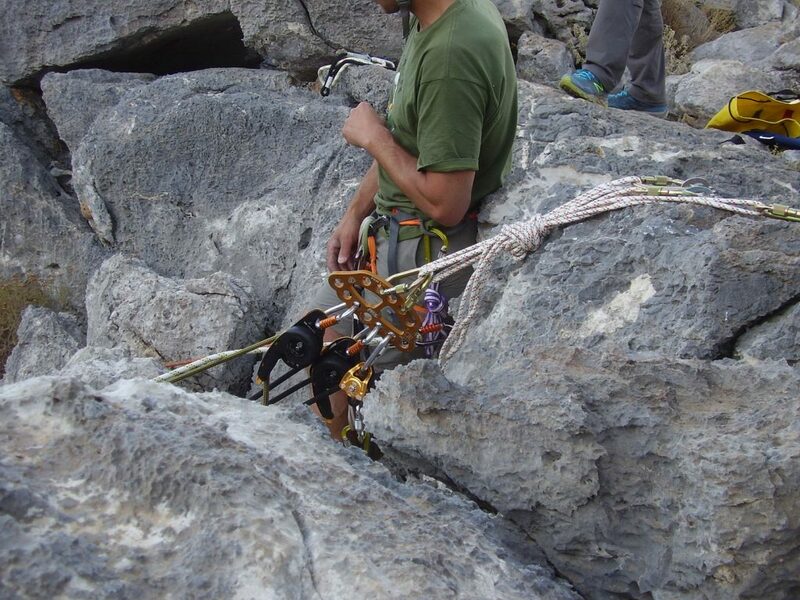 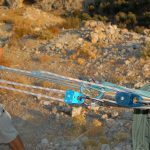 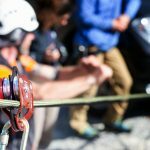 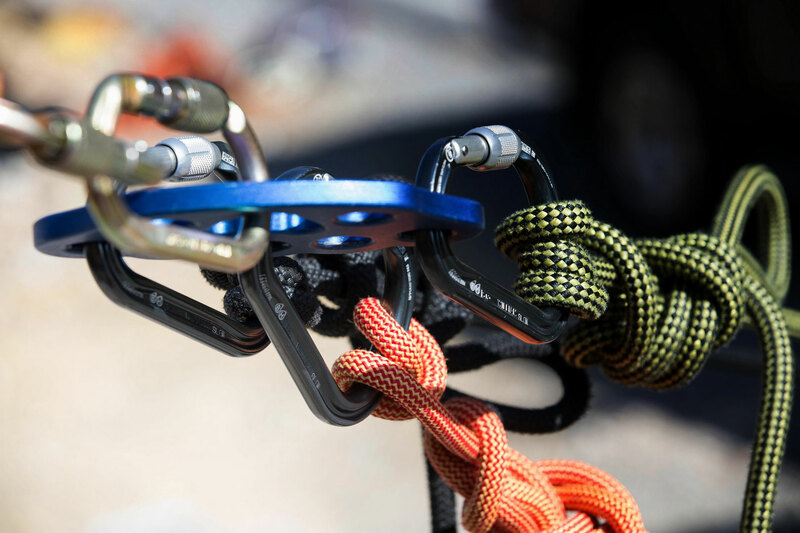 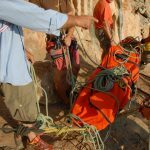 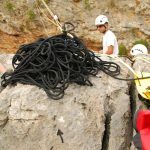 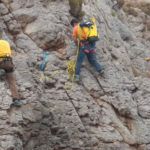 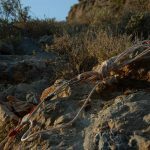 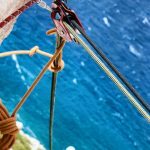 All this information can help us prepare correctly for the rescue, as in many cases we need to use rope techniques to approach and carry the casualty. 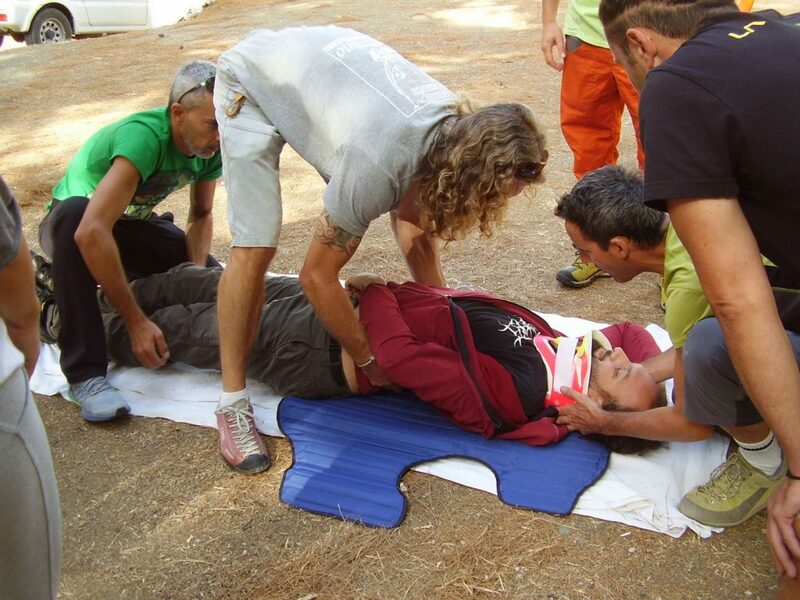 Caution: Do not try to move or interfere with the casualty for no reason, as you might cause worse damage and also you make our first aid assessment more difficult. 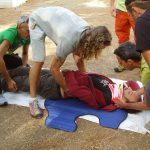 Leave the first aid practice only for those who are trained to do so. 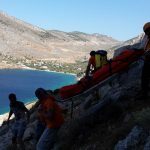 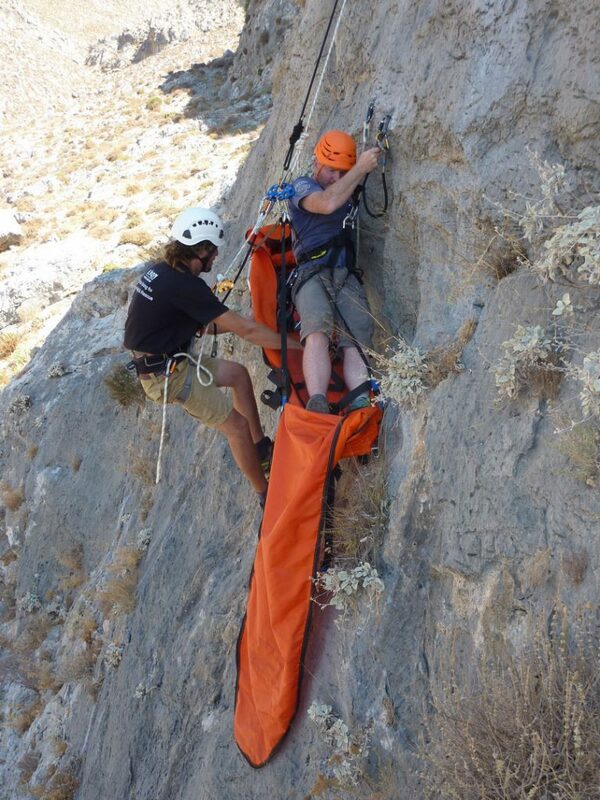 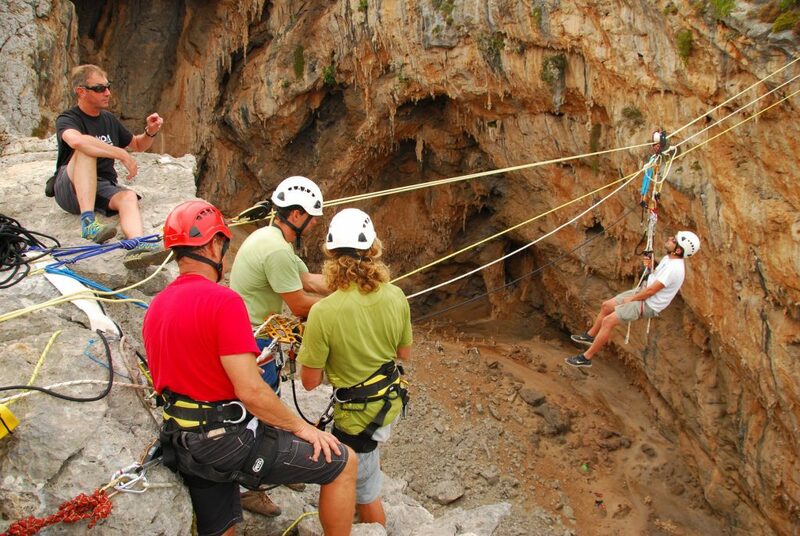 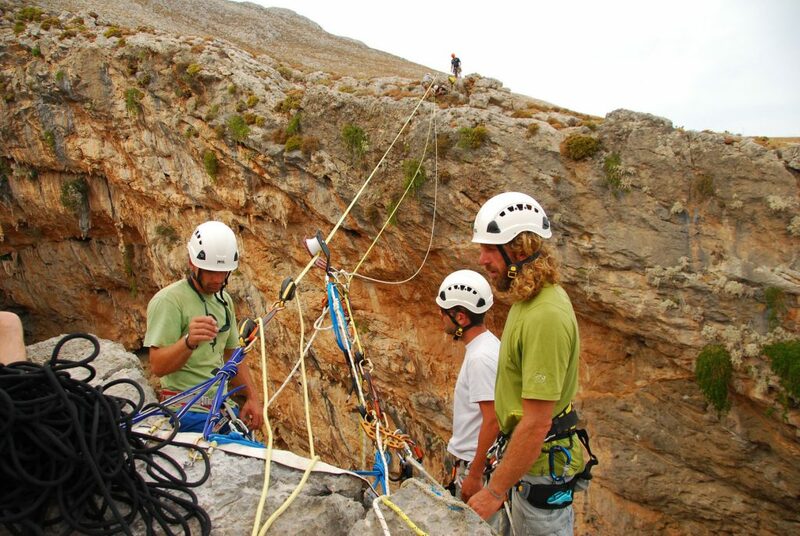 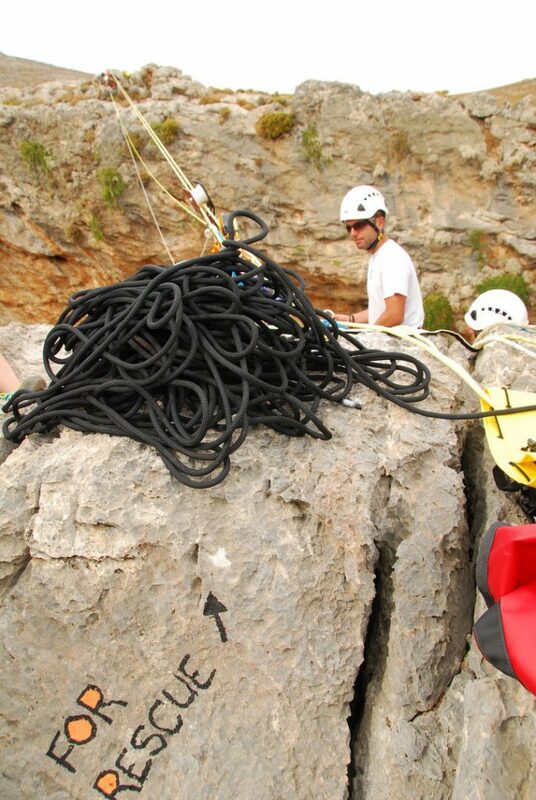 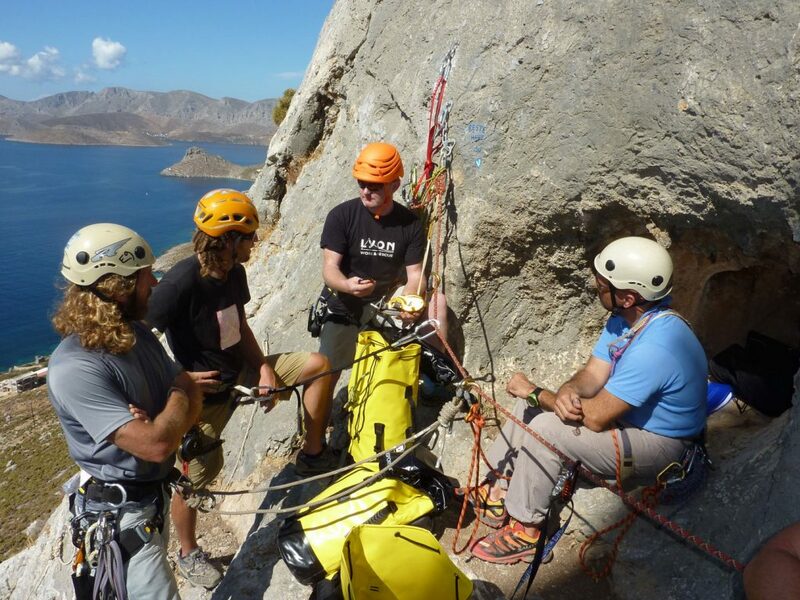 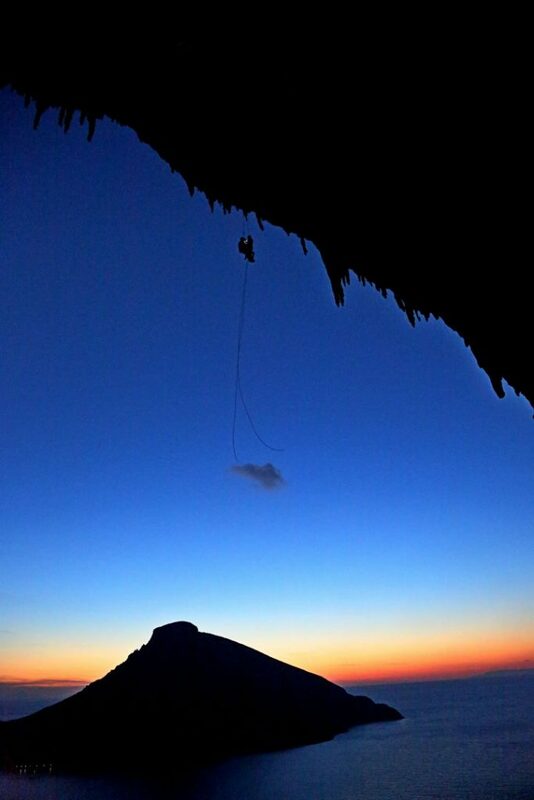 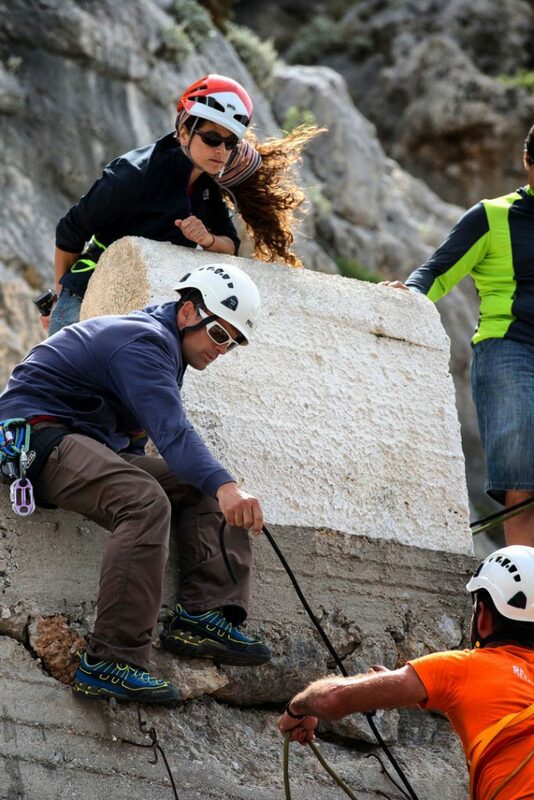 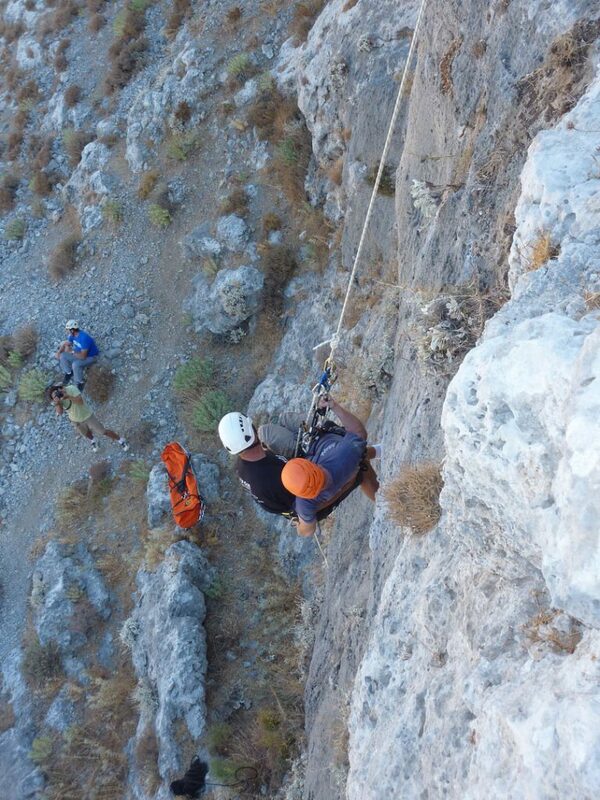 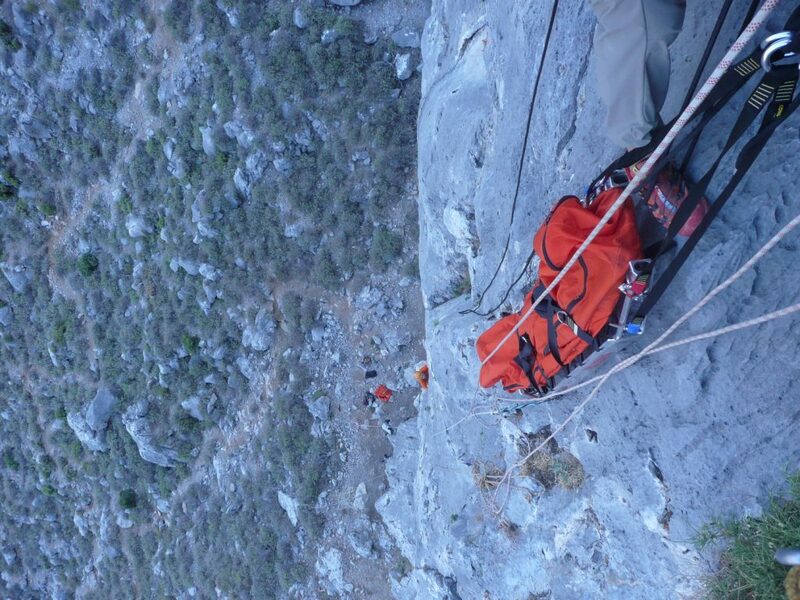 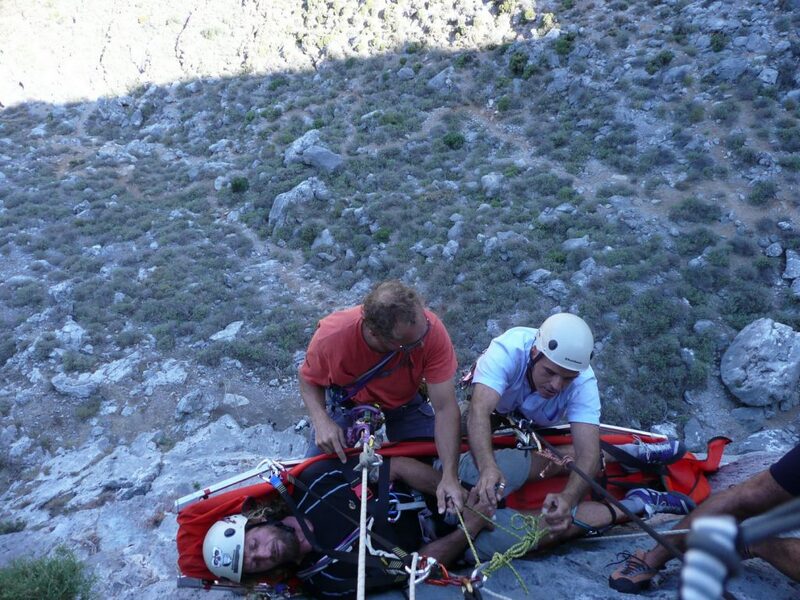 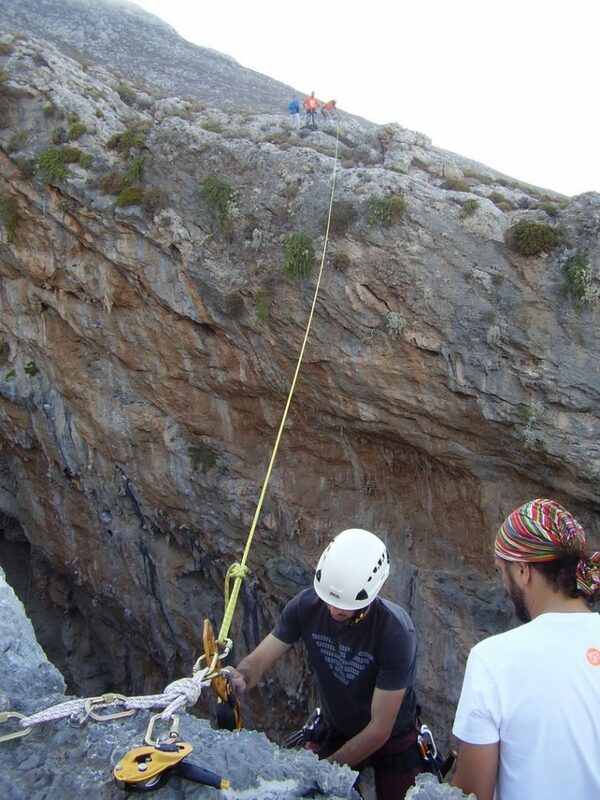 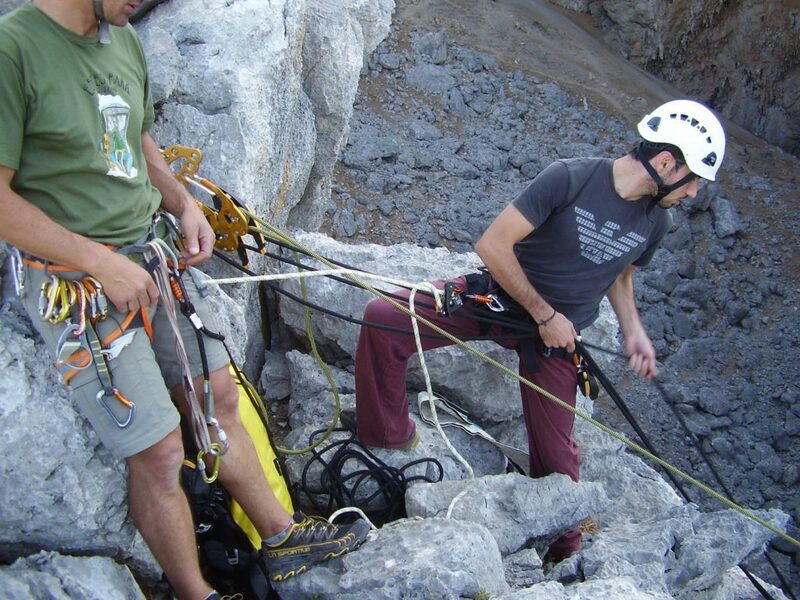 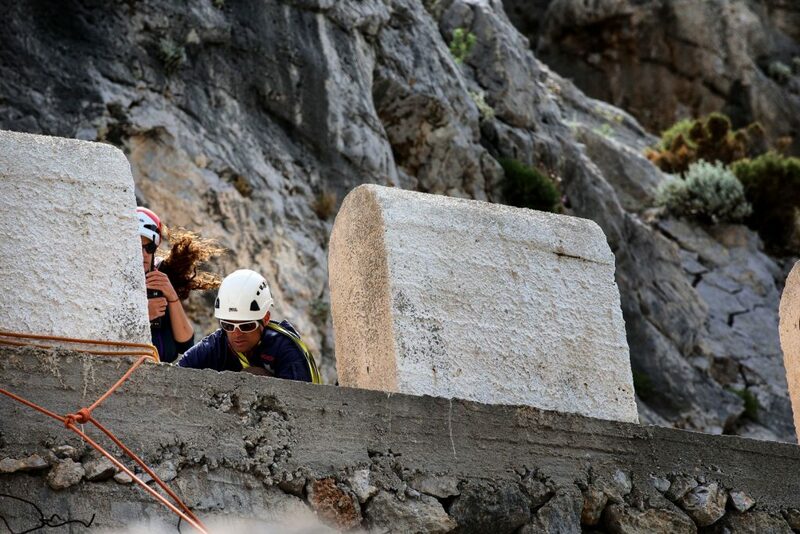 Make your contribution to Kalymnos Rescue Team. 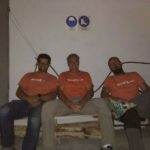 Write something about the team. 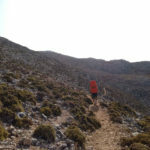 Fields marked with * are required. 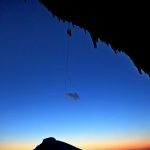 Your E-mail address won't be published. 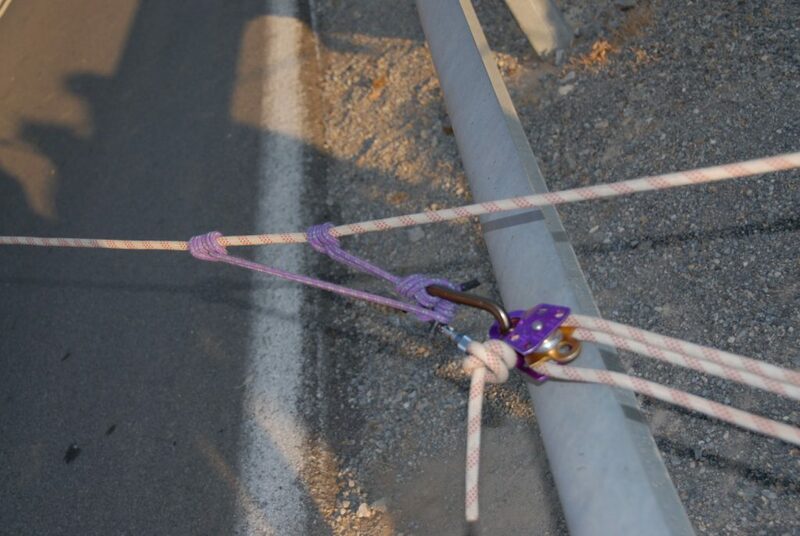 For security reasons we save the IP address 34.230.84.215. 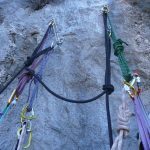 It's possible that your entry will only be visible in the guestbook after we reviewed it. 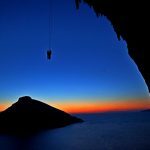 We reserve the right to edit, delete, or not publish entries. 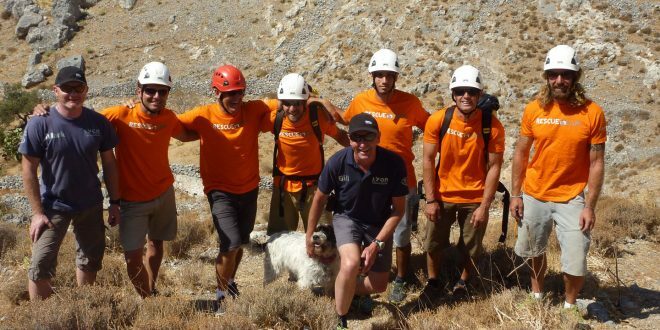 Dear Rescue-Team with Claude as the leader! 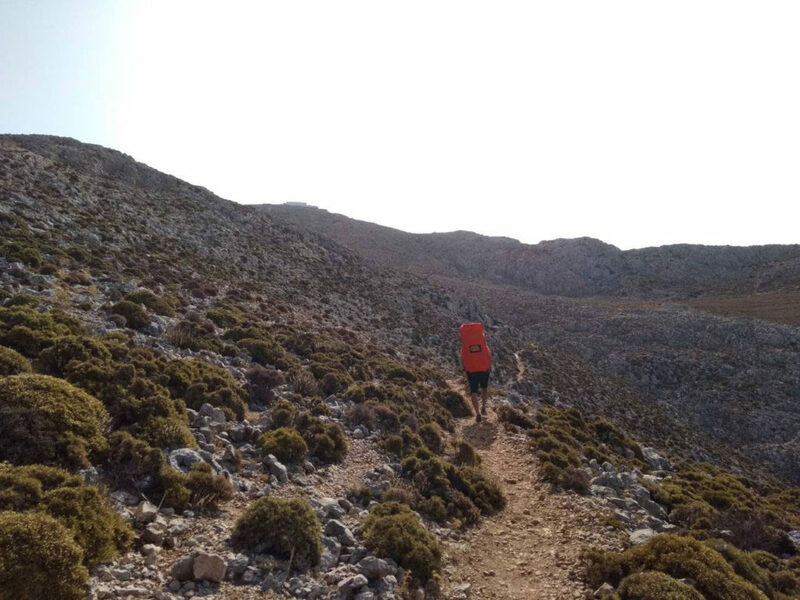 With the rupture of my meniscus it was not possible to get back to "civilization" by myself. 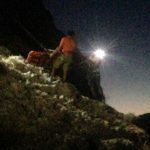 Thank you so much for your great help a few days ago! 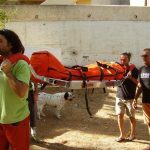 When you are visiting kalymnosrescueteam.org or send e-mails, you are contacting it online. 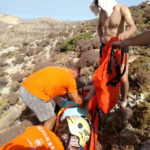 Subsequently, you agree that, in turn, kalymnosrescueteam.org has the right to contact you online as well. 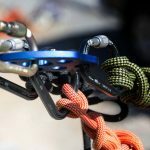 You agree in advance that online e-mails and information conveyed through those e-mails, meet the legal requirements and regulations in strength regarding the exchange of such mails in written e-form. 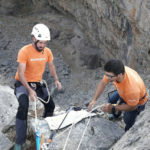 The entire content of kalymnosrescueteam.org such as, indicatively albeit not bindingly, texts, graphics, commercial logos, images (irrespective of characteristics), digital files, and software are the exclusive property of the kalymnosrescueteam.org website or of the content’s providers who collaborate with the website. 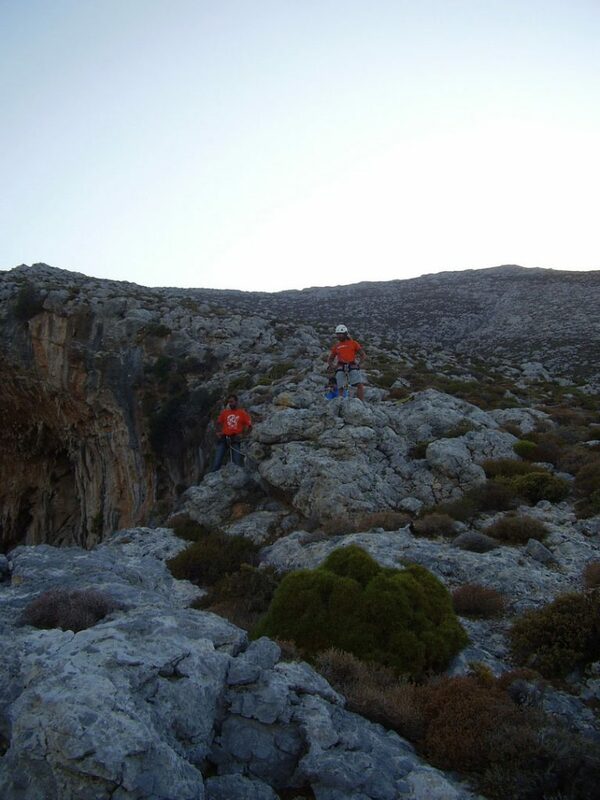 It is protected by Greek and International laws governing the protection of intellectual rights. 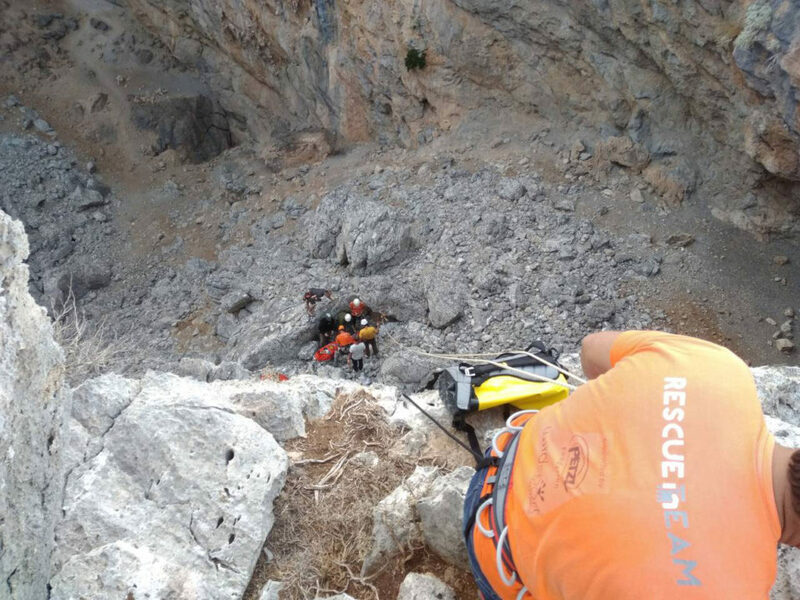 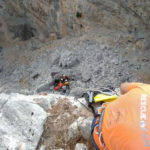 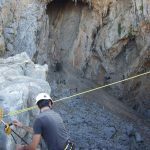 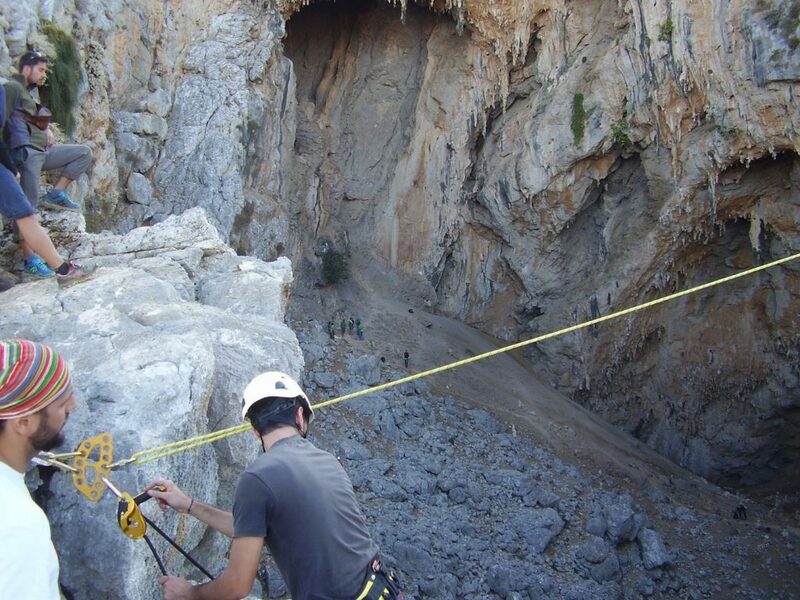 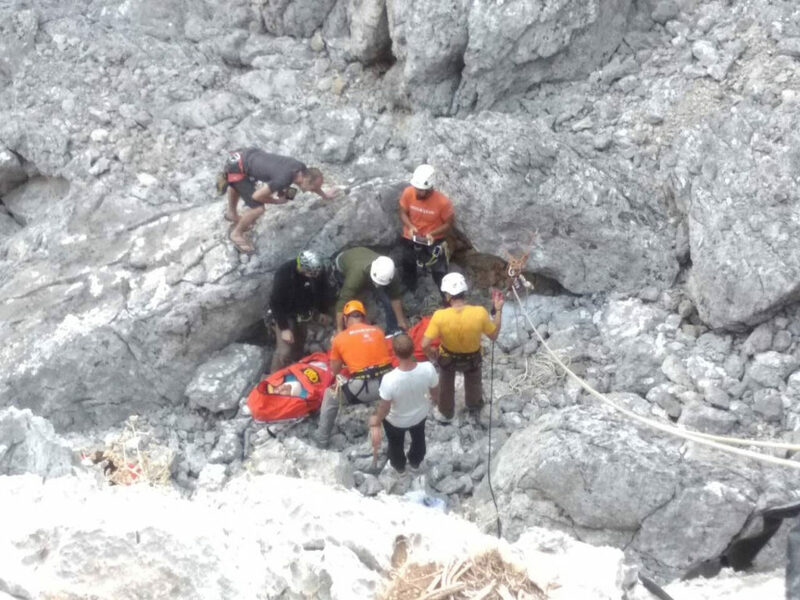 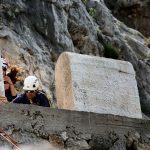 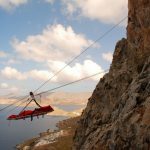 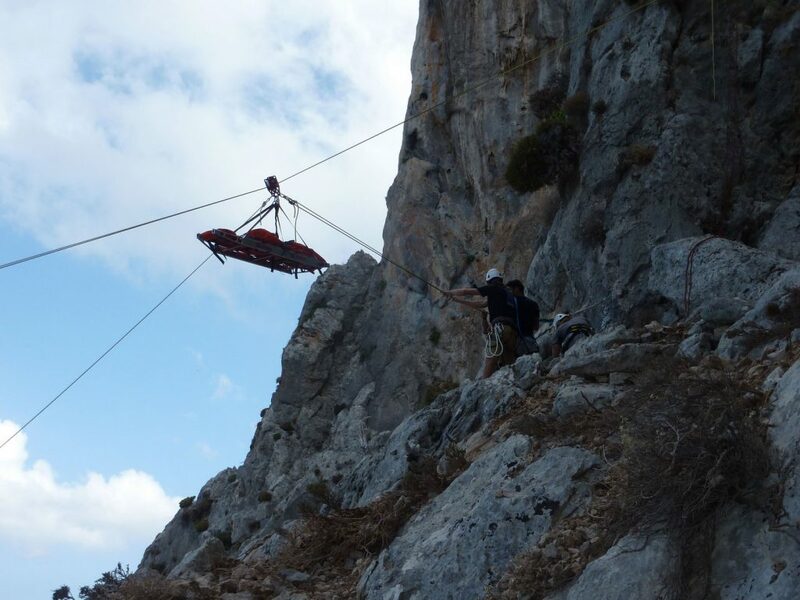 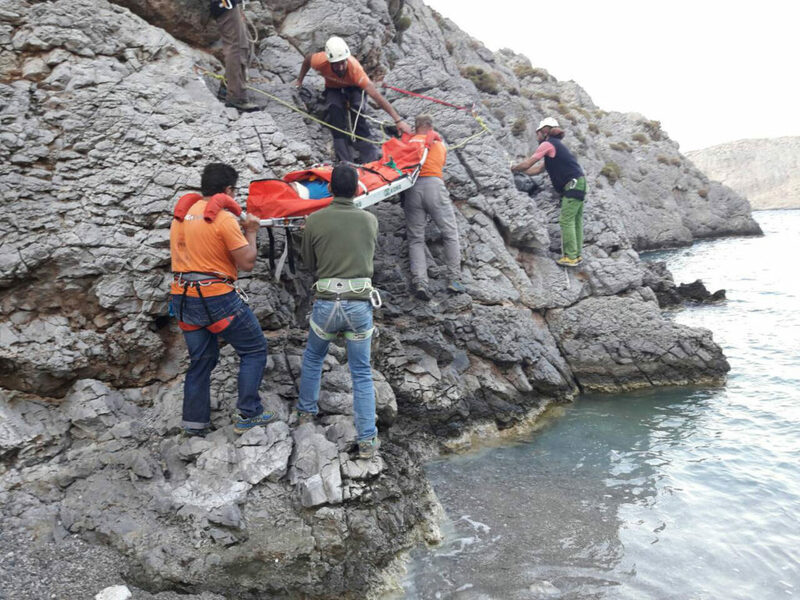 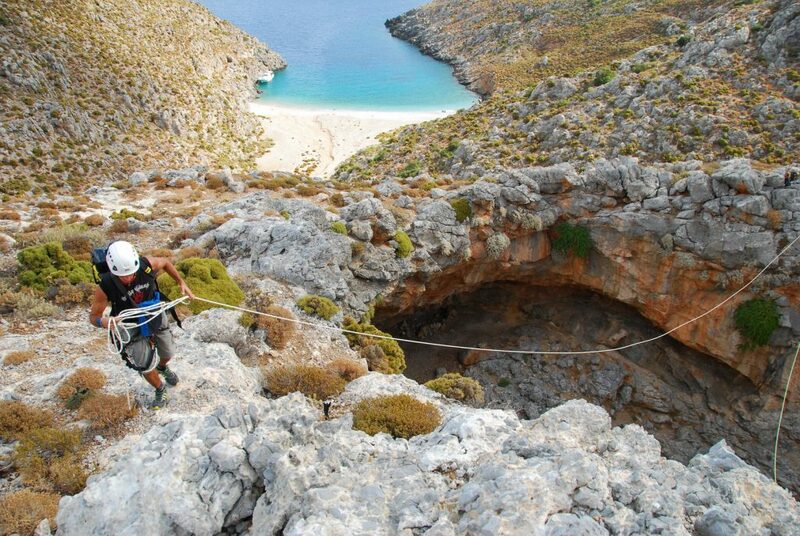 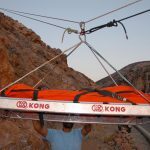 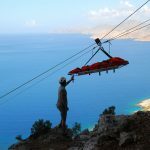 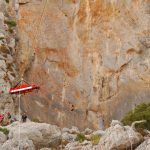 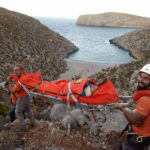 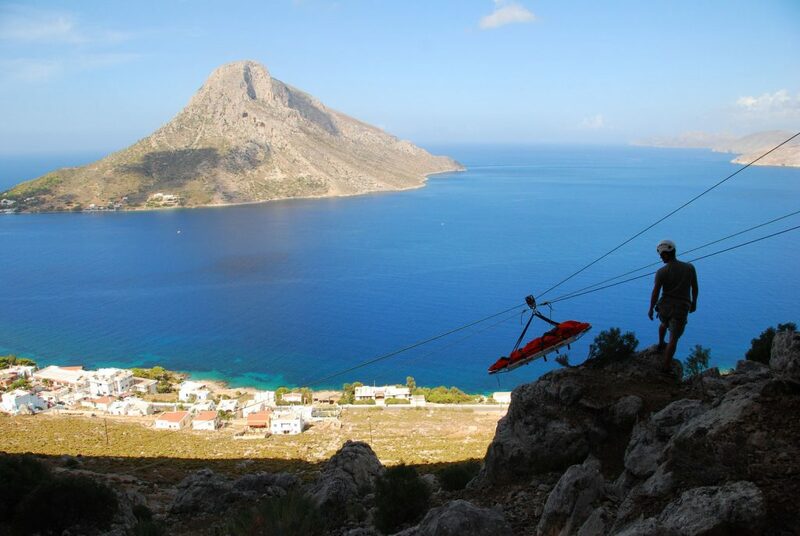 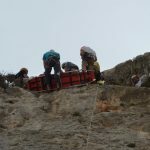 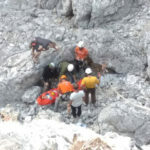 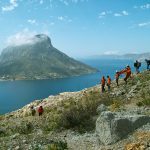 Indirect use of the website and its contents to benefit any other enterprise, commercial or otherwise, without the written consent of Kalymnos Rescue Team is forbidden. 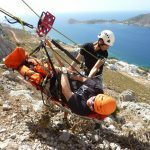 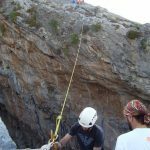 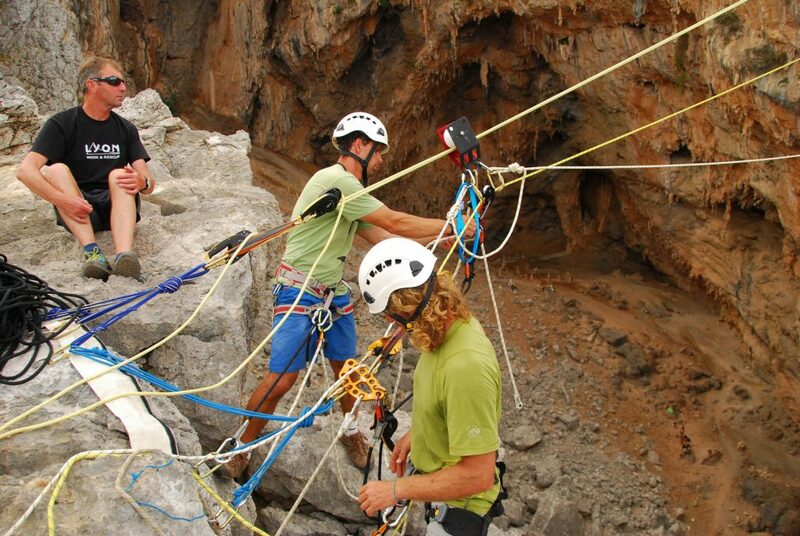 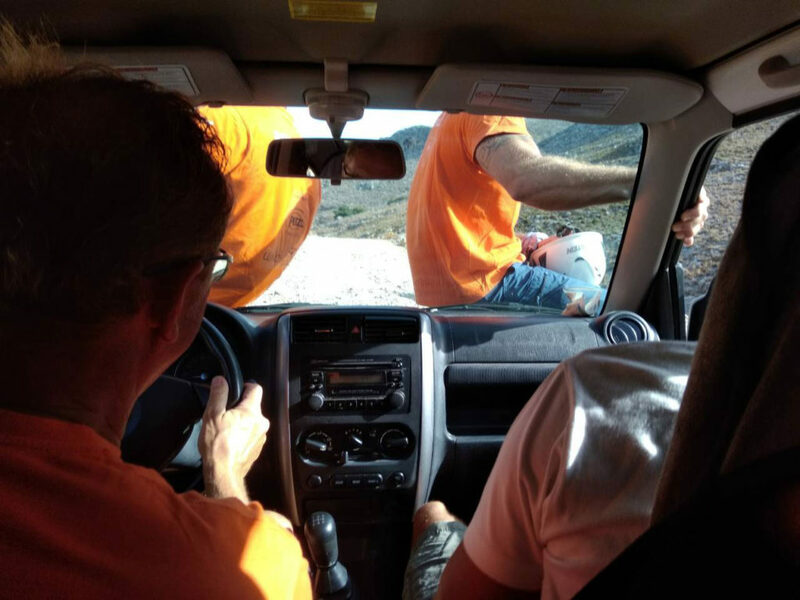 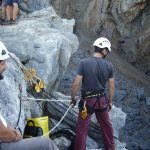 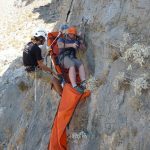 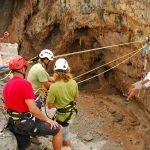 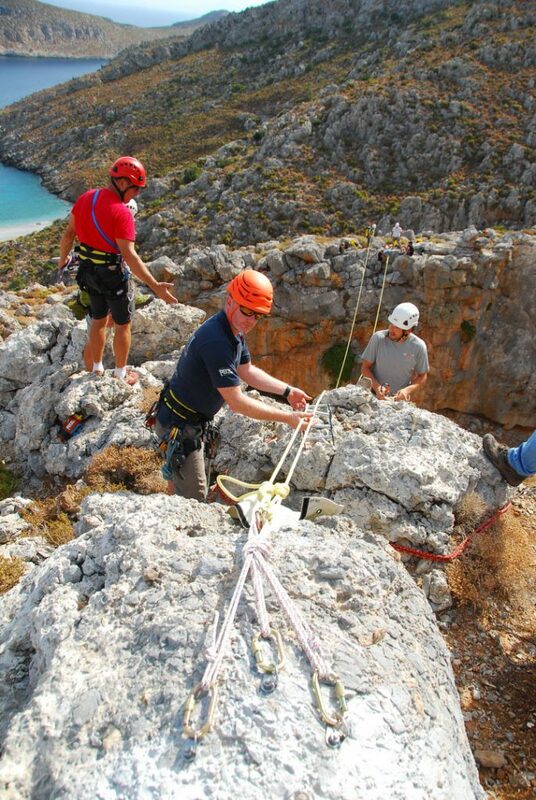 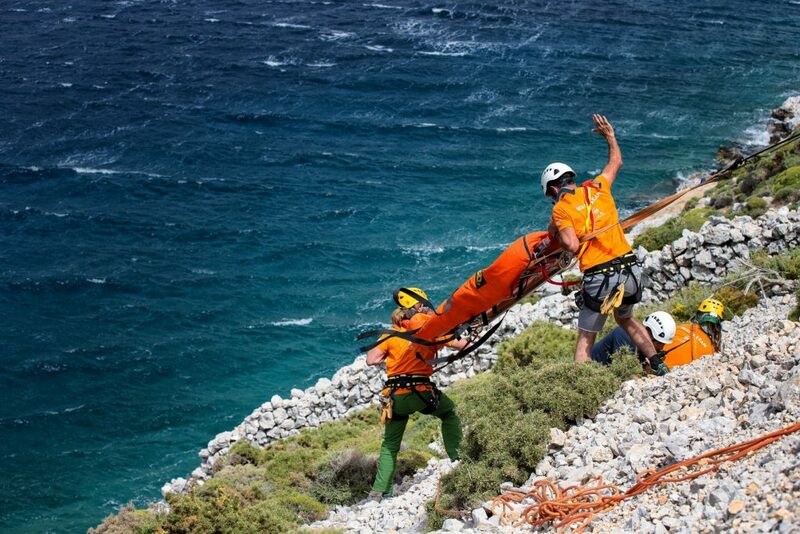 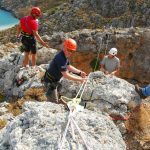 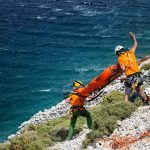 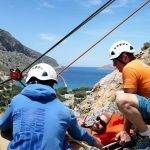 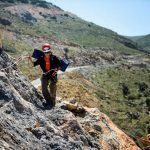 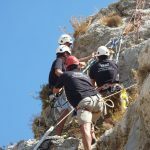 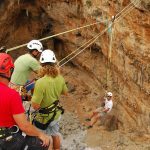 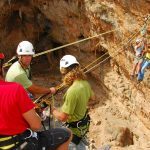 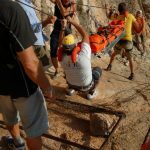 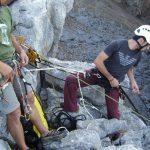 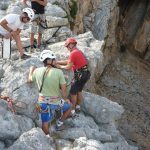 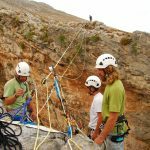 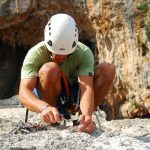 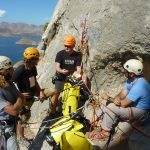 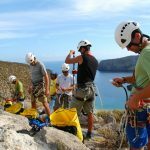 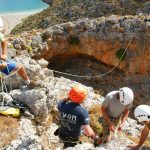 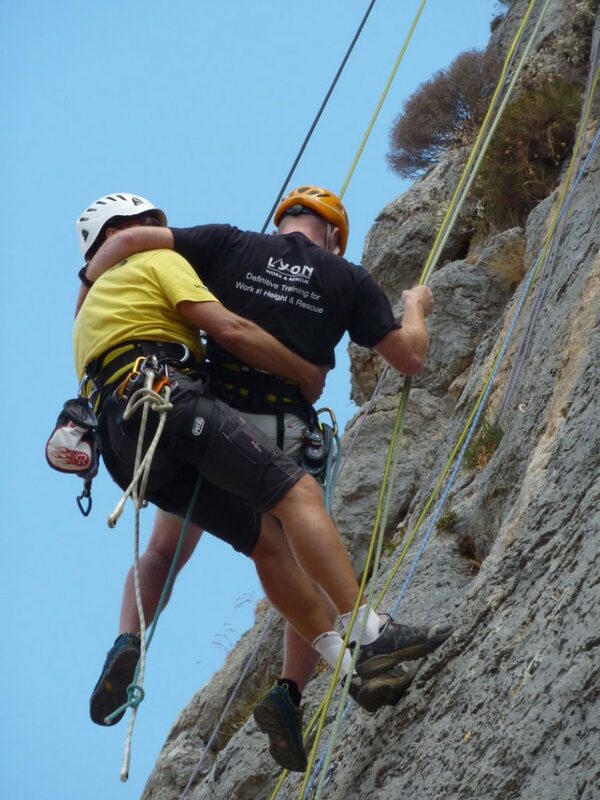 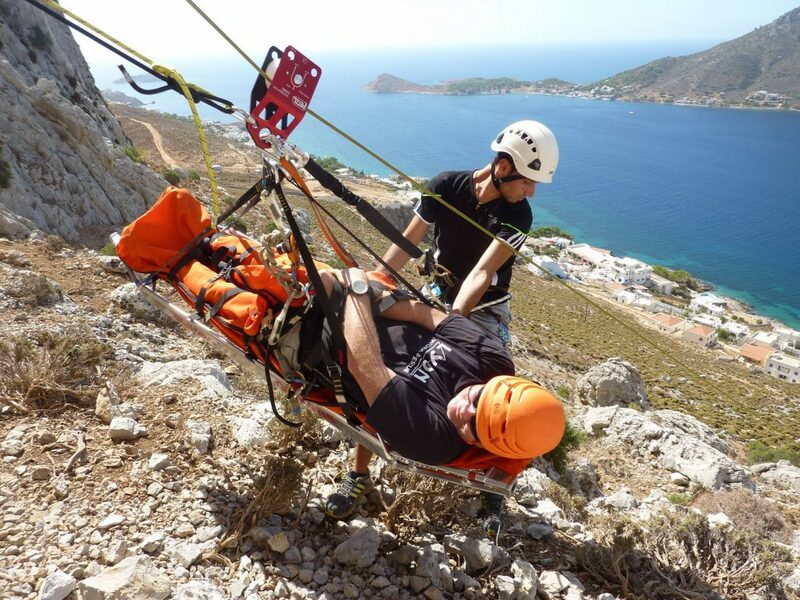 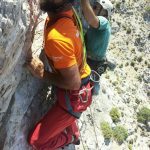 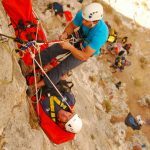 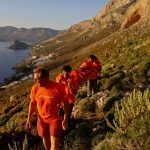 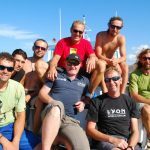 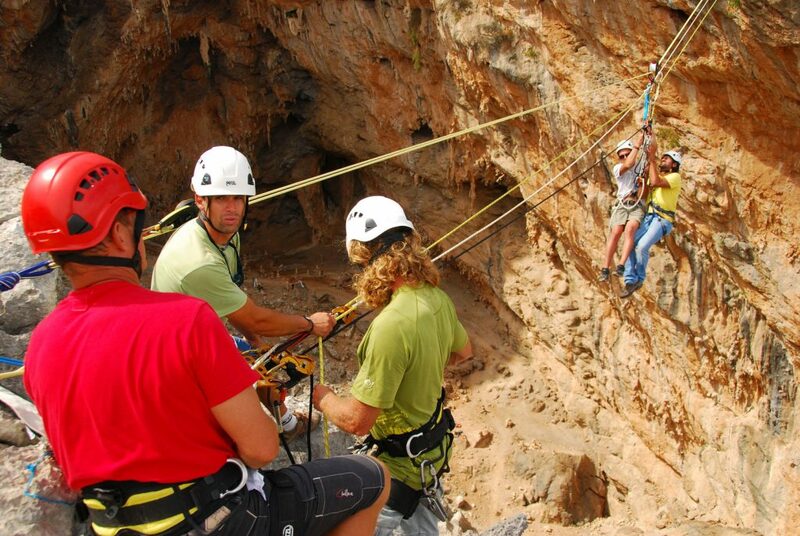 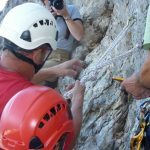 The Kalymnos Rescue Team provides limited license to access and use the kalymnosrescueteam.org website for contact with the company. 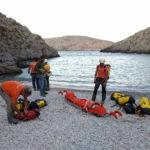 Visitors to kalymnosrescueteam.org retain a limited, recallable, and non-exclusive right to create a hyperlink with the homepage of kalymnosrescueteam.org on an online site they own, provided that said hyperlink does not describe Kalymnos Rescue Team or its services in a fraudulent, misleading, derogatory, or otherwise unpleasant manner. 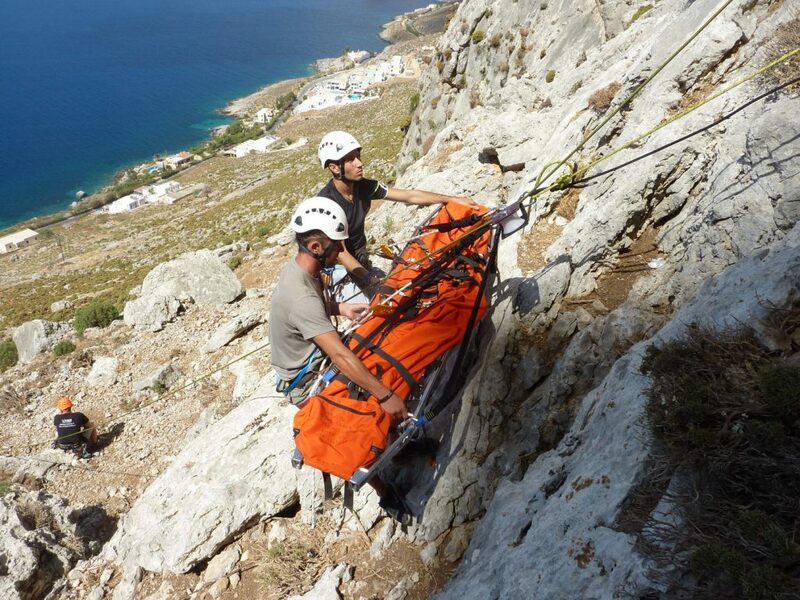 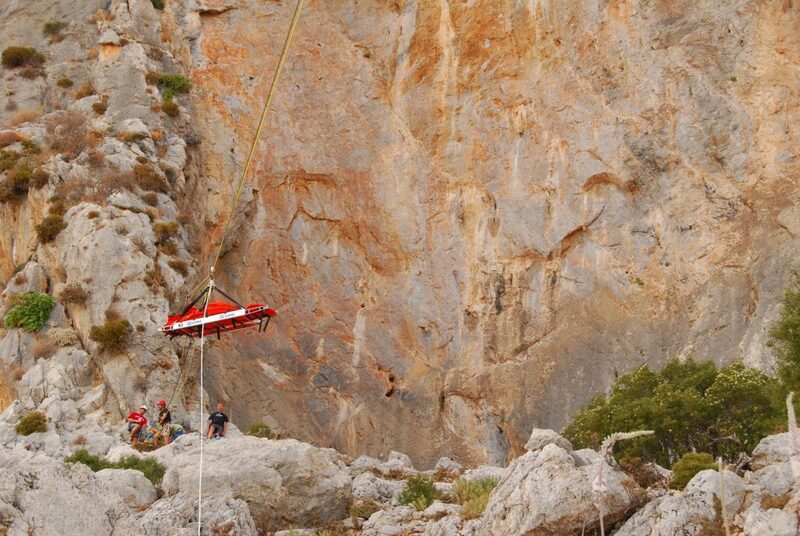 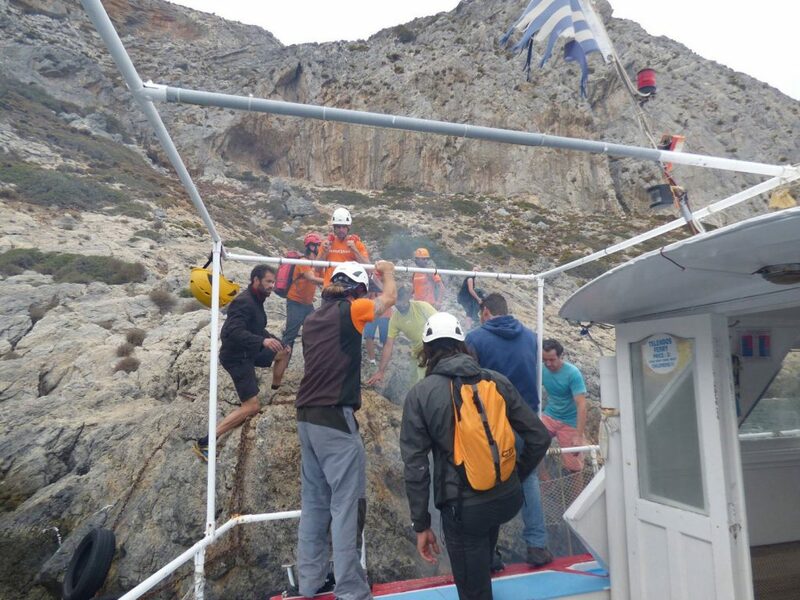 Any inappropriate use of the website signals the cessation of use or access ceded by the Kalymnos Rescue Team. 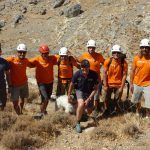 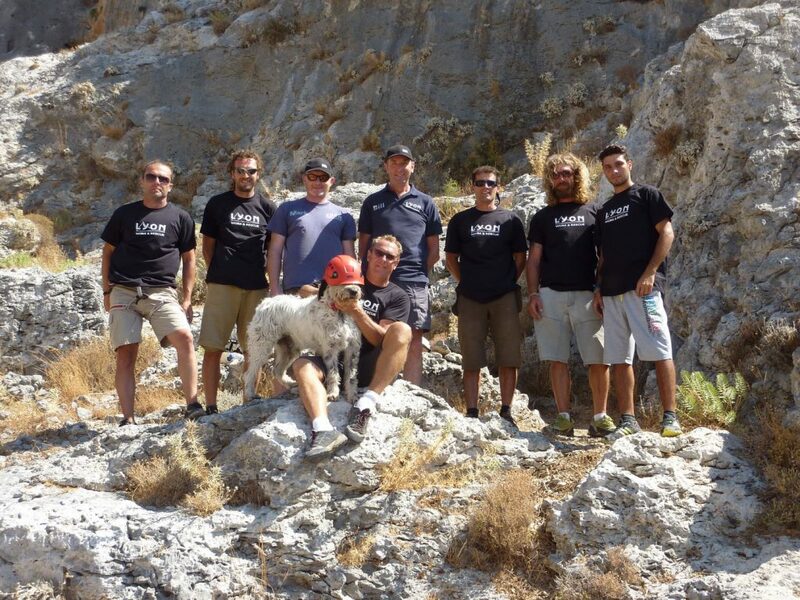 The kalymnosrescueteam.org website is provided by the Kalymnos Rescue Team “AS IS” and “AS IS AVAILABLE”. 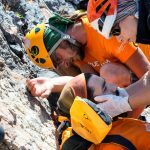 kalymnosrescueteam.org makes no representation or authorization in any form, be it explicit or implicit, of the information, content, and material the website contains. 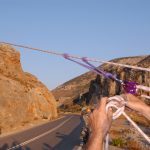 To that purpose, users of the website agree to use it at their own responsibility. 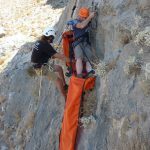 The Kalymnos Rescue Team does not guarantee that the kalymnosrescueteam.org website, its servers, or the e-mails sent by kalymnosrescueteam.org, are free of viruses or any other damaging elements. 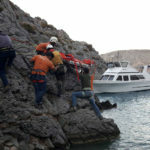 The Kalymnos Rescue Team bears no responsibility for damage of any kind that may ensue from using the website including but not limited to direct, indirect, accidental, coincidental, or ensuing damage. 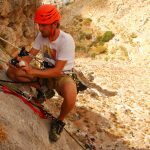 While browsing kalymnosrescueteam.org website, users may need to enter certain information of a personal nature such as: their first and last name; telephone number, e-mail address, etc. 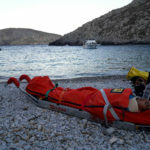 Visitors may also be requested to provide their personal data in order to access certain other kalymnosrescueteam.org services. 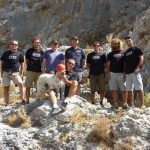 kalymnosrescueteam.org gives its users the opportunity to request that any of their personal data and information be deleted by sending the relevant e-mail. 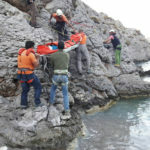 An IP address is determined by the Internet Service Provider through which the user’s computer accesses the Internet and, subsequently, the pages belonging to kalymnosrescueteam.org. 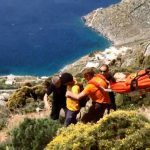 For technical and security reasons pertinent to the systems of kalymnosrescueteam.org (server, database, network, etc), IP addresses are retained and used exclusively for statistical data gathering. 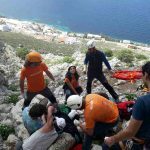 User IP addresses accessing kalymnosrescueteam.org ’s pages may be released provided the request for said release comes from the competent police, judicial or other state authorities and in compliance with the procedure stipulated by Law. 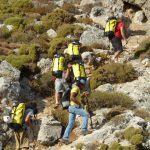 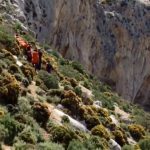 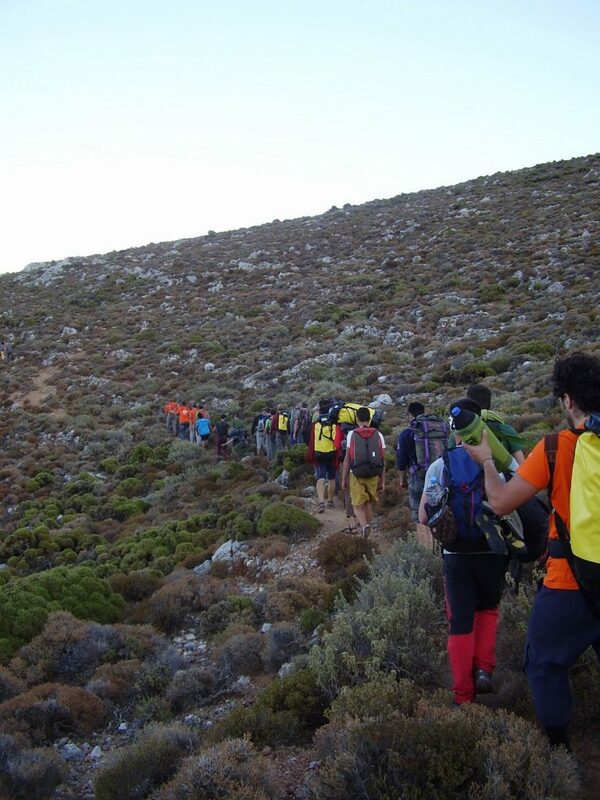 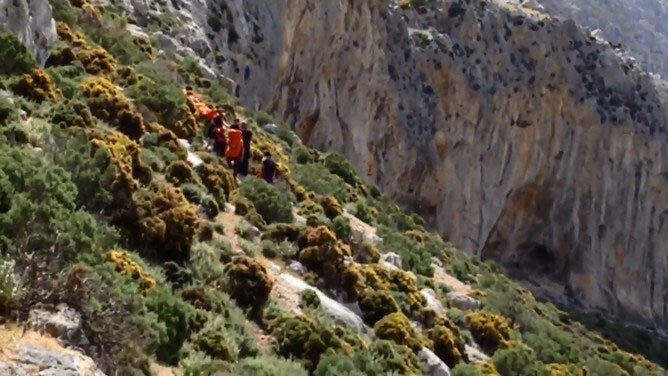 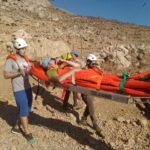 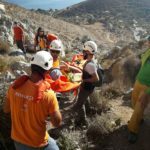 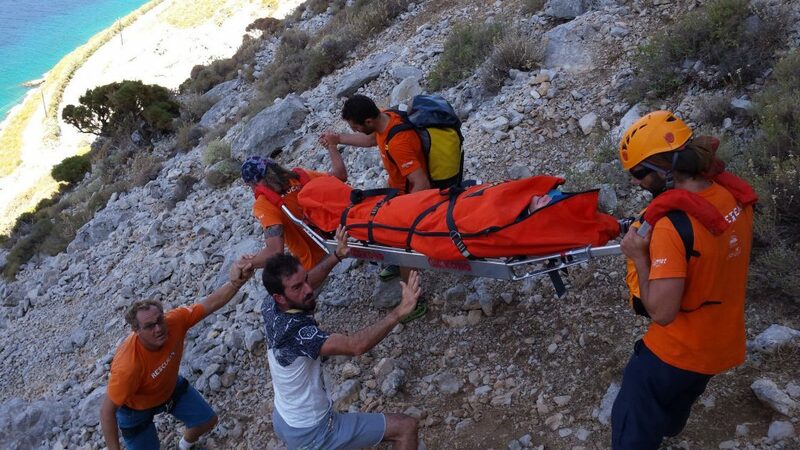 Another call, this time for an injured hiker in Kastri, Emporios. 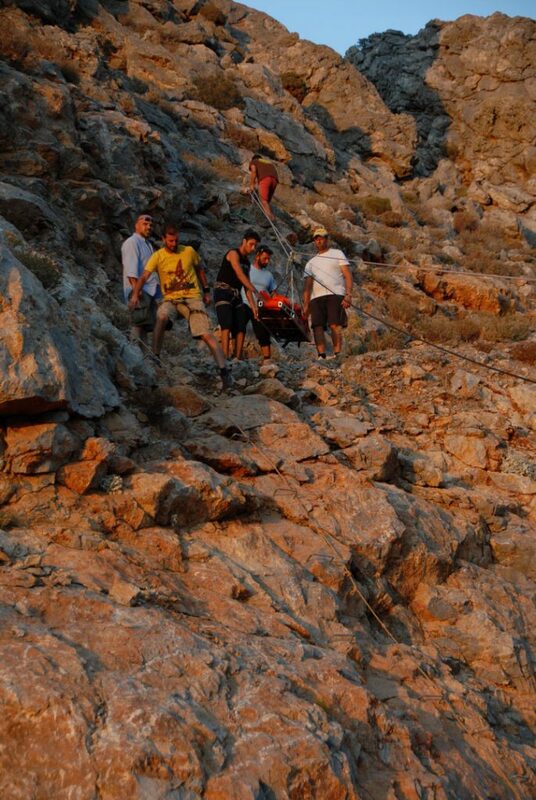 A dislocation of the knee made it difficult for him to walk down the long path. 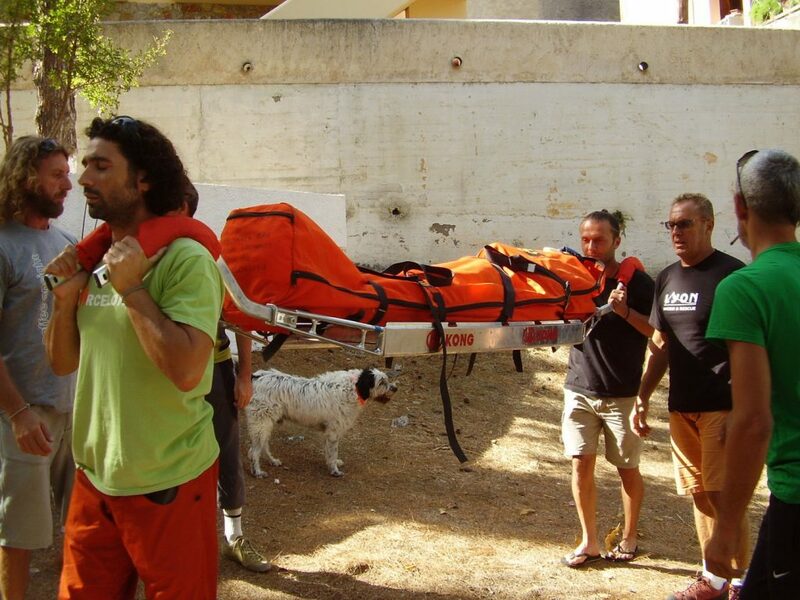 We thank all the new volunteers that helped at the rescue, Asteris a local policeman, Mikes and Thanasis. 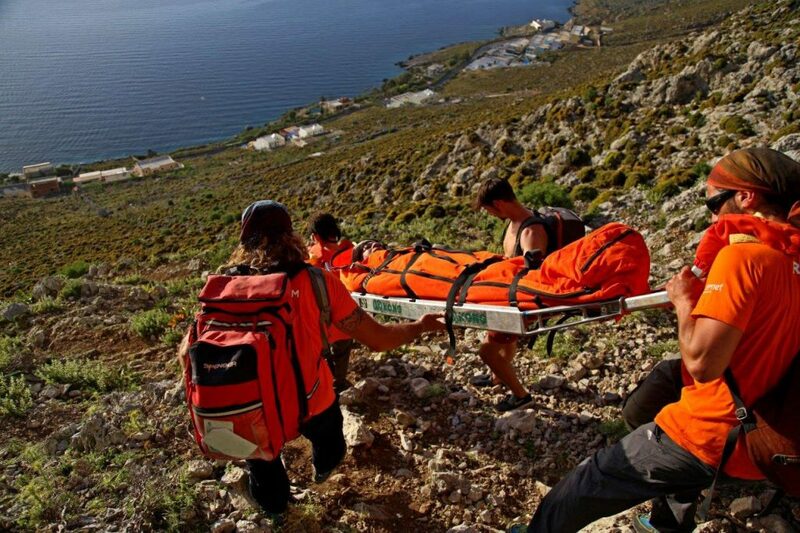 Since we are not professionals, thus not paid for our services, we have to set aside our personal activities and some of us even jobs, and run to help when needed. 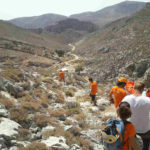 That’s why we need a lot of volunteers!! 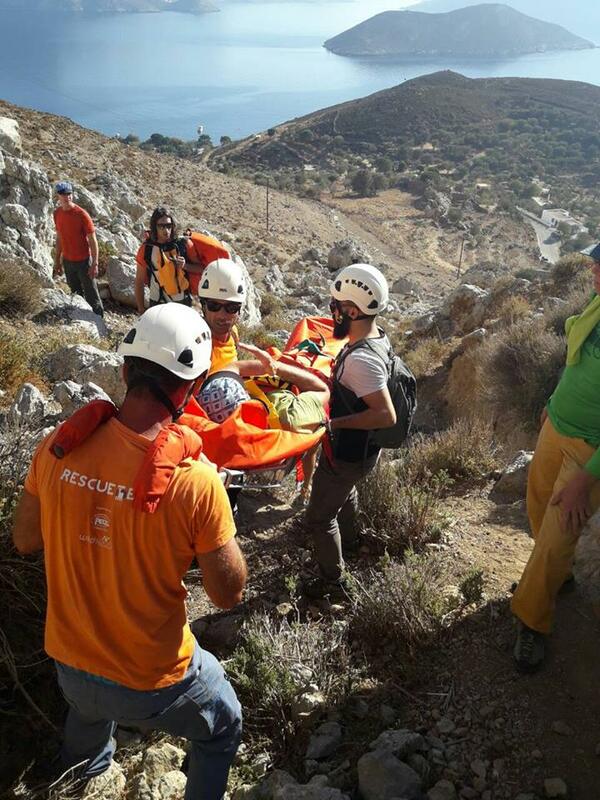 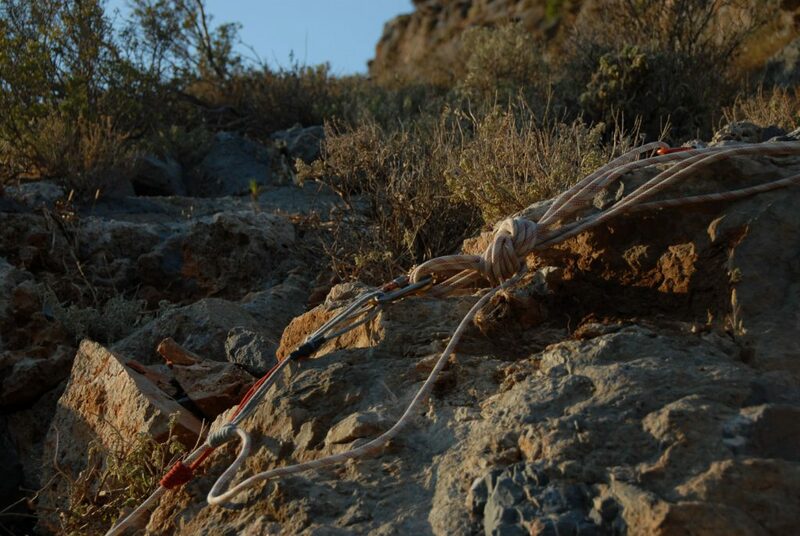 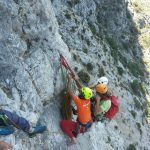 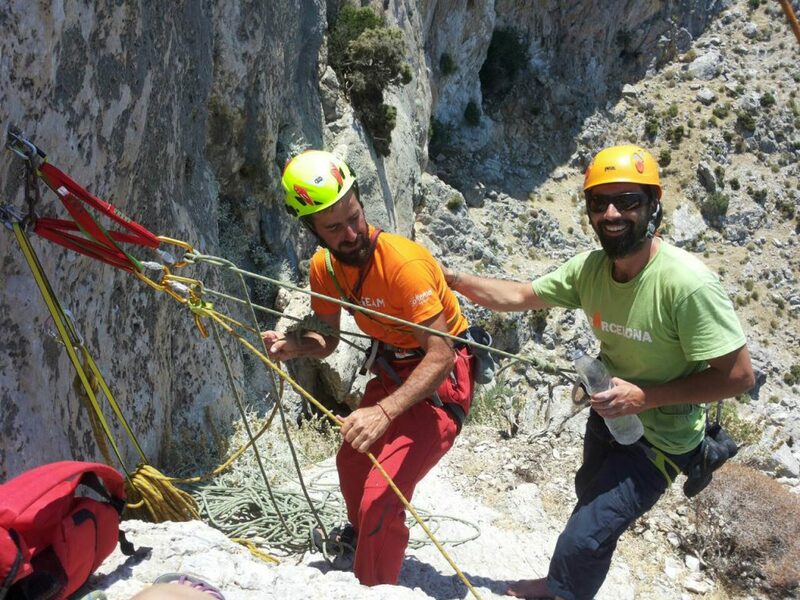 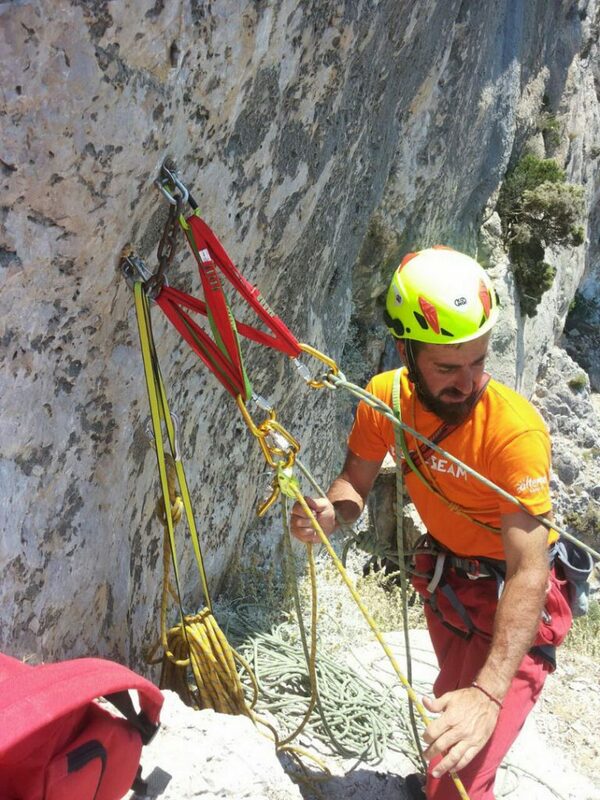 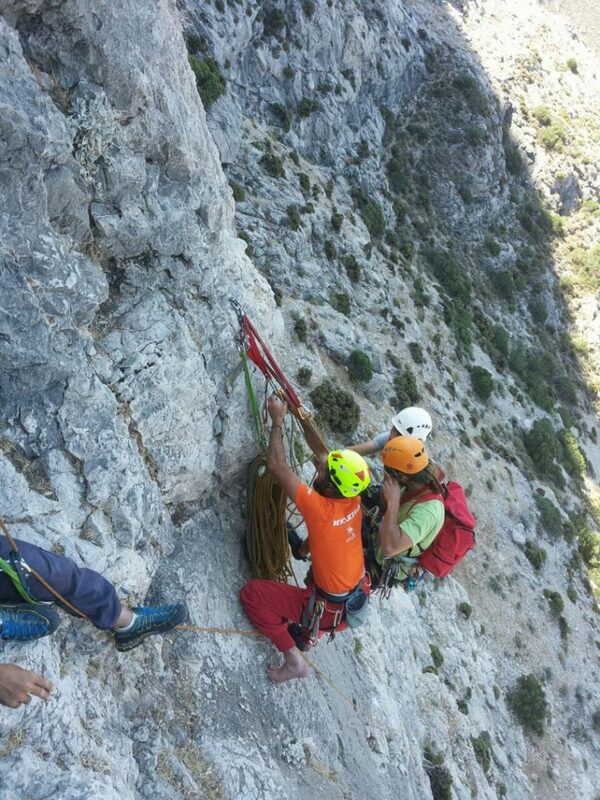 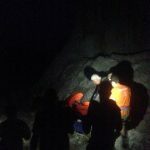 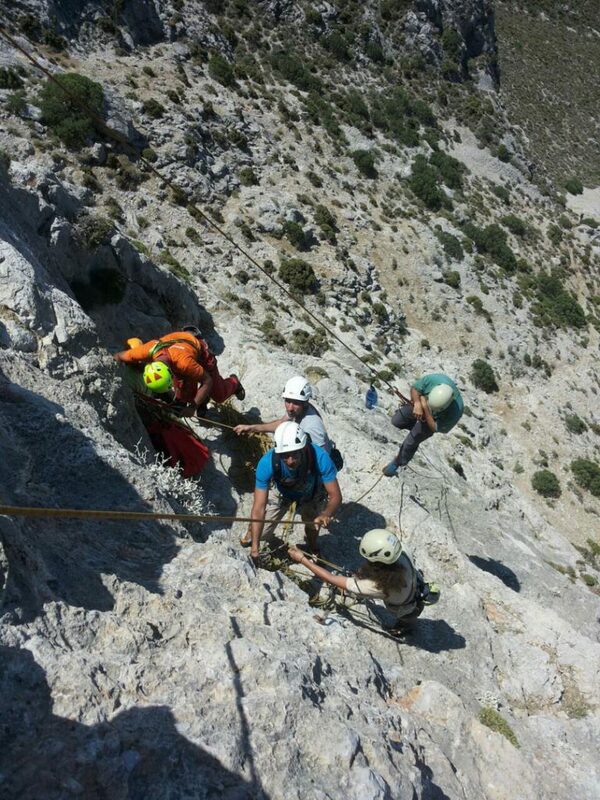 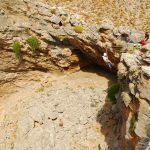 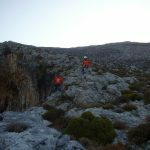 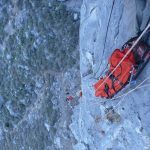 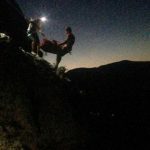 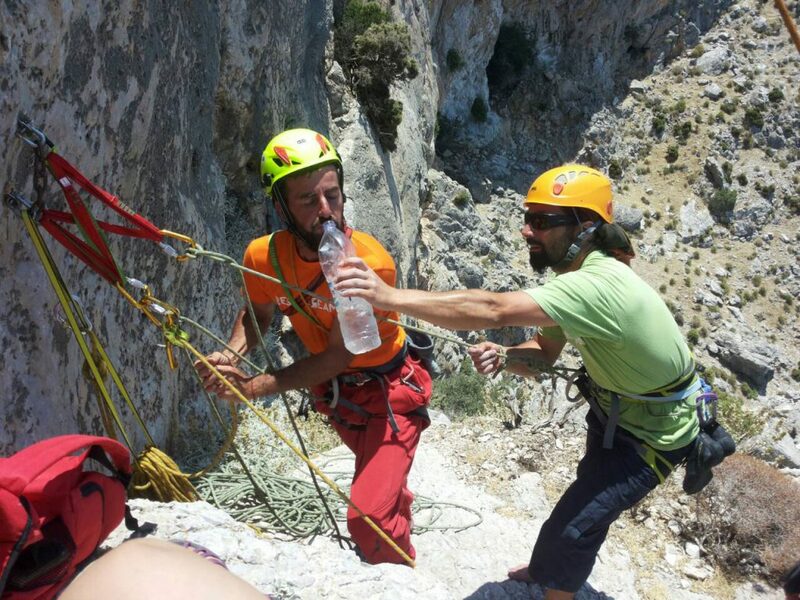 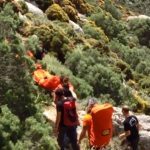 Τhe Team encountered the most difficult rescue in terms of access and general difficulties, but the injured climber is surprisingly well and with no serious damage! 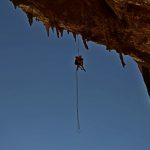 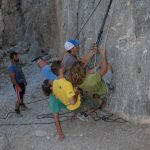 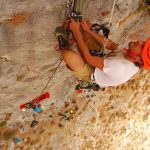 The call was for Sycati cave, with a crazy wind and time pressure for the daylight, but the Team pulled it off with the technical members and the help of their Instructor Massimo Datrino, who was by coincidence in Kalymnos. 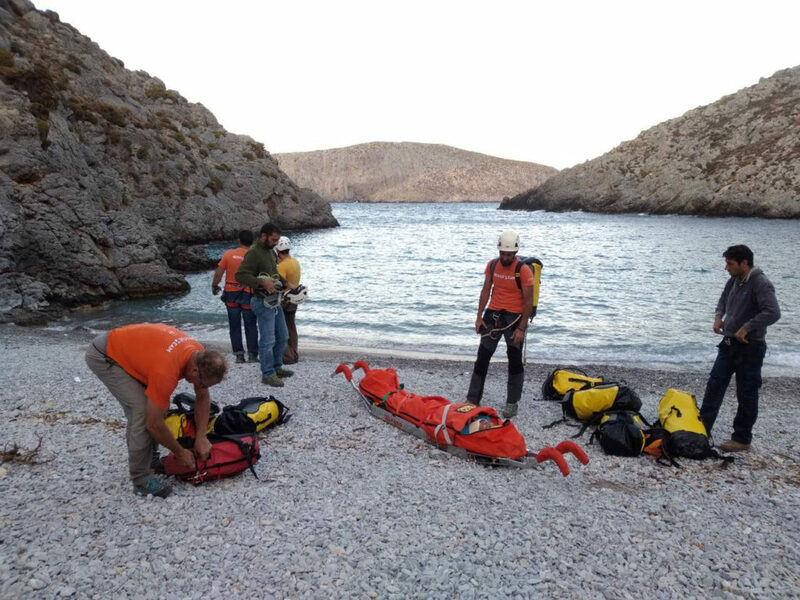 Most valuable help was offered by Dimitris Nystazos, the kalymnian diving instructor, who took a great risk by using his boat to transport members of the Team and the casualty. 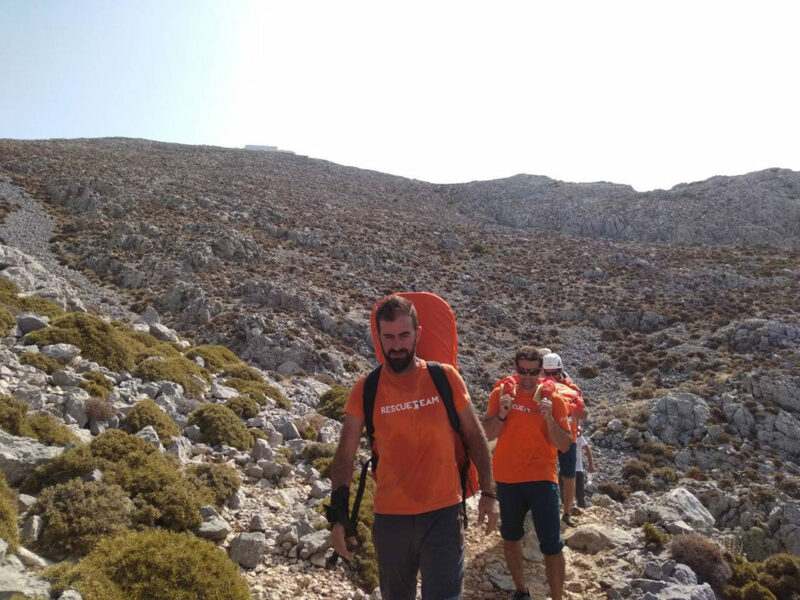 We also thank Meletis our friend who joined the group to offer his help. 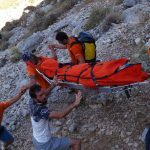 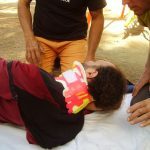 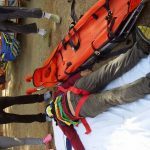 A hiker fell while walking on the path to the church of Prophet Elias and broke his leg, together with some other small injuries. 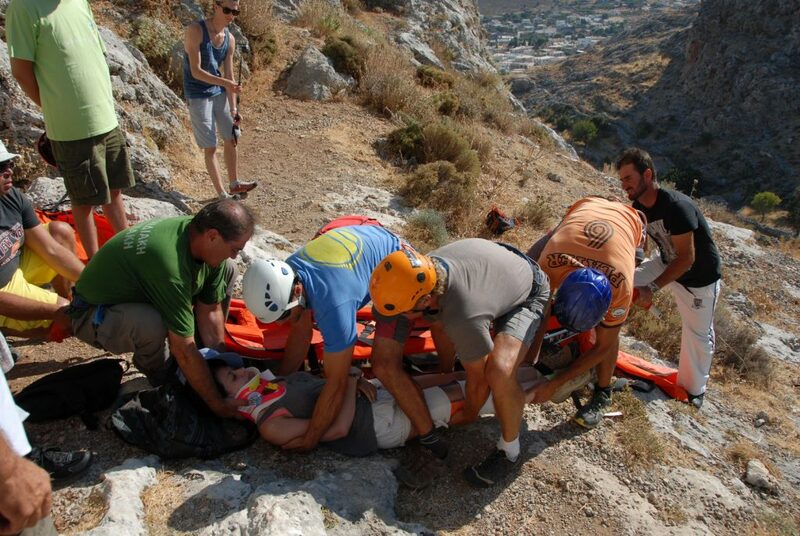 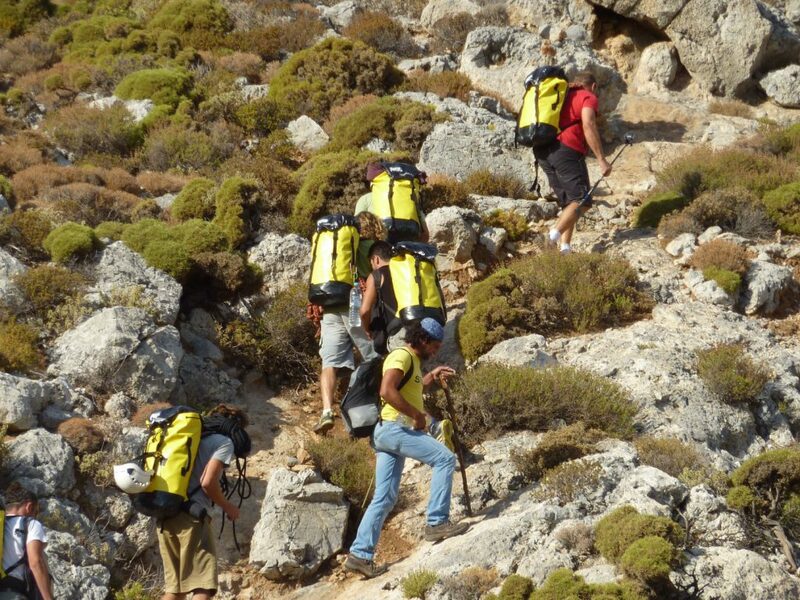 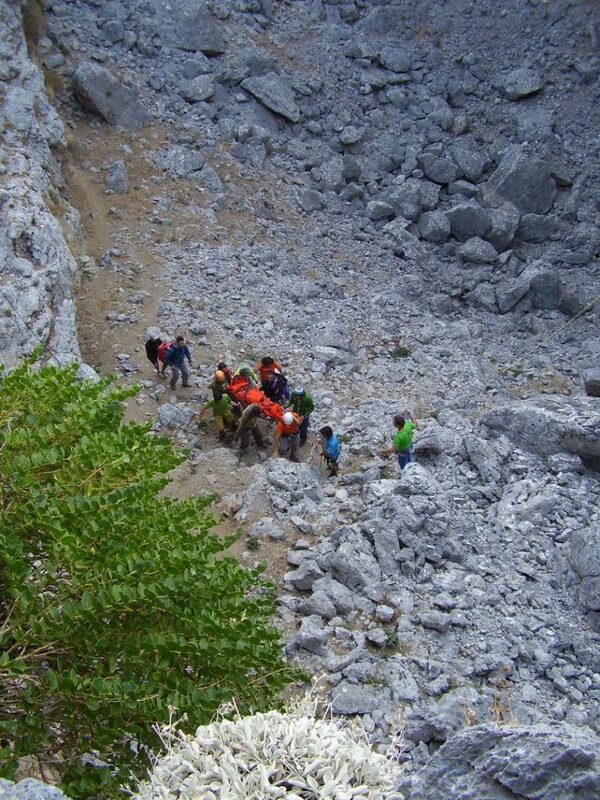 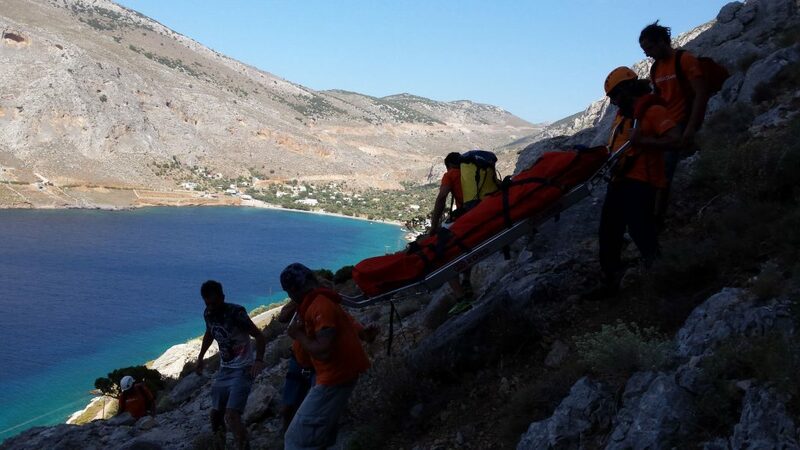 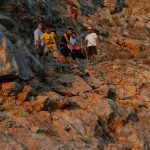 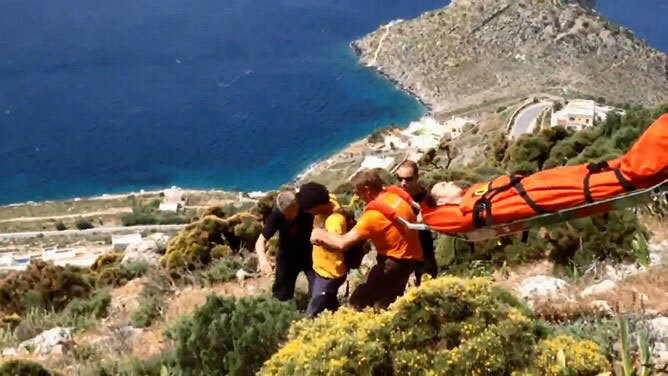 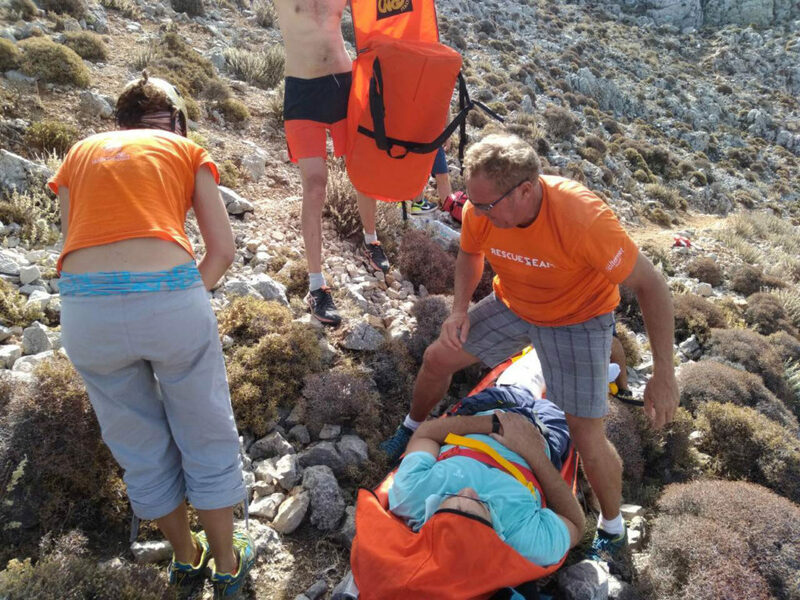 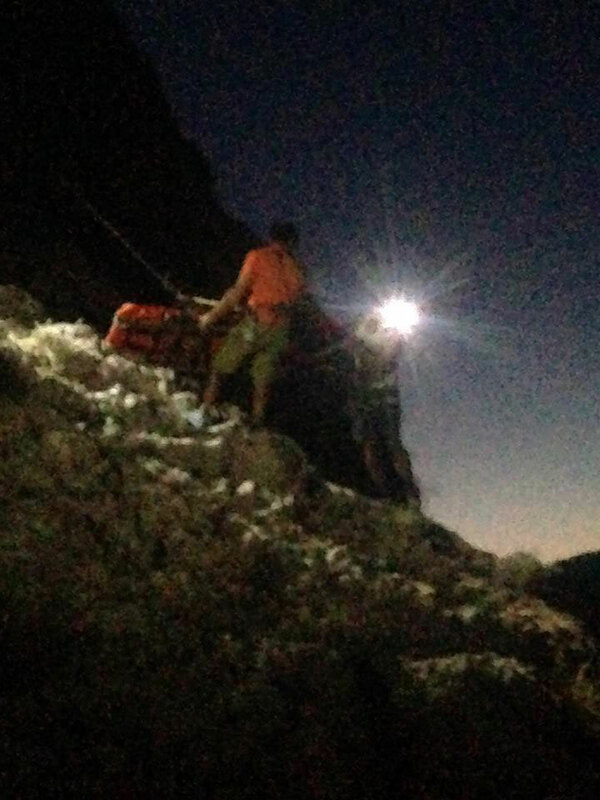 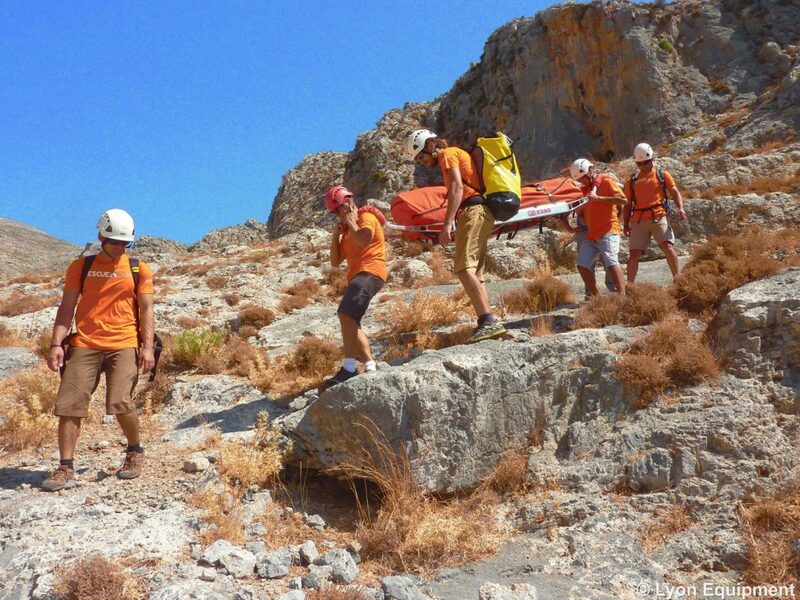 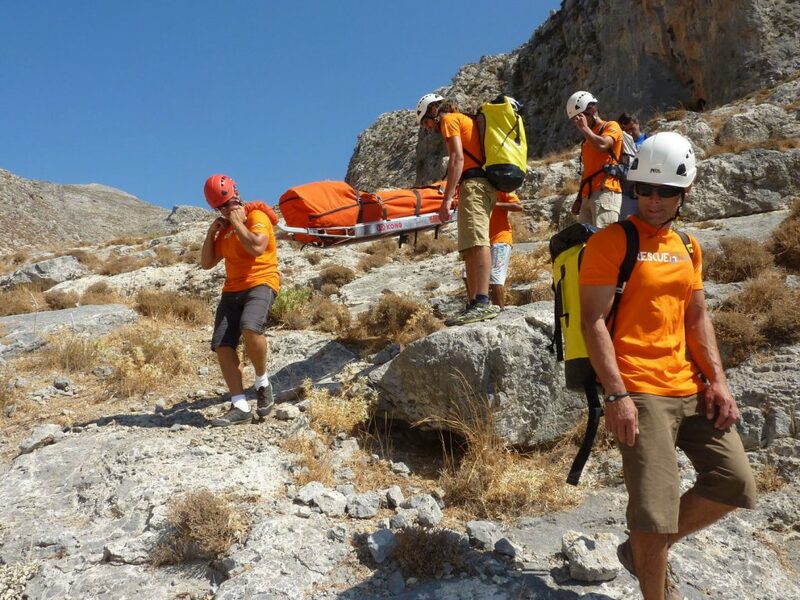 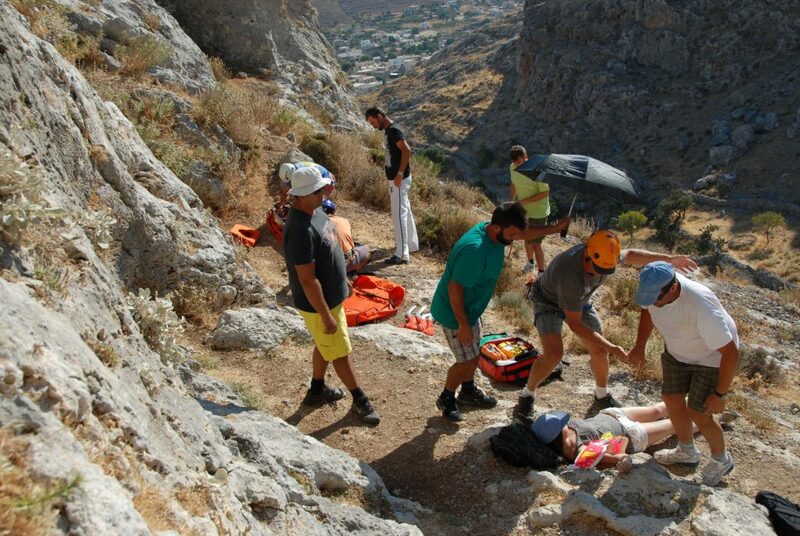 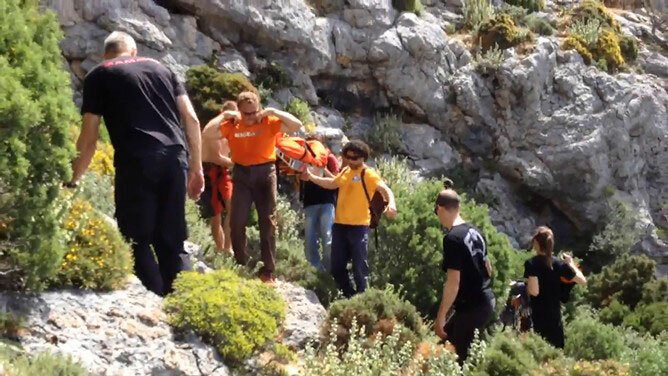 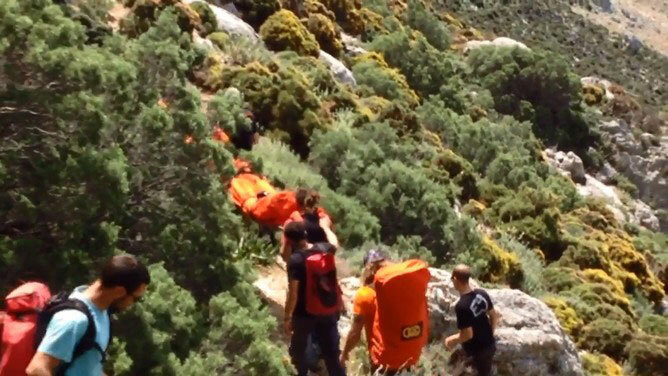 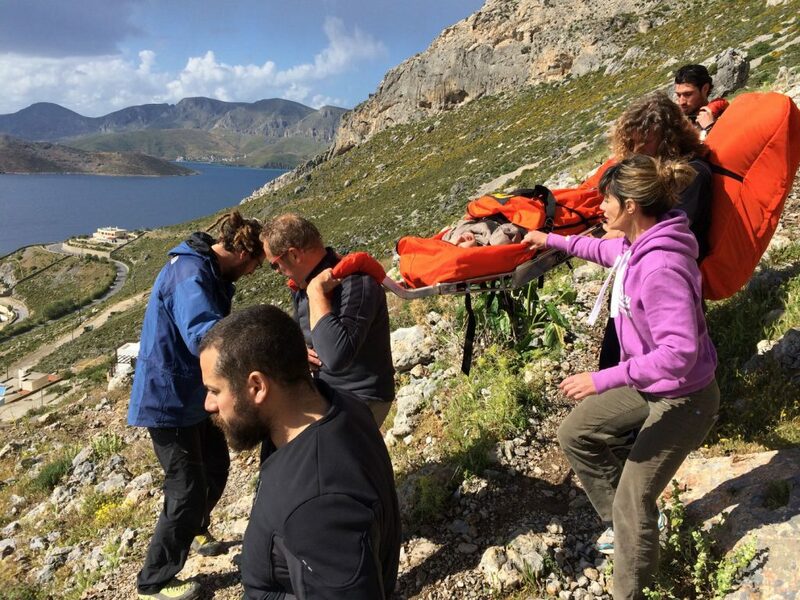 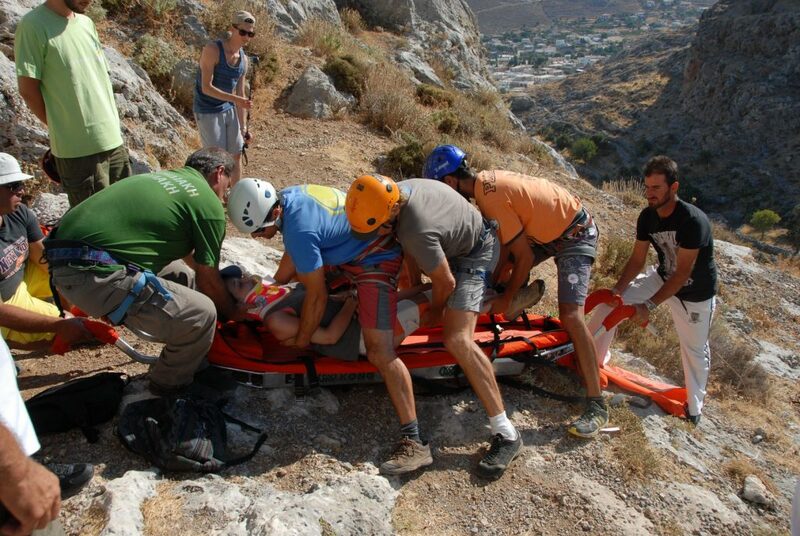 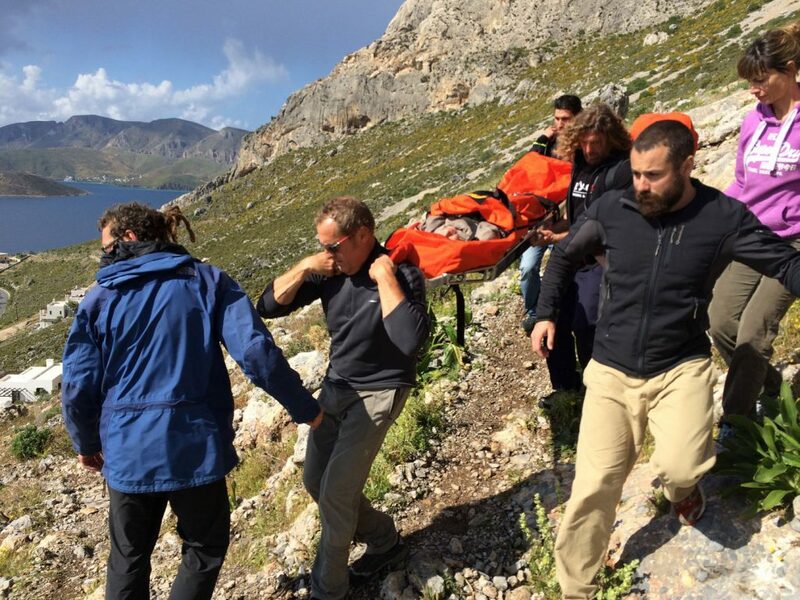 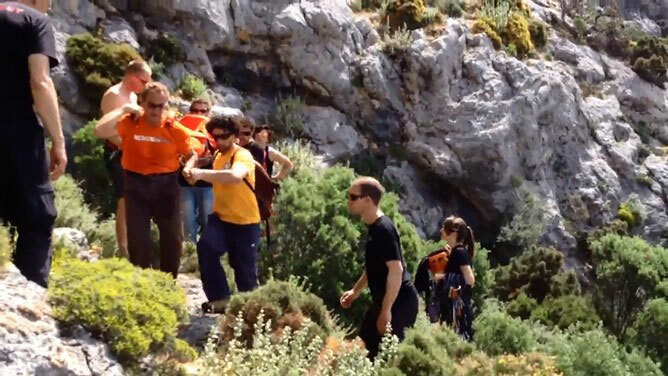 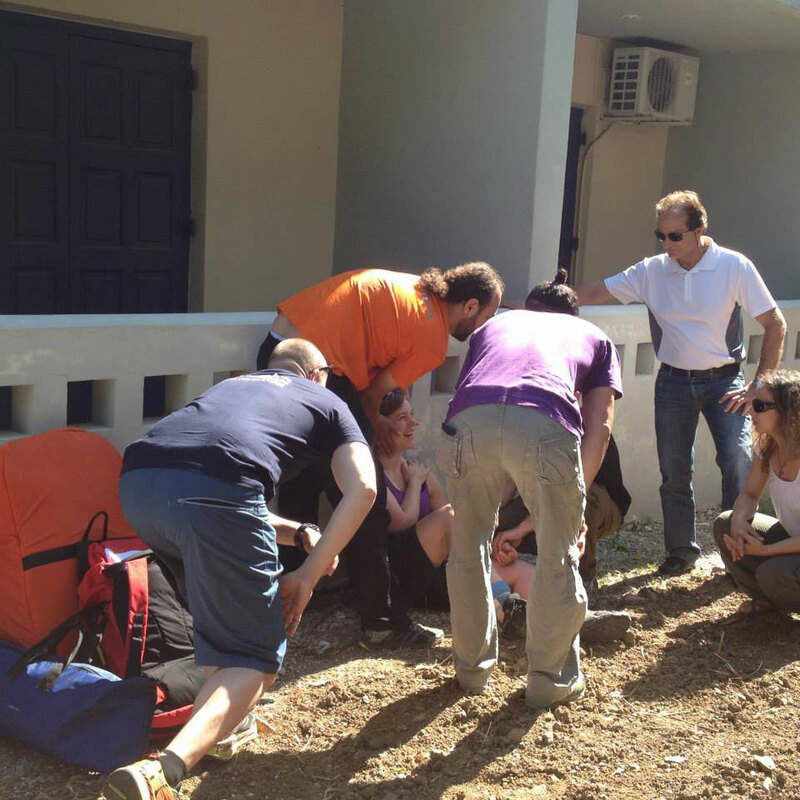 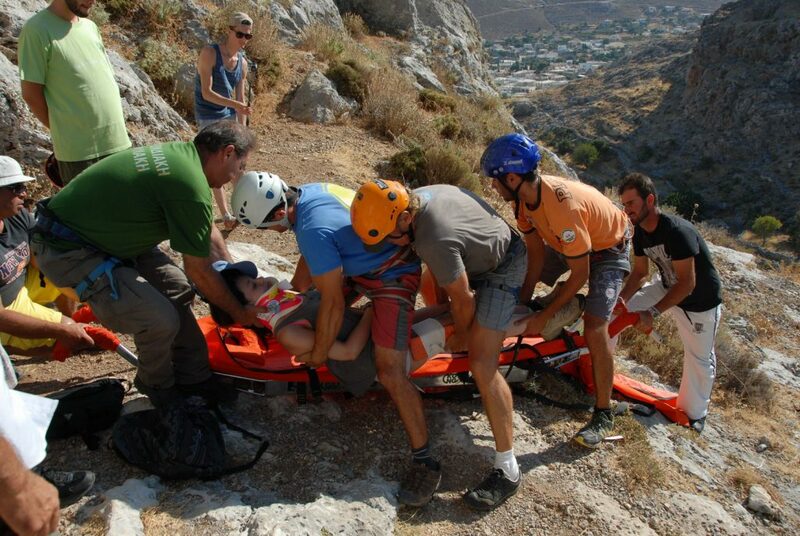 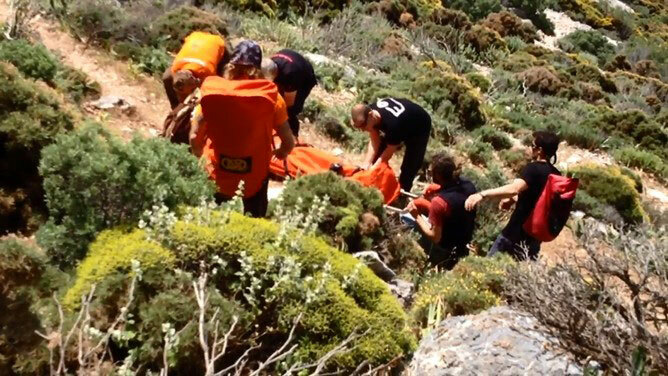 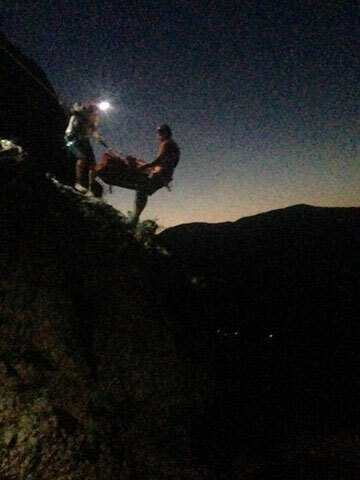 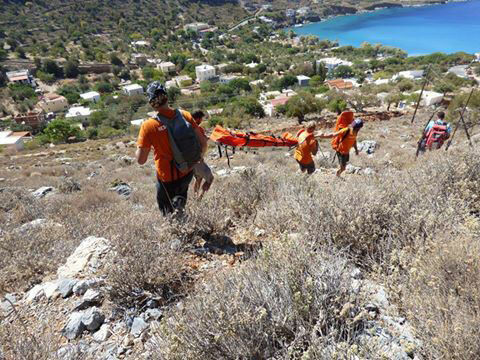 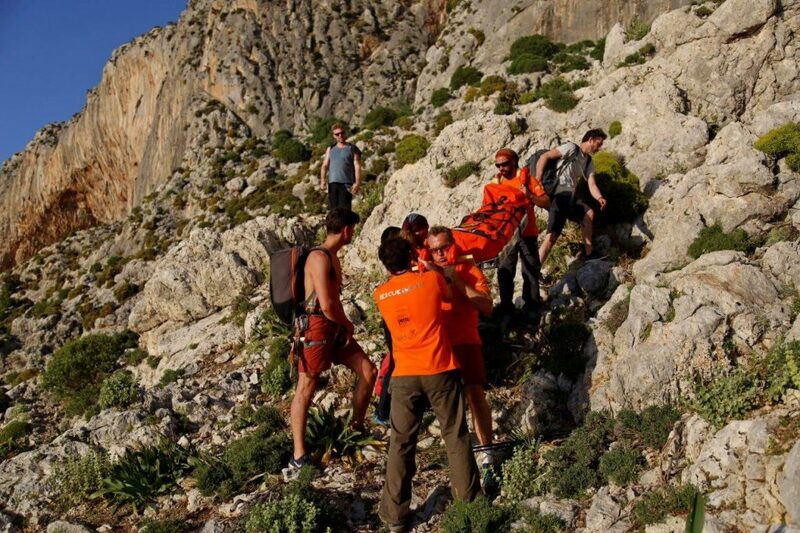 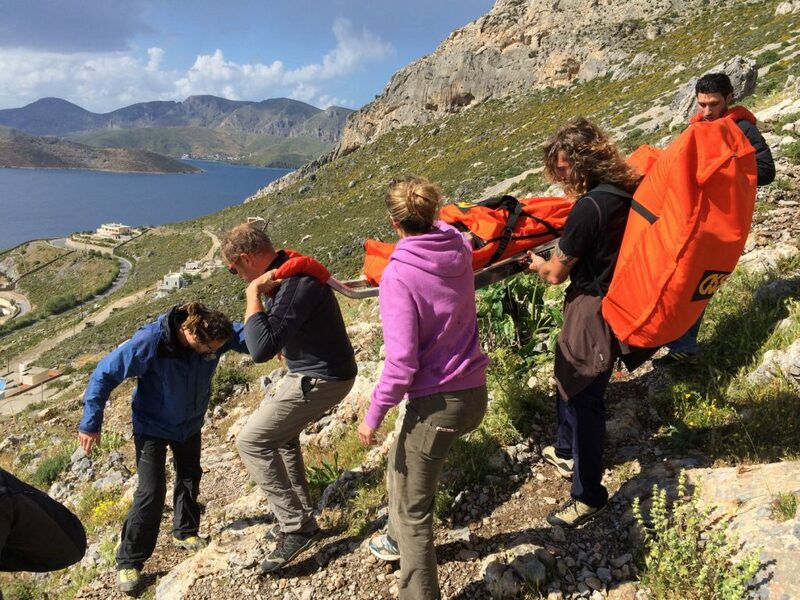 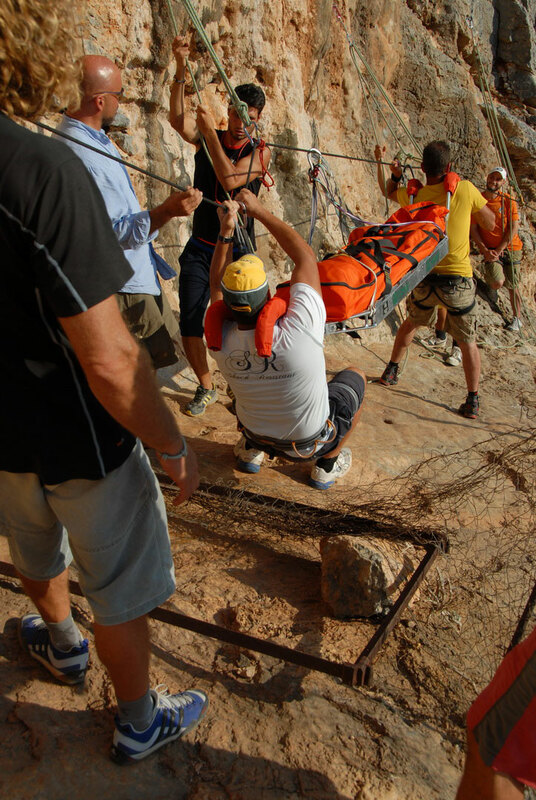 The Team took the hard job of carrying the casualty all the way down the path from the highest point of Kalymnos ! 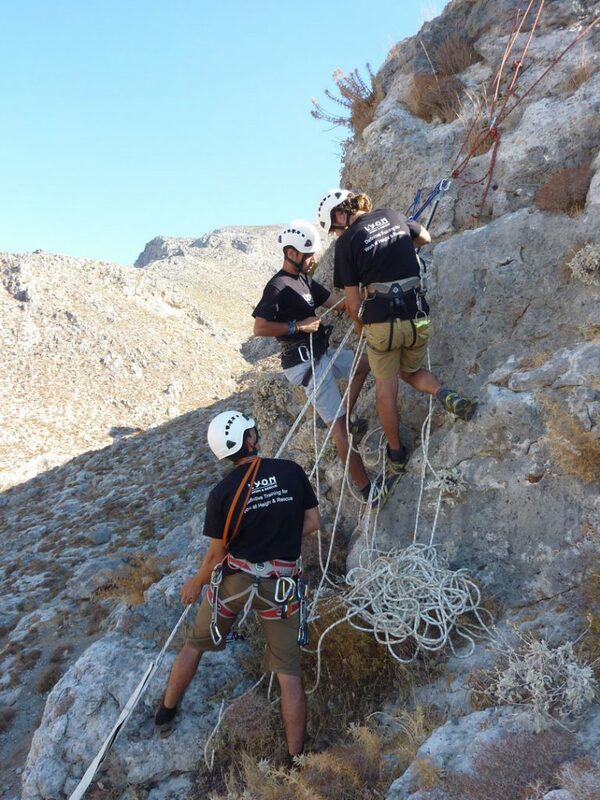 The Team in action, last Saturday at Gerakios sector. 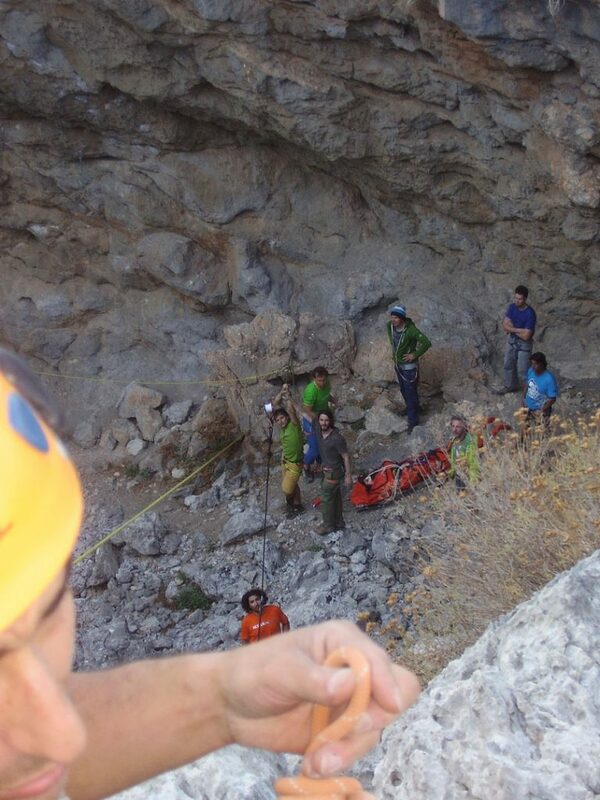 All well, the climber got away with just a strain of the ankle. 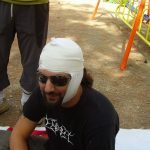 We wish to him a quick recovery! 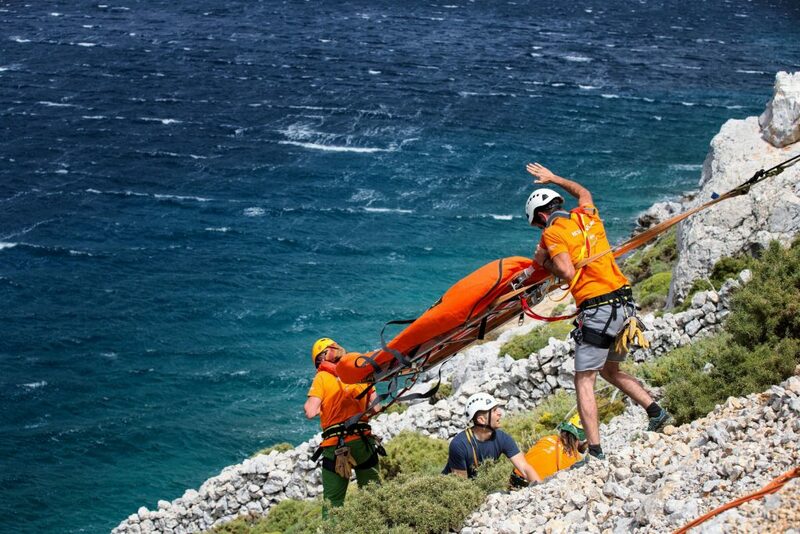 Photos courtesy of Dave W.
Yesterday 13/4 the team had the first call for this season. 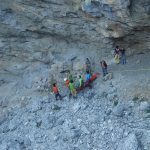 In sector Kalydna, route Aurora (2 pitces), at 13:00, we were called for one more climber that fell out of miscalculation of the rope’s length and NO KNOT at the end.. 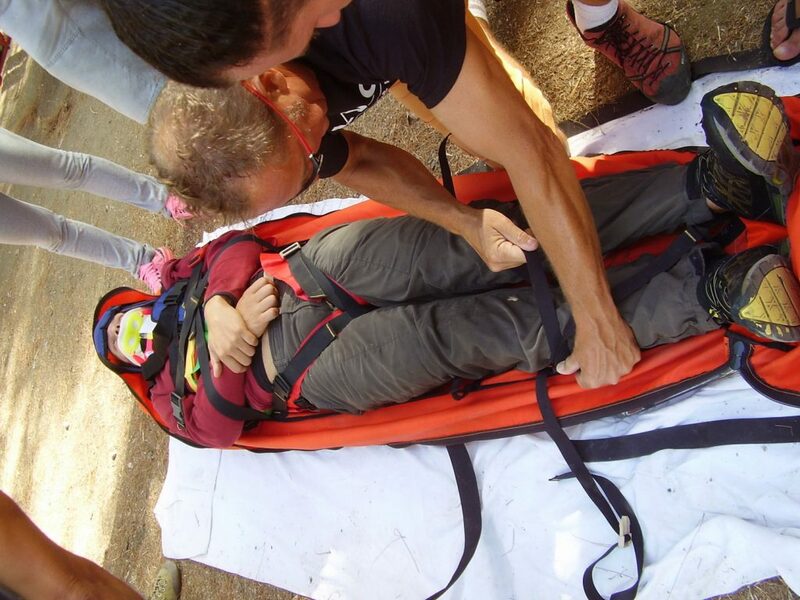 The girl is perfectly fine and totally lucky, just skin injuries, although she fell from 8 or more meters to the ground!! The team had the assistance of a friend, a doctor who volunteered to come and offer the first aid and we thank him for that. 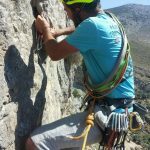 Please read the guide carefully for route specs and add the knot and the helmet to your necessary actions in your climbing activities! 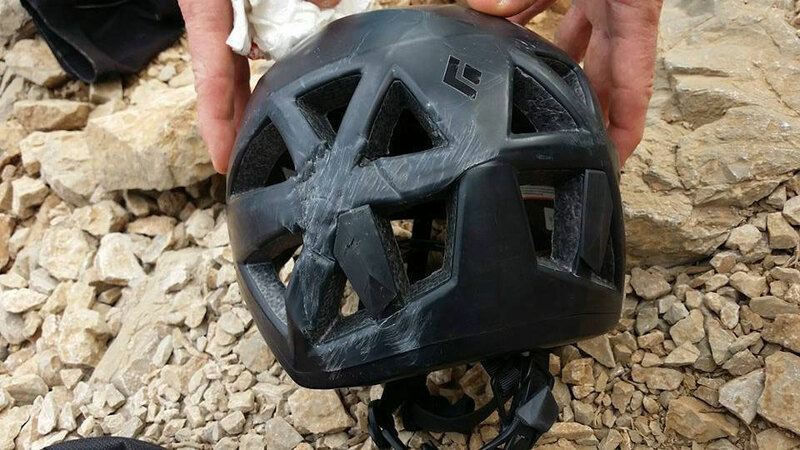 The team dealed with an accident that we feared it would come sooner or later, thankfully it didn’t have the worst ending. 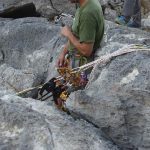 In the route “Memories of Dorothy” a big rock from the route, that a climber was holding to make the move, came off and fell on to the belayer. 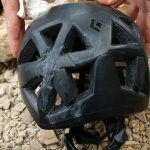 The helmet took all the blow and her shoulder was injured. 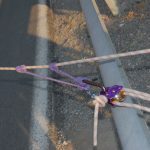 The Team has consistently noted that openers should clean properly their routes and that the urge to open 10 or more routes in one week, for example, usually leads to clumsy cleaning of the routes. 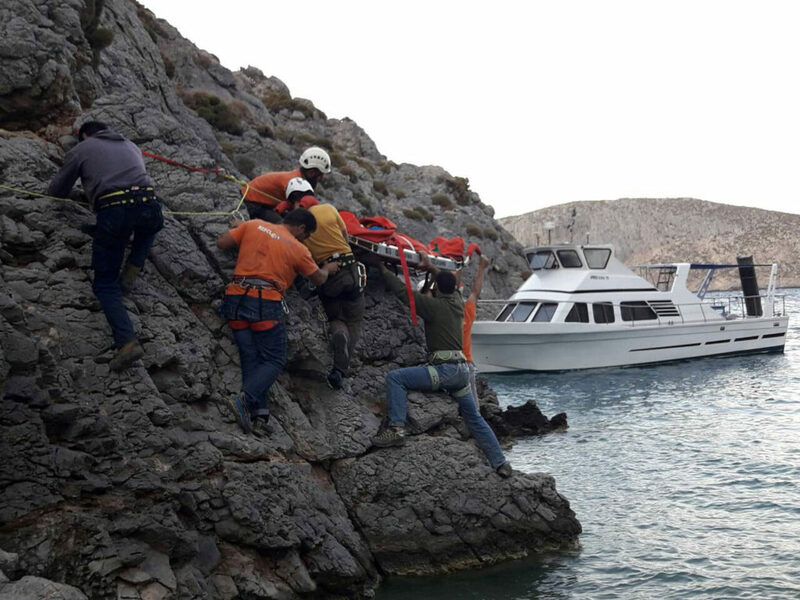 We thank all the people that helped with the rescue, like mr Zoidis, especially our boatman Pavlos Karafyllakis that offered his services for free and took us there in no time. 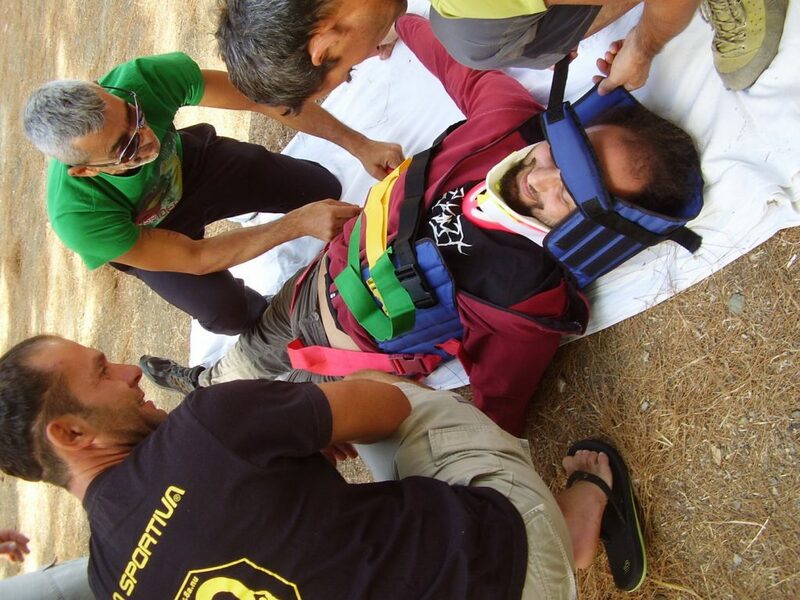 We hope Emmanuelle will recover quickly from her injuries. 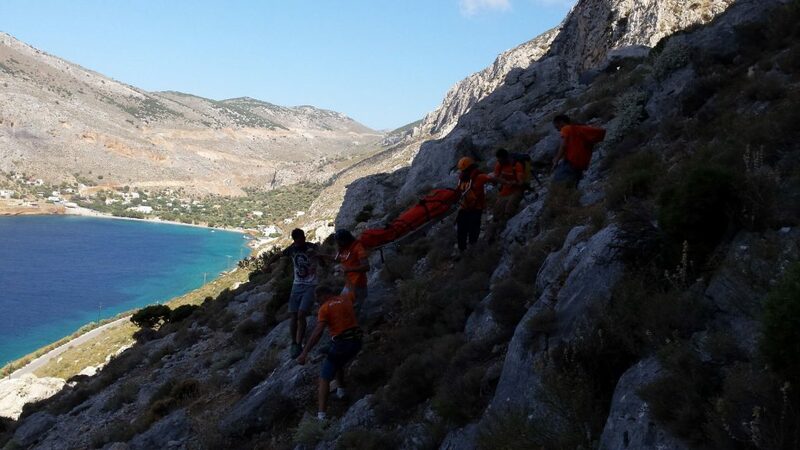 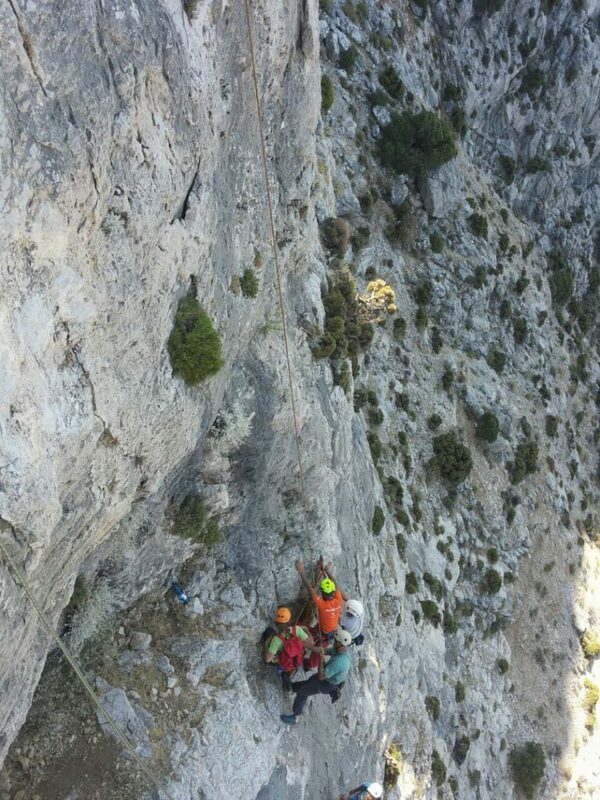 today at 14:00 we were called for help at sector Odyssey for a climber who fell while climbing and hit his ankle. 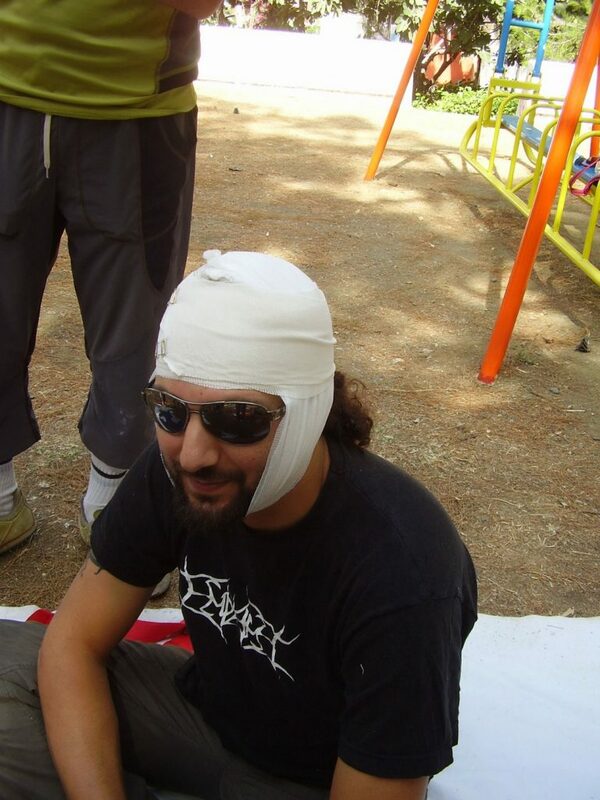 We wish full recovery to our friend. 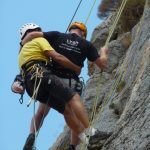 We thank Albi Schneider (CU belay glasses designer) and Louis apartments for their help. 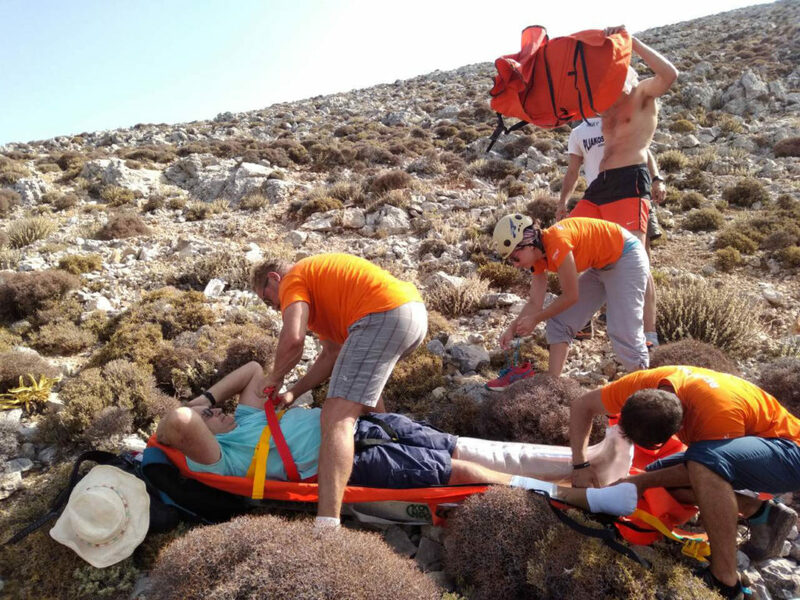 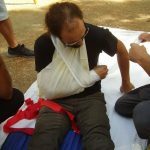 Today, 29/9/2016 at sector Arginonta Red Wall, there was an accident that greatfully ended with no serious damage, the climber having worn a helmet…we wish quick recovery to our friend’s broken arm and hopefully she will soon be back to create more pleasant memories in Kalymnos! 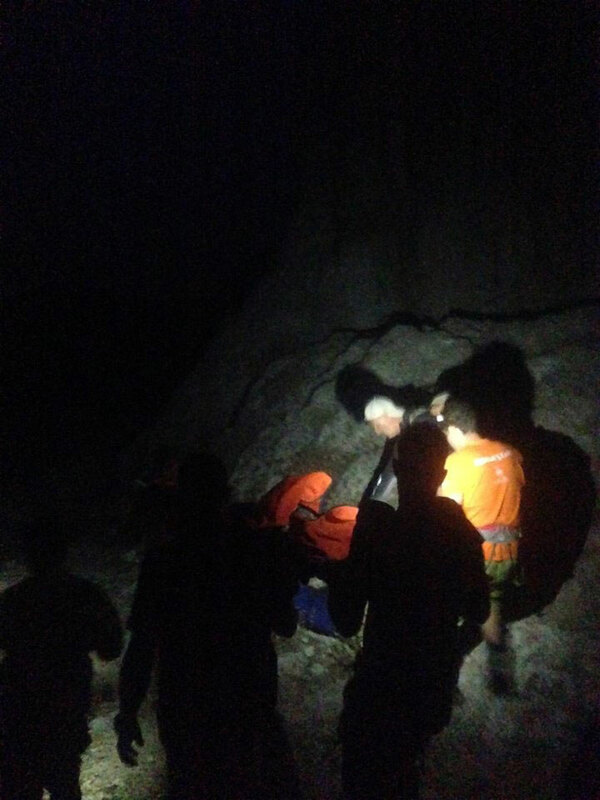 The team was called at 12:25 and the climber was delivered to the ambulance at 13:35. 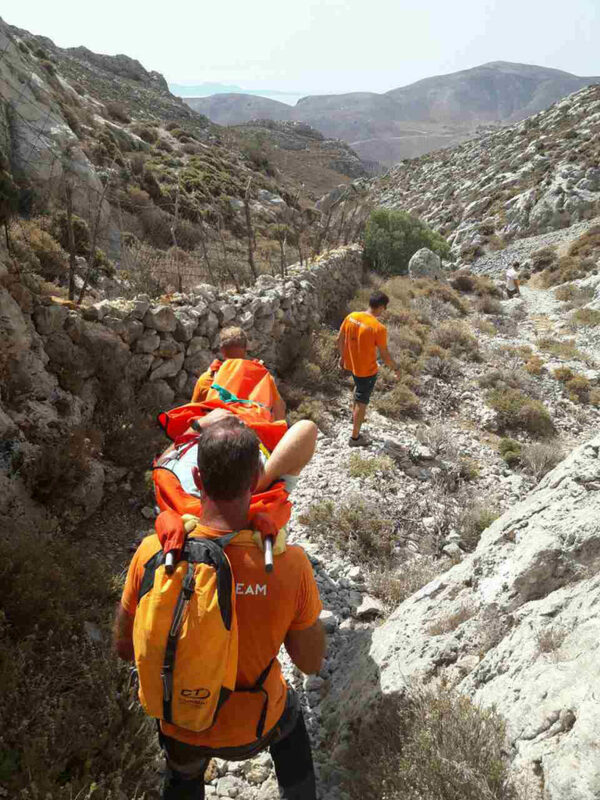 Good job to everybody! 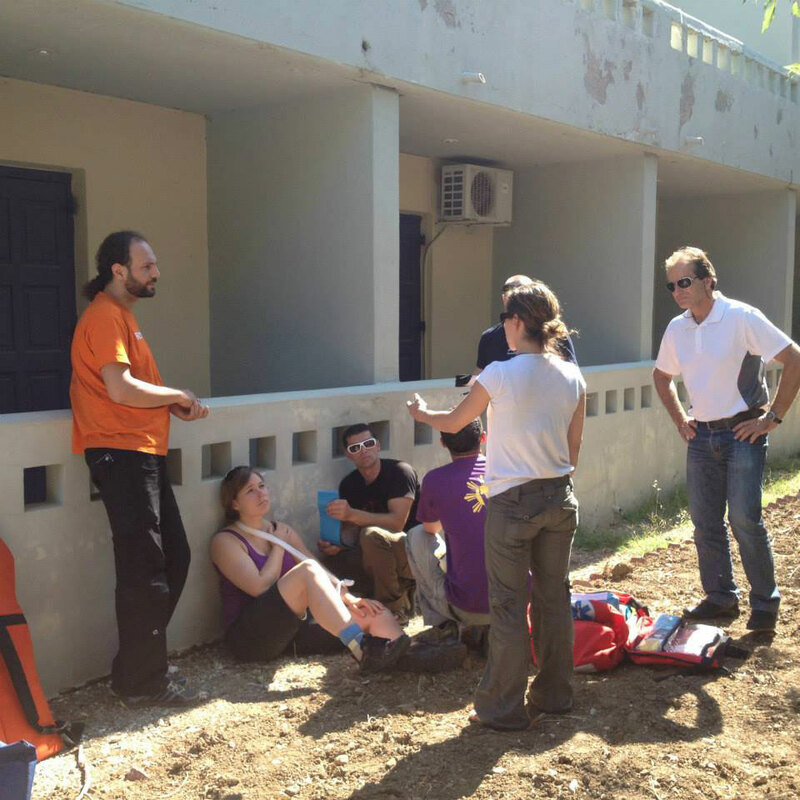 Saturday, 9/7/2016, sector E.T. 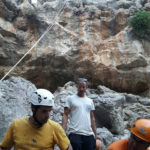 at the cave in Vathy. 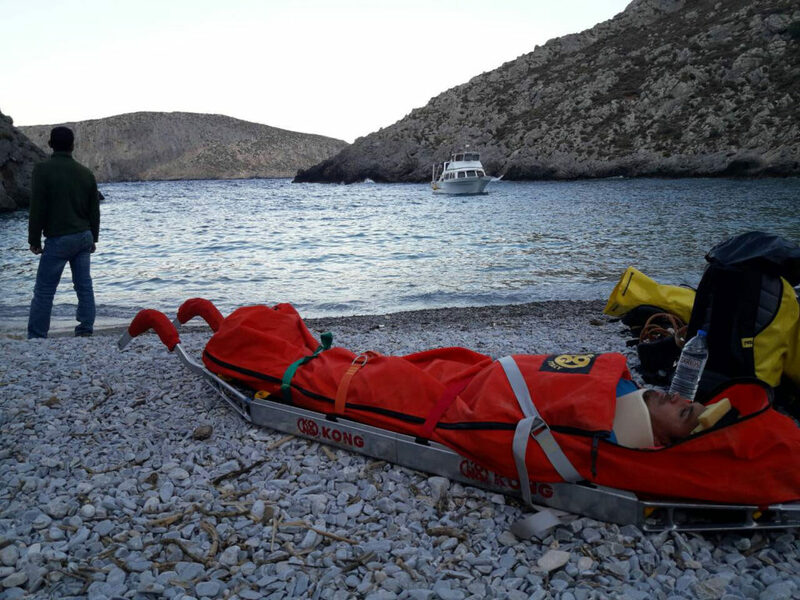 The team managed a difficult case, a rescue at 8 in the night, at a difficult site where simple carrying of the stretcher was not possible. 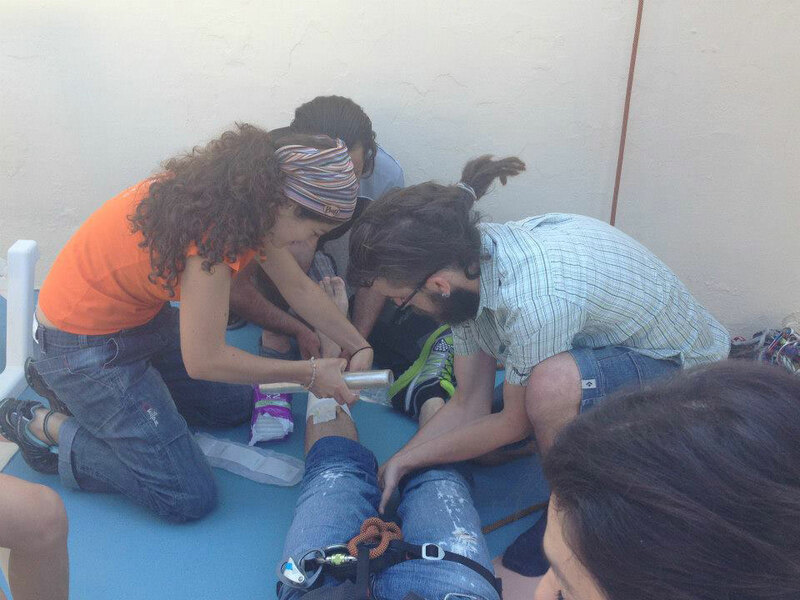 Luckily the girl had only a fracture of a heel bone. 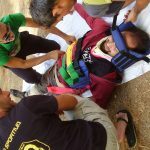 She was safe on the ground in no time! 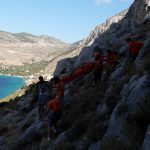 Yesterday evening 26/6, at 15:45, the team ran at Magoulias wall, where a climber had fallen a good amount of meters due to short rope and no knot at the end! 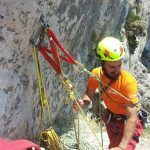 Mountain Guide, Mountain Rescue Instructor, Helicopter Rescue Technician, in charge of Alpine Rescue in Aosta Valley, Italy, member of CNSAS. 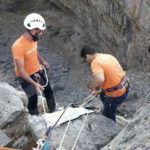 Instructor at the National Center of Ski and Alpinism of the French Police body (CNISAG) in Chamonix, Chief of Mountain Rescue and Instructor and officer of the French Police. 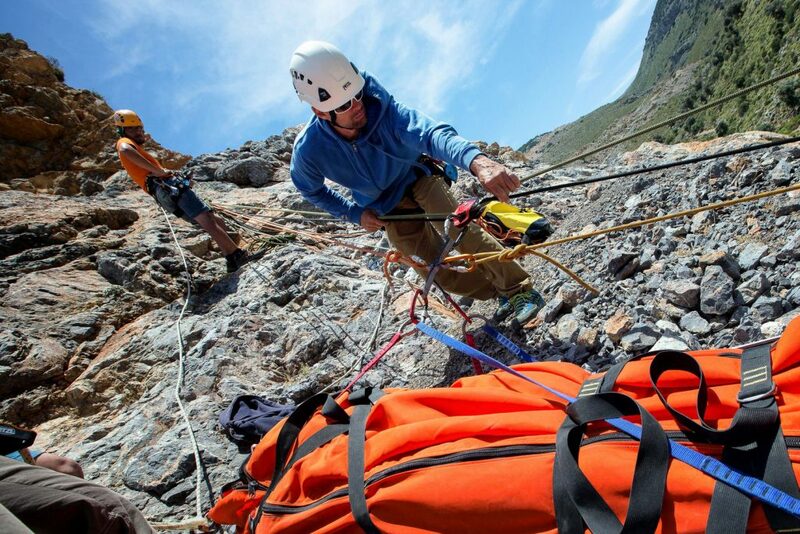 member of French Police body (CNISAG) in Chamonix. 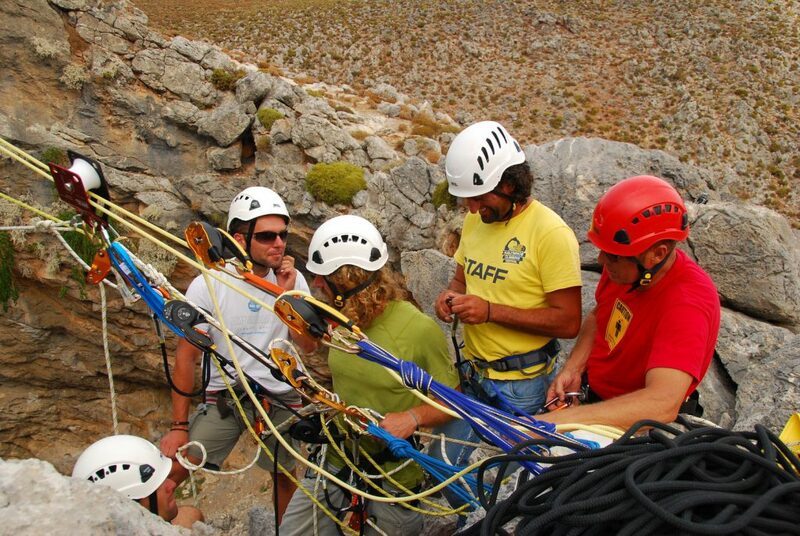 Eight members of the Team had the chance to be trained in Rope Rescue techniques, in order to grow our technical team. 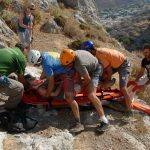 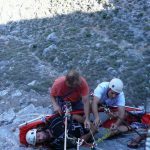 With this course the team trained to deal with an accident in various difficult parts of a climbing route, or path, from handling the casualty and first aid to moving the casualty with a stretcher and ropes from any place, bolted or not. 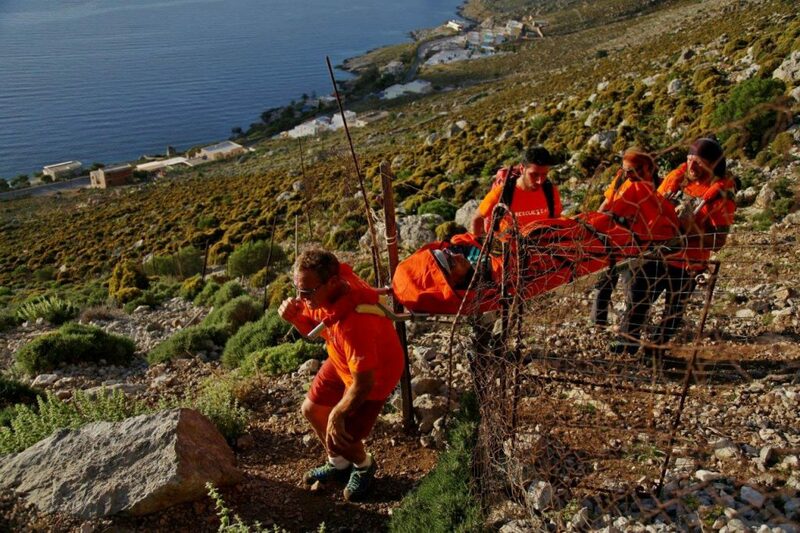 This course was a unique example of international cooperation and friendship. 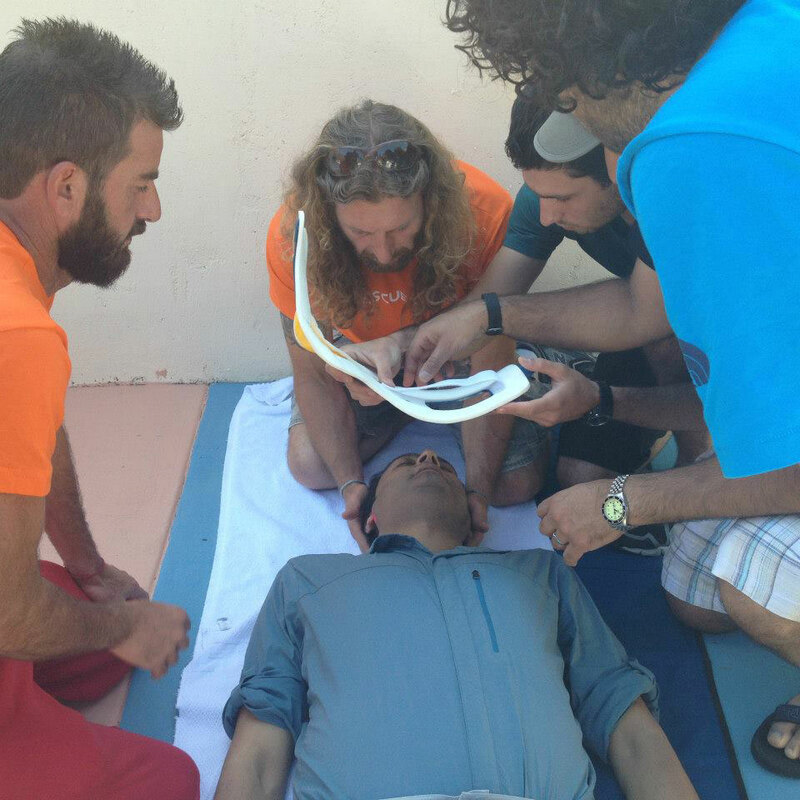 It was organized and offered for free by the instructors and their institutions. 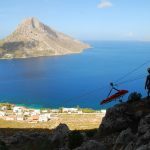 Their residence, food and transportation in Kalymnos were totally offered by local businesses, as their way of supporting this fine project. 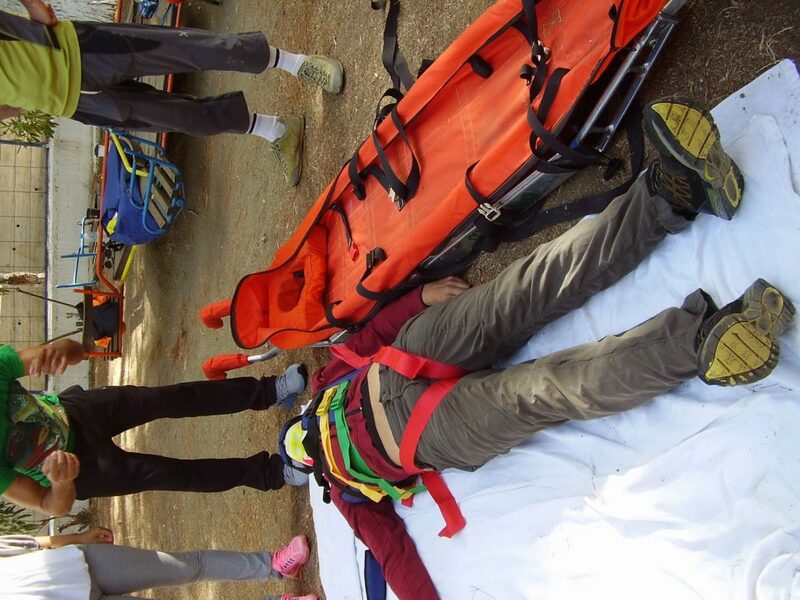 So the season began for us at 18/4/2016 with two calls in one day. 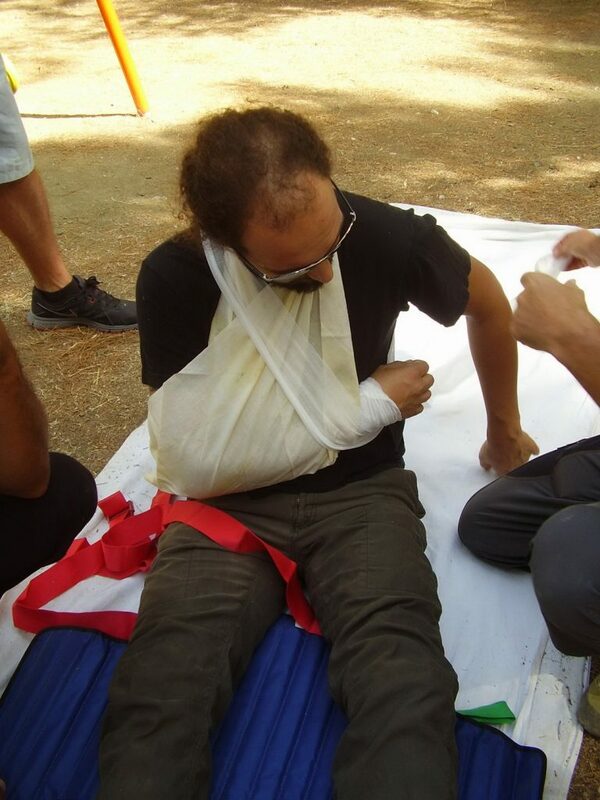 Luckily with no life-threatening injuries. 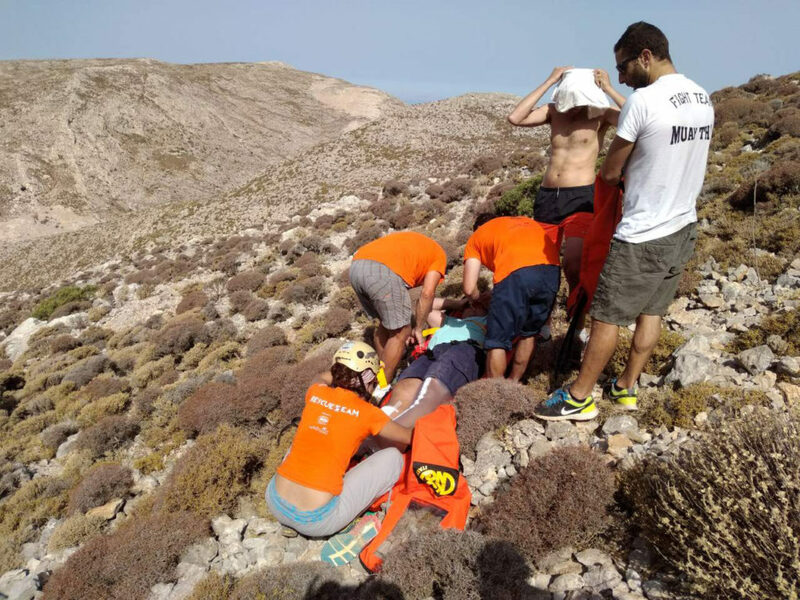 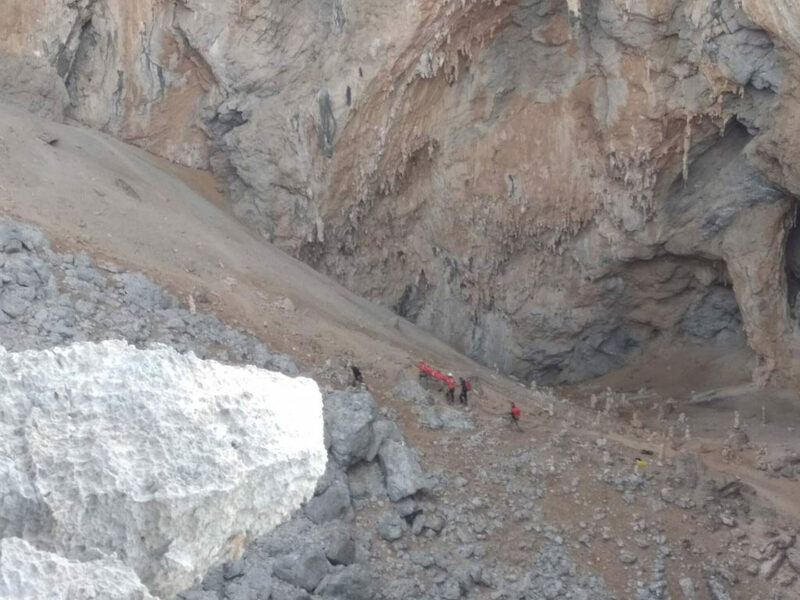 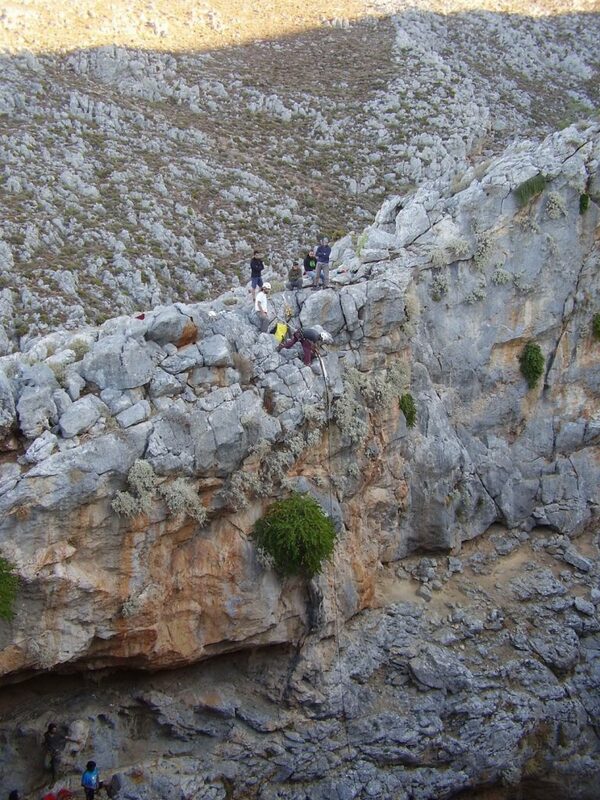 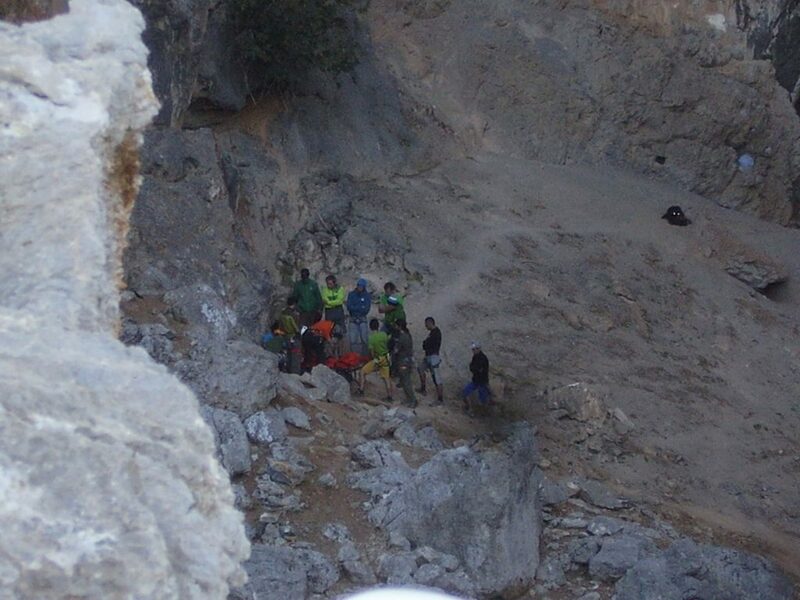 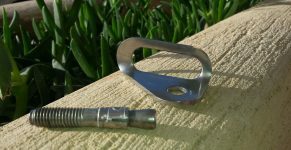 In the morning there was an accident in Eterna, Telendos, where a rock was detached from the route during climbing and the person fell from the 4th bolt. 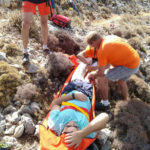 Luckily, the casualty was only injured on the shoulder and the general area. 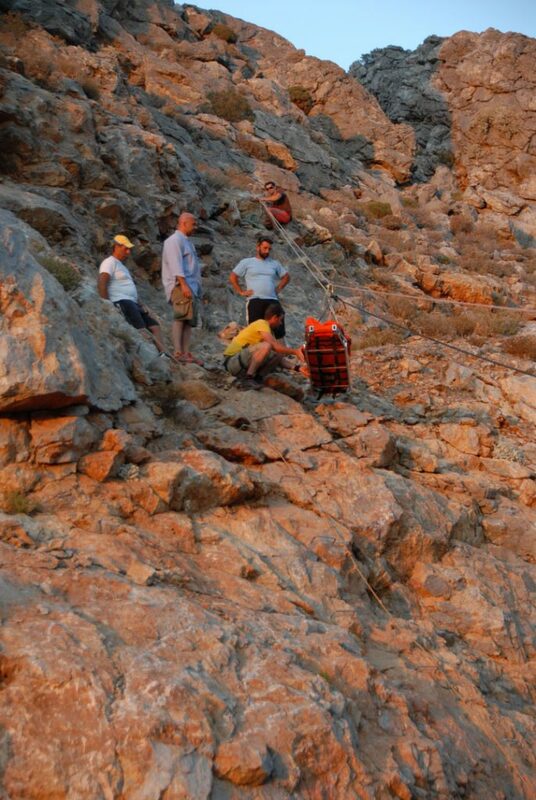 We thank Stavros the boatman who volunteered to take us there for free. 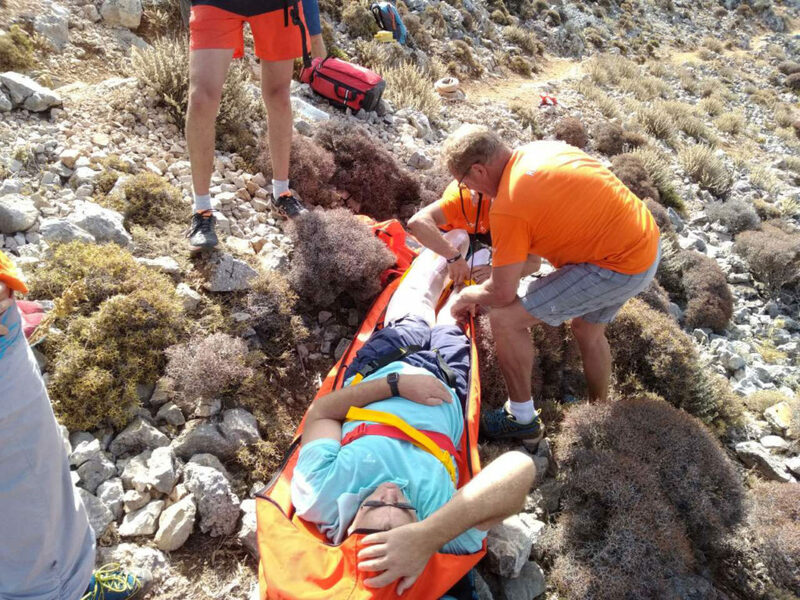 Next call was in the afternoon, at Stankill as Avi already wrote.. leg injury..
We wish to both our friends a quick and painless recovery! 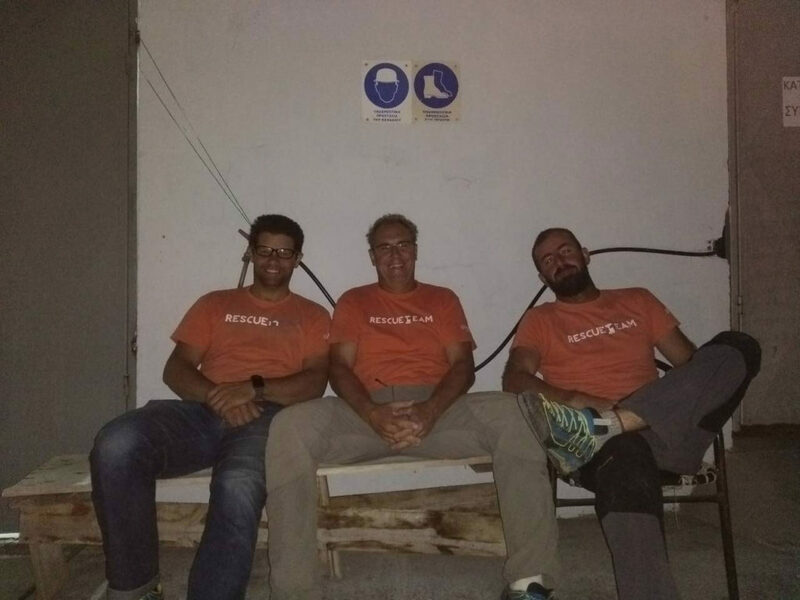 we also thank them for their kind words! 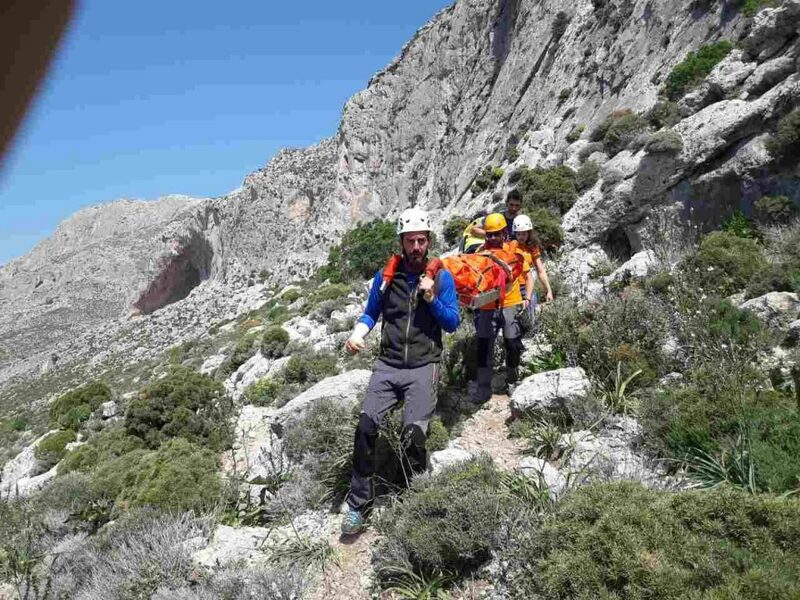 Five not so experienced members of the Team received a basic training to be able to climb in a sport or traditional route, to deal with simple but significant matters of safety and simple mountaineering gear. 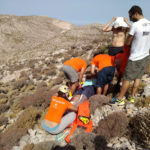 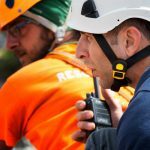 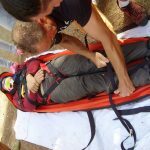 This course was considered obligatory in order to bring members with different levels of experience in a common baseline to be trained as rescuers. 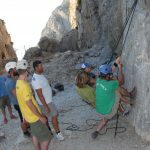 The fees for this course were covered by a fund raised by “The Send” team, a British initiative who create and sell digital topos of climbing routes and raise funds for the local communities. 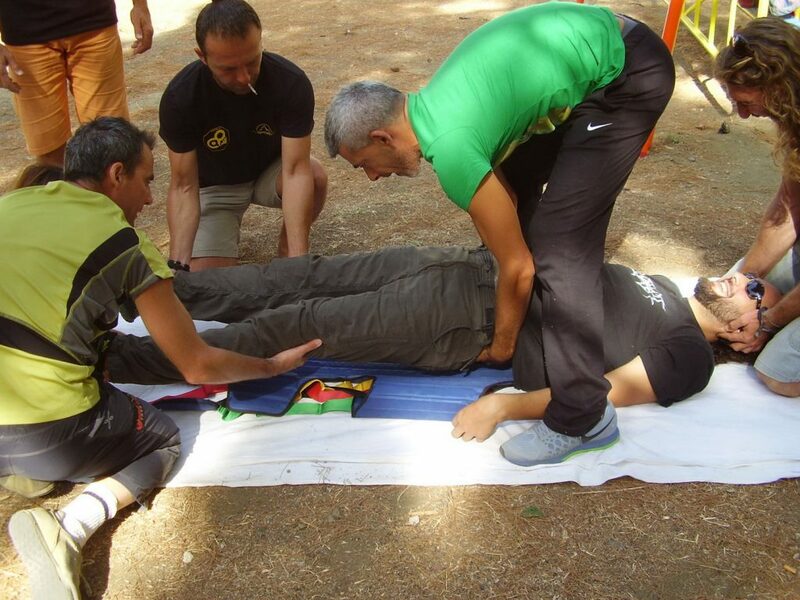 In this course the Team was trained to practice BLS and deal with all the usual cases of traumas on the field. 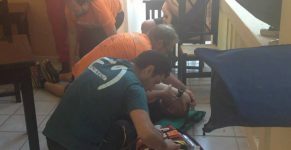 Again, around 10 of our members received this certified seminar. 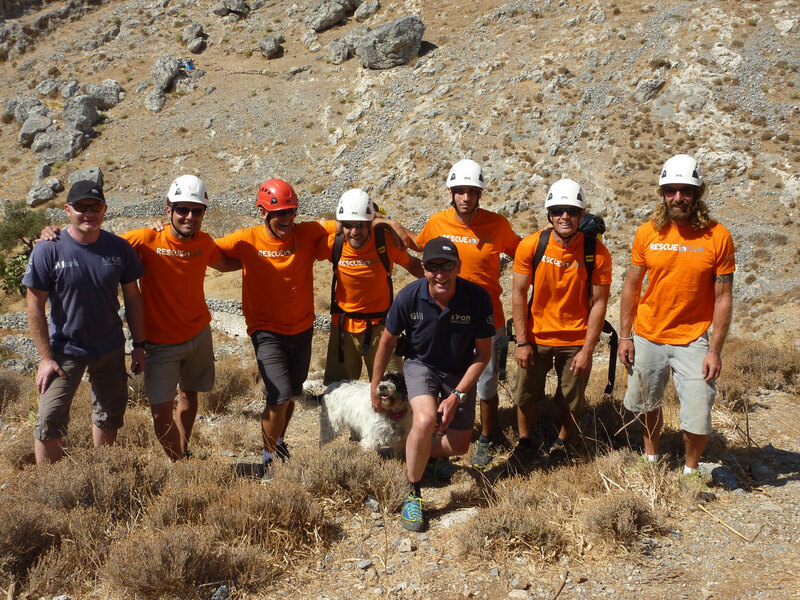 This course was dedicated to Fred, a Swiss climber who died in a tragic accident in Kalymnos in 2014. 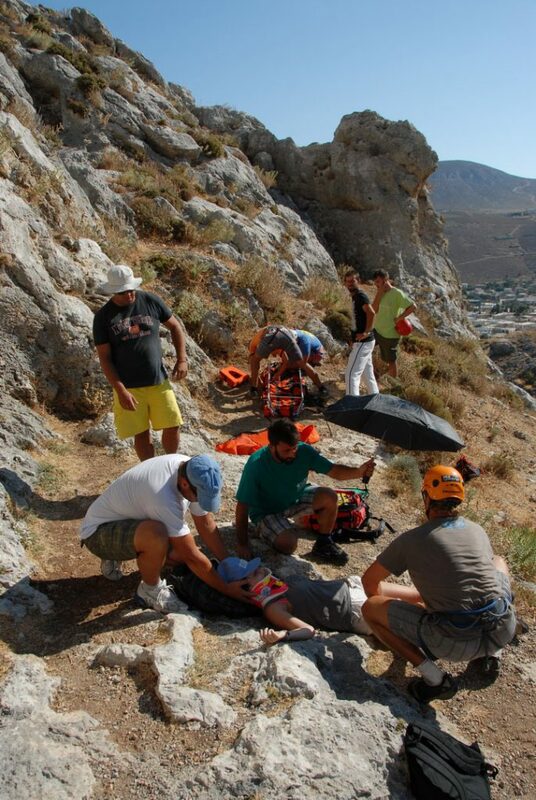 His family and friends raised a big amount for our Rescue Team, which we invested in training in First Aid. 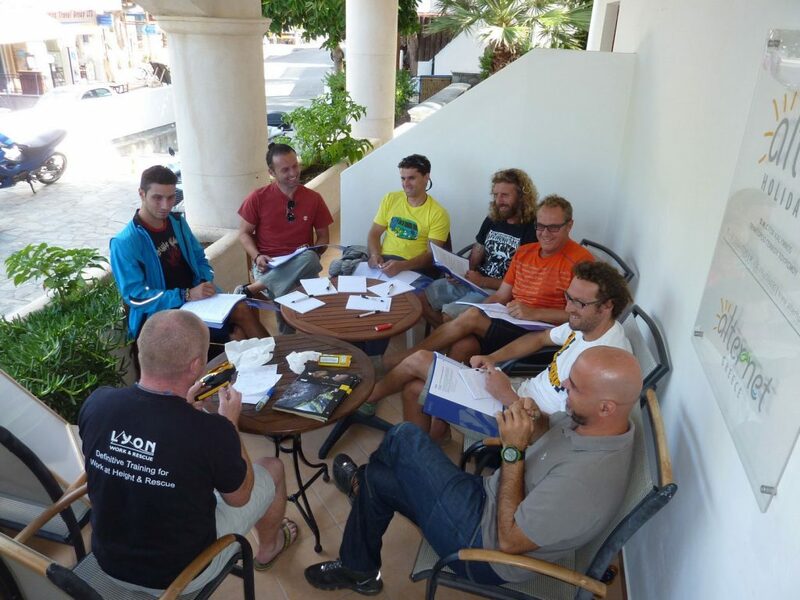 Dr Prestini offered this seminar to the Team for free, in exchange to our hospitality. 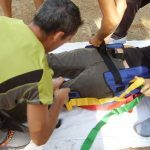 In this seminar 10 of our members got a general idea of the accident scene and how to evaluate it, how to handle a casualty, what are the basic steps to the Preliminary Assessment of the casualty and many more. 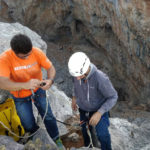 This second training was the formalization of the Team’s collaboration with Wildsport, as their sponsor, as all the equipment used in the training and later at rescue was offered by this business. 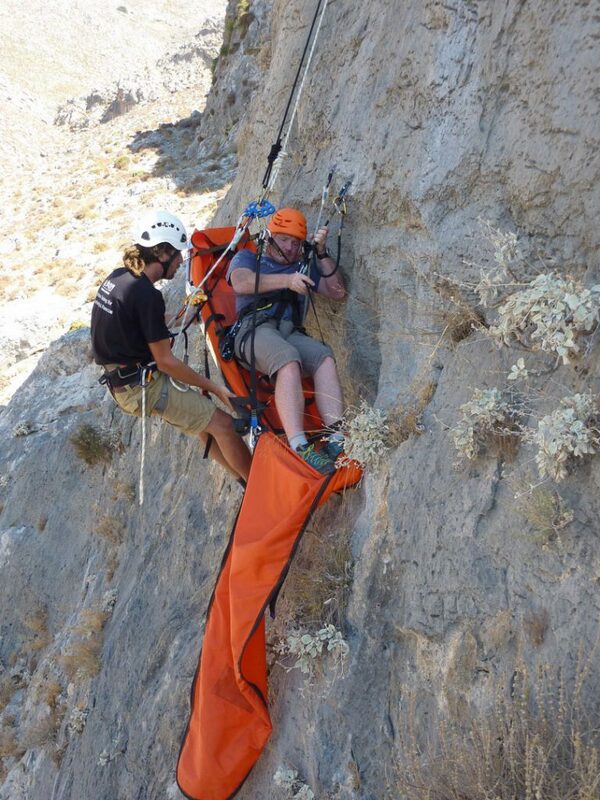 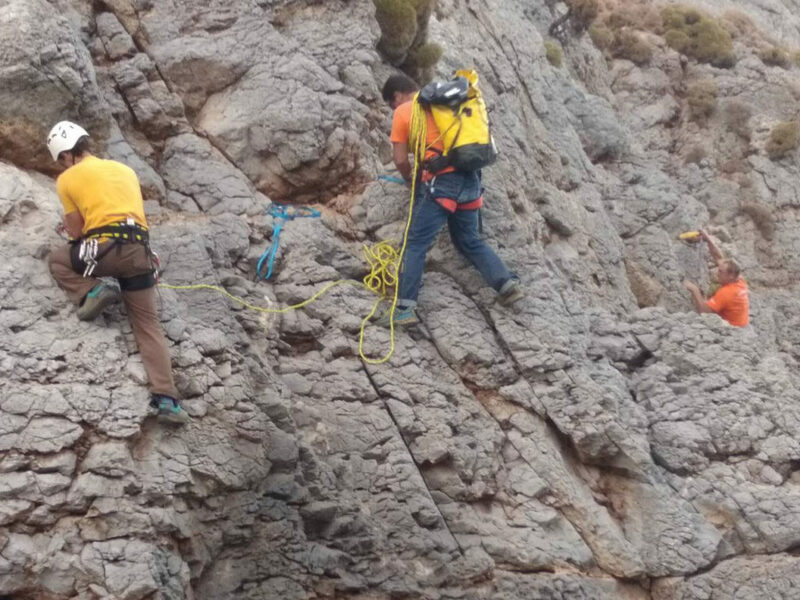 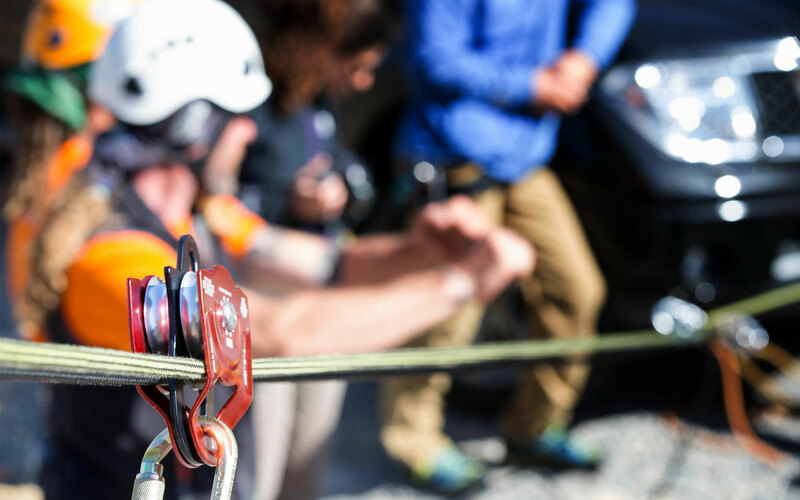 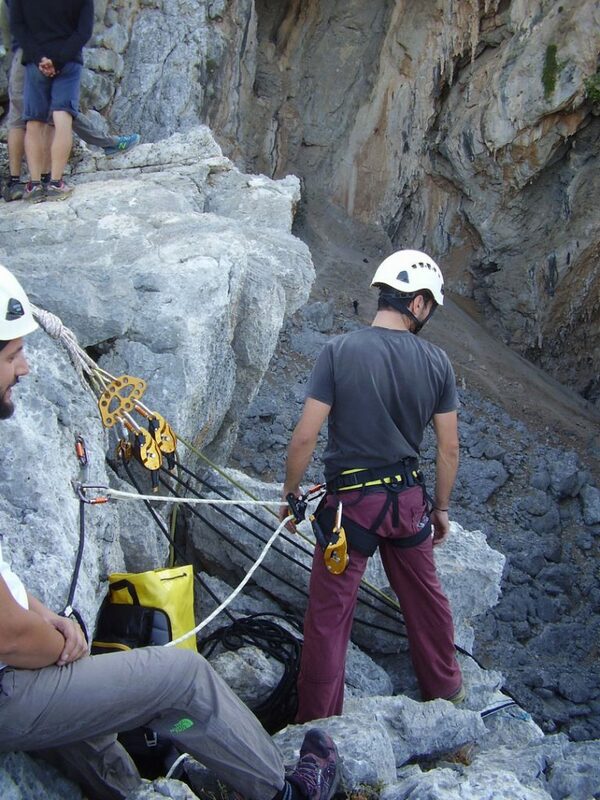 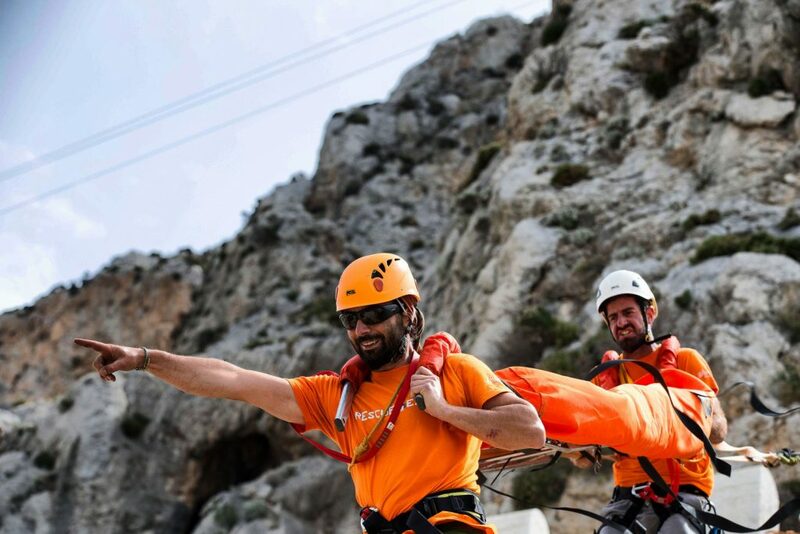 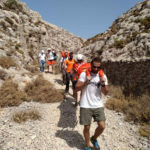 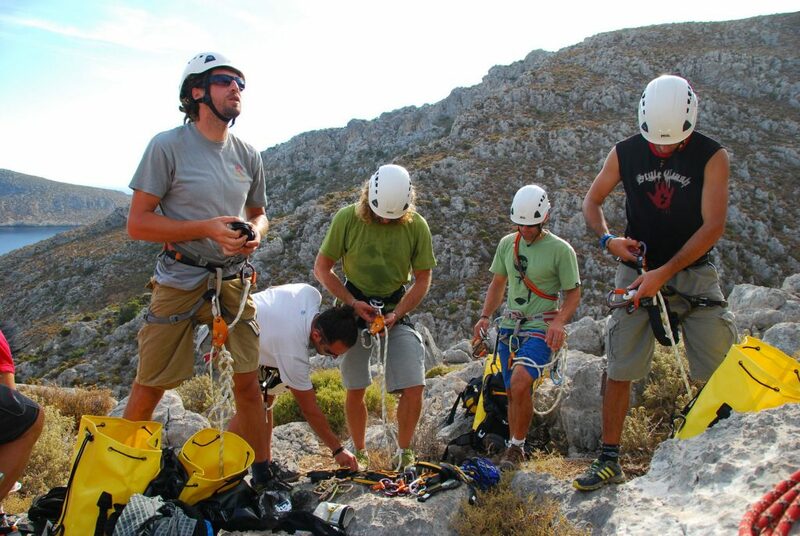 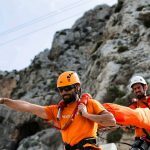 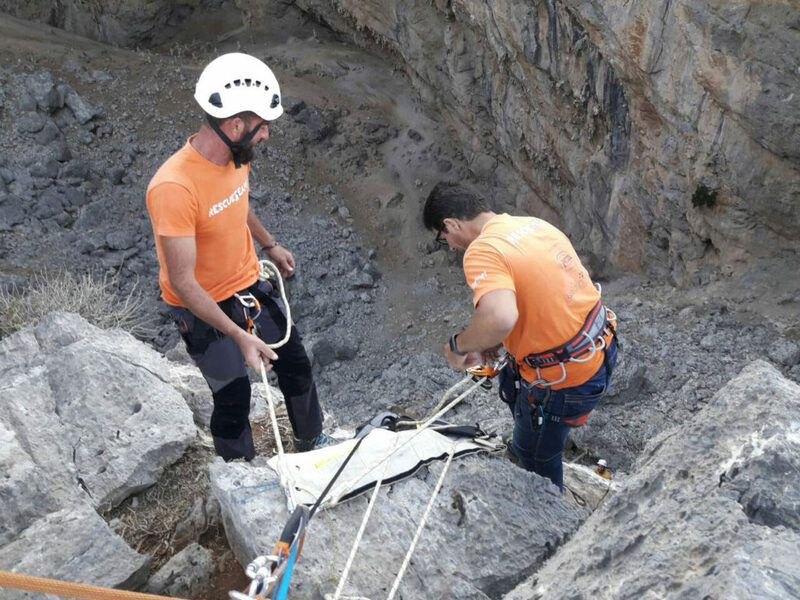 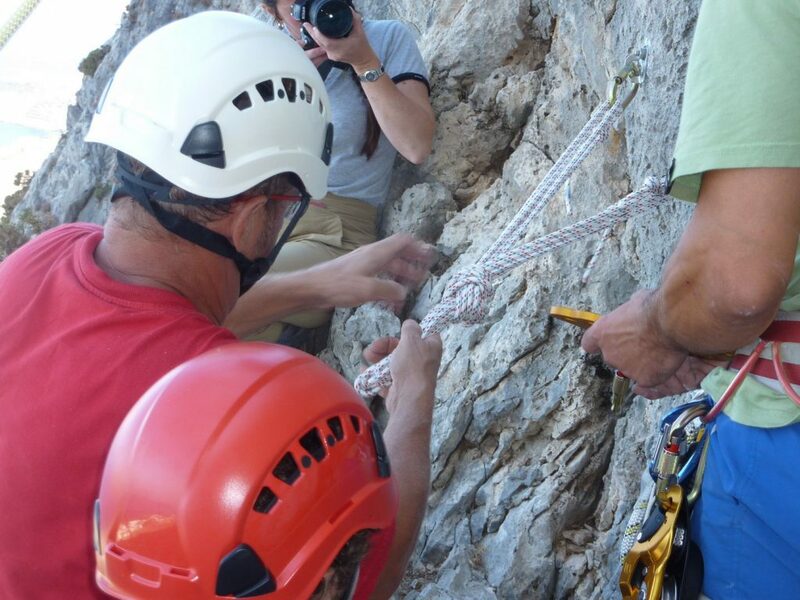 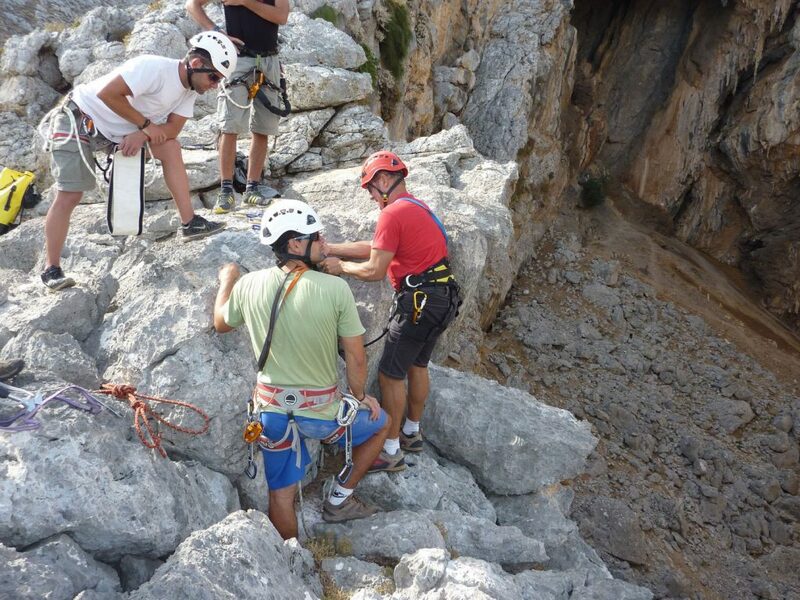 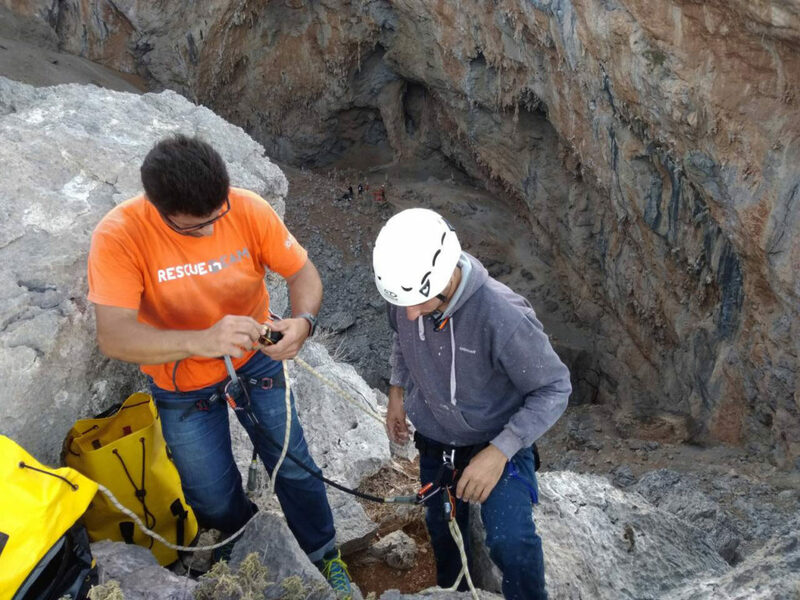 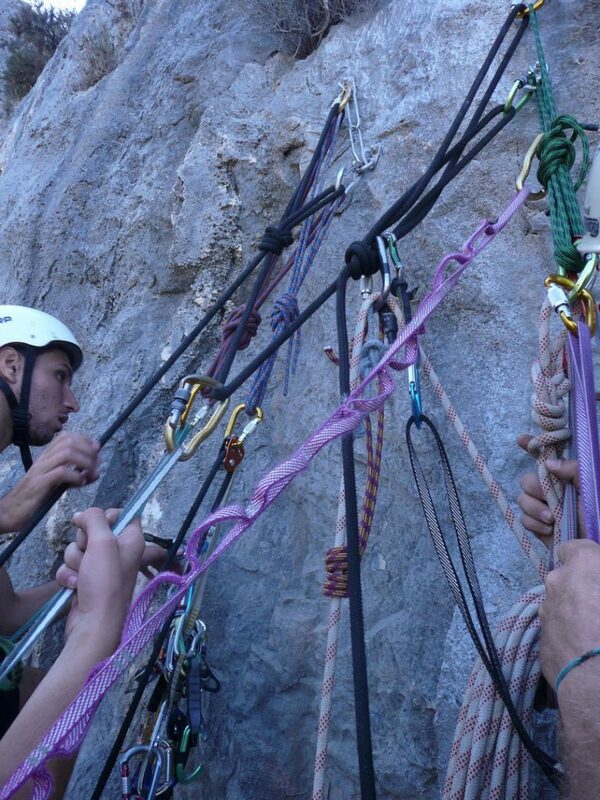 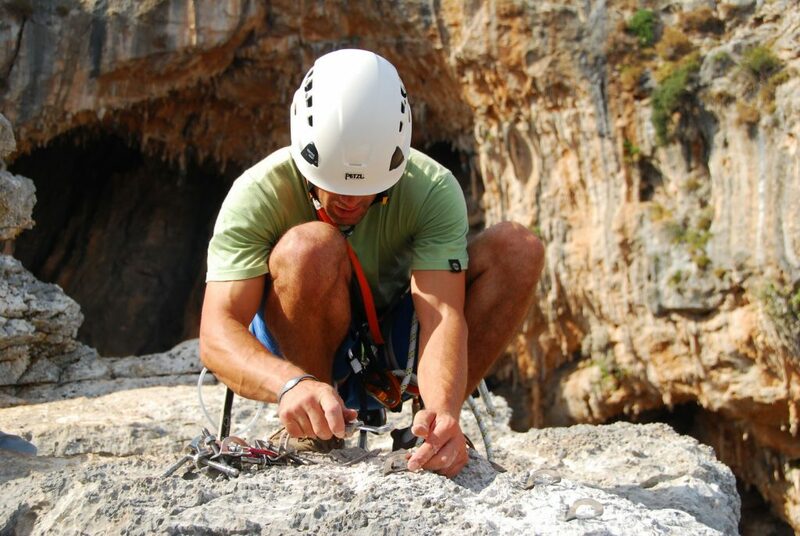 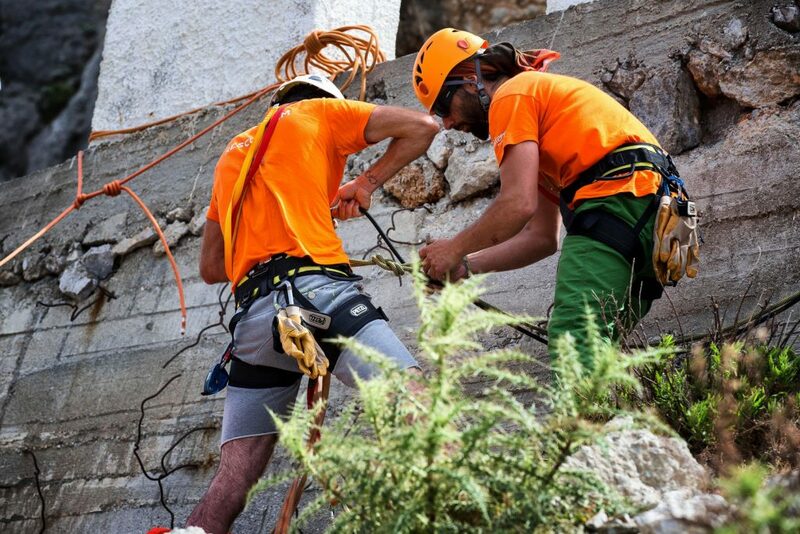 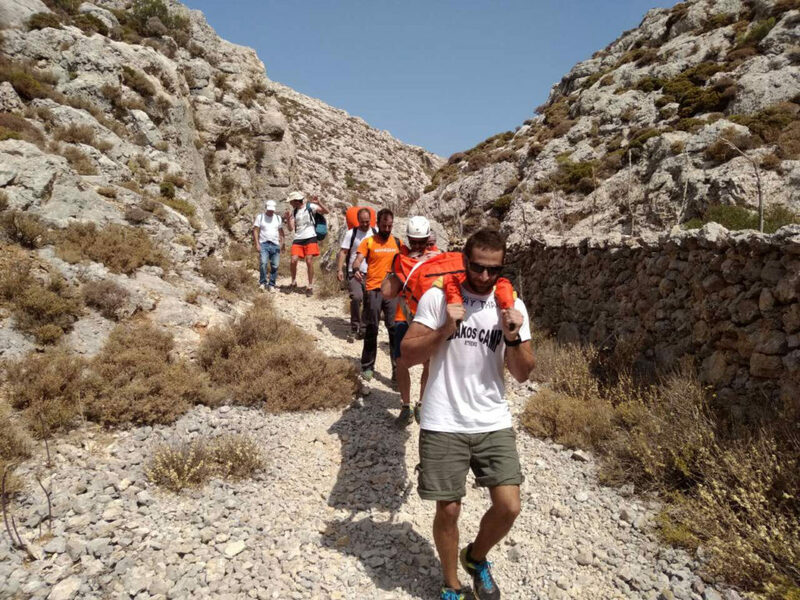 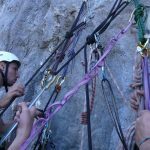 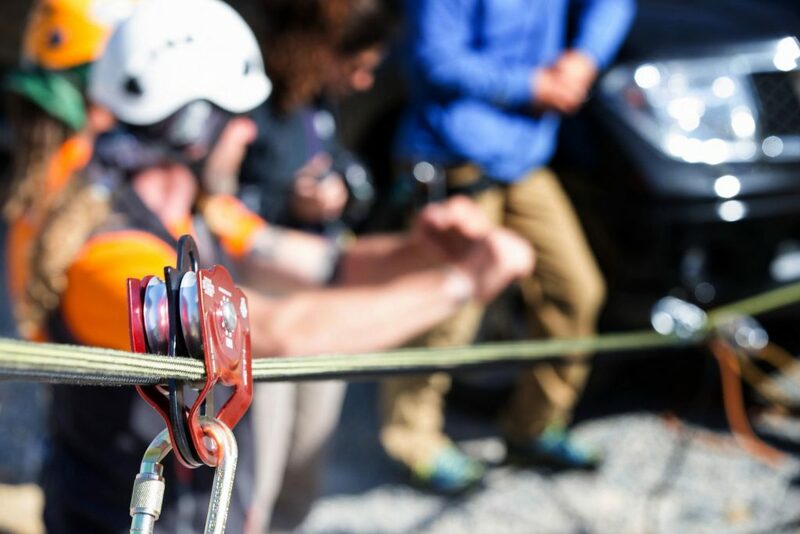 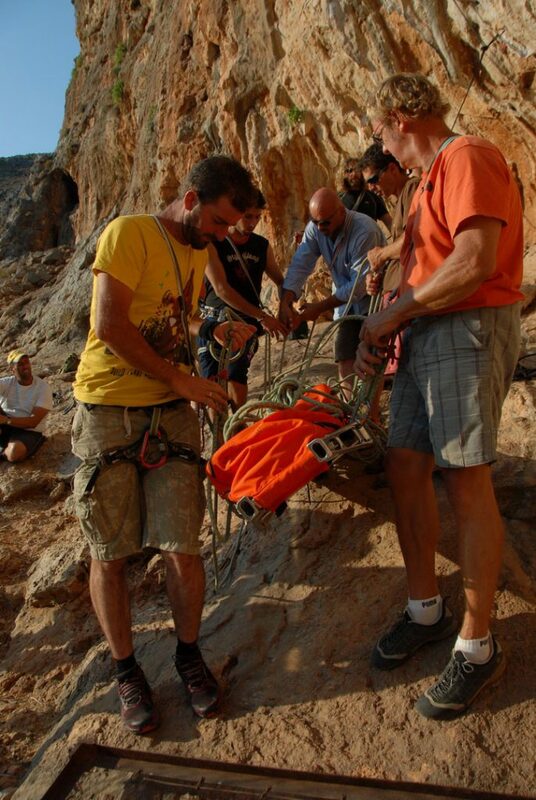 Also this project had the support of Petzl Foundation, who recognized the necessity of a trained team in Kalymnos, so they invited Lyon Equipment to train 6 of our members, forming the first core of the “technical” team inside the Rescue Team. 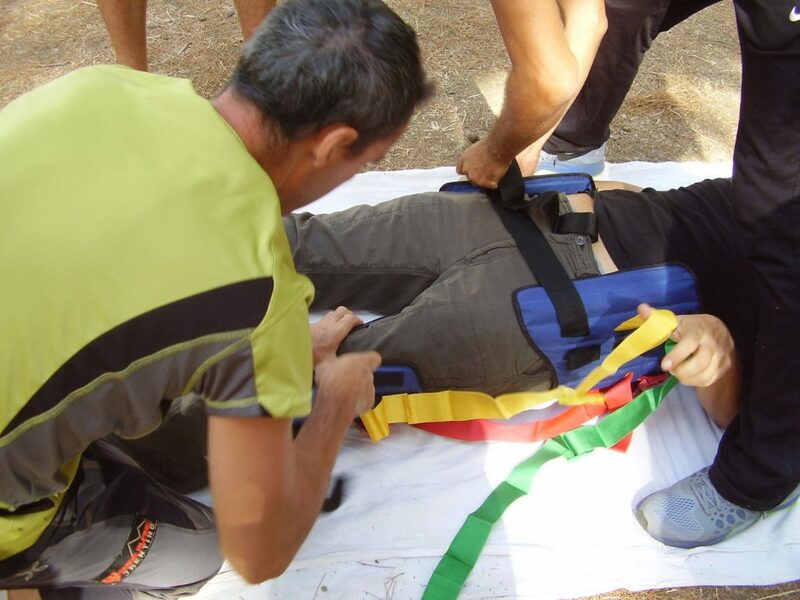 This training was again supported by Alternet (Kalliopi Tsagari) who provided the accommodation and the car for free to the instructors, food to all the participants, and all the other expenses of the course e.g. 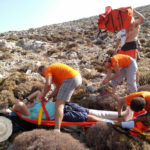 the cost of the sea transfers. 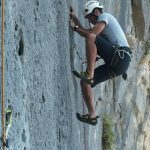 Mr. Antonopoulos has a great experience in mountaineering, climbing and teaching and has a personal interest in rope rescue techniques. 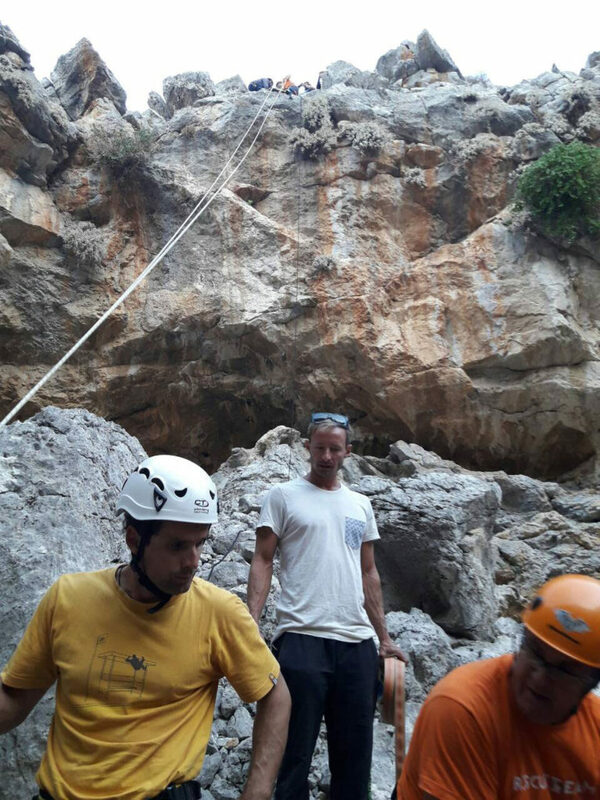 Mr. Antonopoulos provided a very useful first training to 6 members of the team, adjusted to the difficult conditions in Kalymnos. 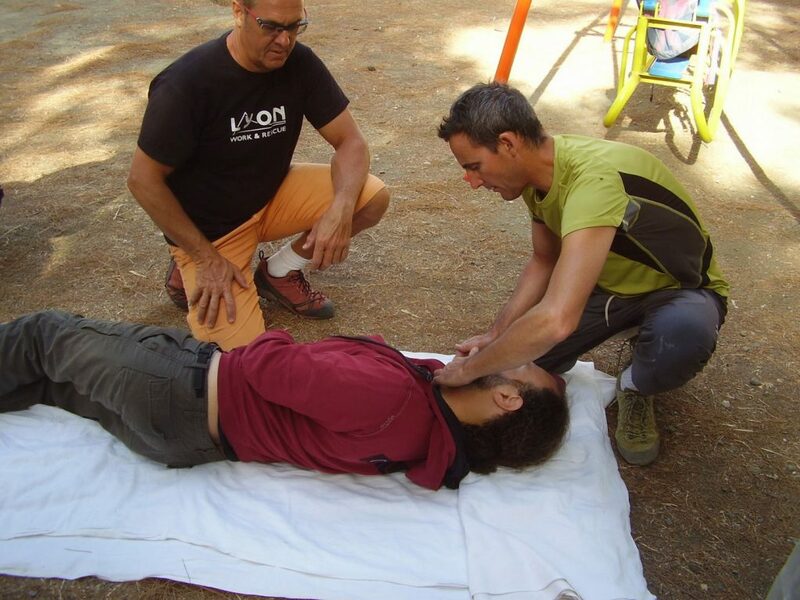 This training was supported by Alternet (Kalliope Tsagari) and Wildsport, who covered all the expenses of Mr. Antonopoulos.